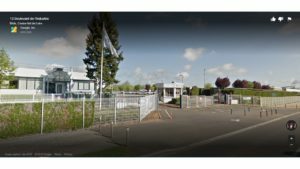 From November 17 to 23, 2018, Dr Chehroudi has been an Invited Speaker at the Delphi Technologies company facility in Blois, France to conduct a presentation on Liquid Atomization, Sprays and Fuel Injection. This course/seminar was originally designed to provide a comprehensive coverage of the subject and targeted to the automotive designers and researchers. However, the philosophy of the course addresses the realities that knowledge of the liquid atomization in areas different from one's focus would be of value as many innovations take place at the interface between disciplines or technologies or carried from one to the other with some modifications. For example, some knowledge of the research and advanced on diesel fuel injection and injector design would be of value to, say, a rocket propulsion engineer working on rocket injector design and vice versa. Likewise, knowledge of diesel injector issues may come handy for those working on gasoline fuel injectors. The seminar was modified to address the current and future needs of the company with emphasis on Gasoline Direct Injection system. R&D managers in the Federal government are responsible for the performance of their divisions and they not only need to be aware of current evaluation methods they also should be able to choose the most appropriate ones for strategic planning and continuous improvement. Considering that in 2018 nearly $553 Billion, or 2.8% of the GDP, is spent on R&D in USA, the selection and use of—not just one—but a portfolio of evaluation methods is of paramount importance. Considering the U.S. Federal Government R&D expenditure of about $117.7 Billion in FY18, and the highly competitive nature of global R&D, it is imperative that R&D program managers involved in the Federal government be fully aware and understand the strengths and short-comings of these evaluations tools and choose the best ones for performance assessment of their R&D activities. Evidence generated by using a variety of R&D evaluation methods would improve program planning and implementation and strengthen the defense of programs with the OMB and Congress. R&D program managers need to know if their R&D activities are done right, focused on the right research areas, created knowledge that generated additional benefits to the nation, stimulated collaborations that affected the nation’s R&D capabilities, and if initiatives have been and will be beneficial. The more R&D managers can show that they offer value for the money, the more credible the case for increased resources become. 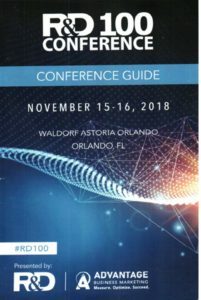 Click to download details of the program: "R&D 100 Conference_ Nov 15-16, 2018"
In this presentation, R&D productivity, efficiency and effectiveness are defined. A concise overview of a number of evaluation methods found to be useful to program managers in Federal agencies will be discussed. 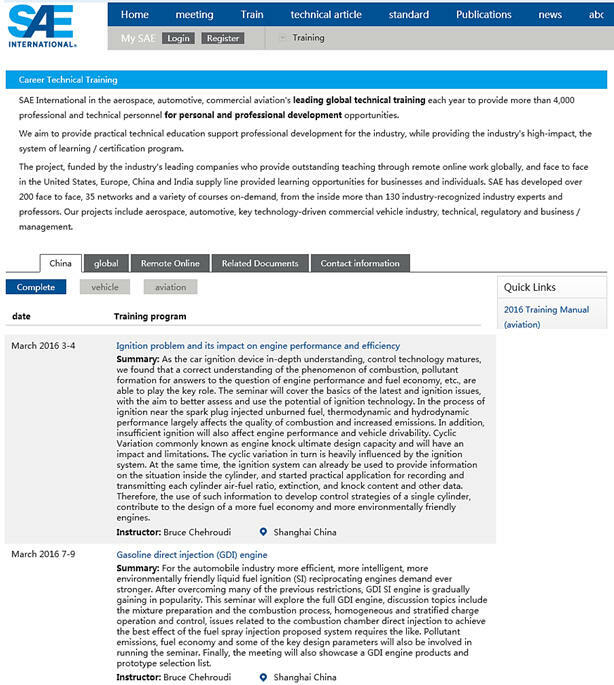 Examples of successful applications by R&D managers in the Department of Energy (DOE), National Science Foundation (NSF) and National Institute of Standards and Technology (NIST) will be offered as case studies.
" The other breakout session, “R&D Evaluation Approaches for Efficiency and Effectiveness,” (2:40 - 3:30 p.m.; Vesey), presented by Bruce Chehroudi, PhD, Vice President of Advanced Technology Consultants, focuses on strategies for R&D managers, particularly those in the U.S. federal government. The U.S. Federal Government R&D expenditure was about $117.7 Billion in FY18. Because of this, and the highly competitive nature of global R&D, Chehroud feels it is imperative that R&D program managers involved in the federal government be fully aware and understand the strengths and short-comings of evaluations tools and choose the best ones for performance assessment of their R&D activities. Evidence generated by using a variety of R&D evaluation methods would improve program planning and implementation and strengthen the defense of programs with the OMB and Congress. " On August 6-8, 2018, Dr. Chehroudi was an invited speaker by the Society of Automotiv e Engineers, to conduct a seminar on Gasoline Direct Injection (GDI) in Troy, Michigan. This is a highly updated version of the seminar introduced in 2010 which, in view of recent market share of GDI Engines, has become a very popular professional seminar to attend amongst R&D/application engineers, researchers, technical managers, regulators, and policy makers. The objective of the seminar is to present sufficient foundational information on combustion and emission of pollutants for GDI engines in order to elevate attendee's background knowledge for an intelligent application and comfortable understanding of the existing body of knowledge in direct injection spark ignition engines. On August 3, 2018, Dr Chehroudi had a meeting with Dean Bill Maurer, Professor of Anthropology and Dean of the School of Social Science at University of Califronia at Irvine. Dean Maurer is a Professor of Anthropology, Law and Crimonology, Law and Society and Director of the Institute for Money, Technology, and Financial Inclusion. Dr. Chehroudi and Dean Maurer discussed areas of mutual interest such as history of money, cryptocurrency, blockchain with the objective of exploring areas for possible future collaboration. 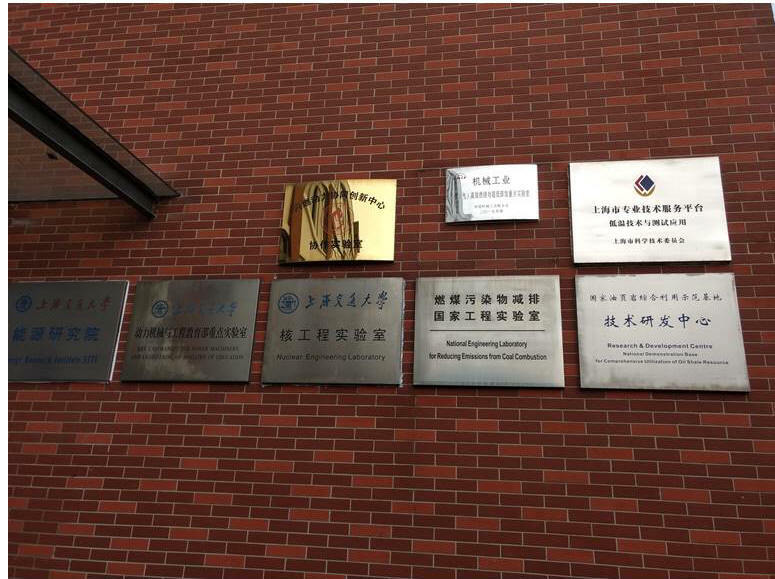 On May 31, 2018, Dr Chehroudi was invited to visit Prof. Dong Han, Associate Professor and Assistant Dean of the School of the Mechanical Engineering, Institute of Internal Combustion Engine, at the Shanghai Jiao Tong University (SJTU) in Shanghai, China. The SJTU is ranked number 11 as "Best Global Universities for Engineering" by the US News in 2018 with 37,288 students, 3,016 academic staff, and 3,606/4,100/1,043 BA/MS/PhD degrees awarded each year. 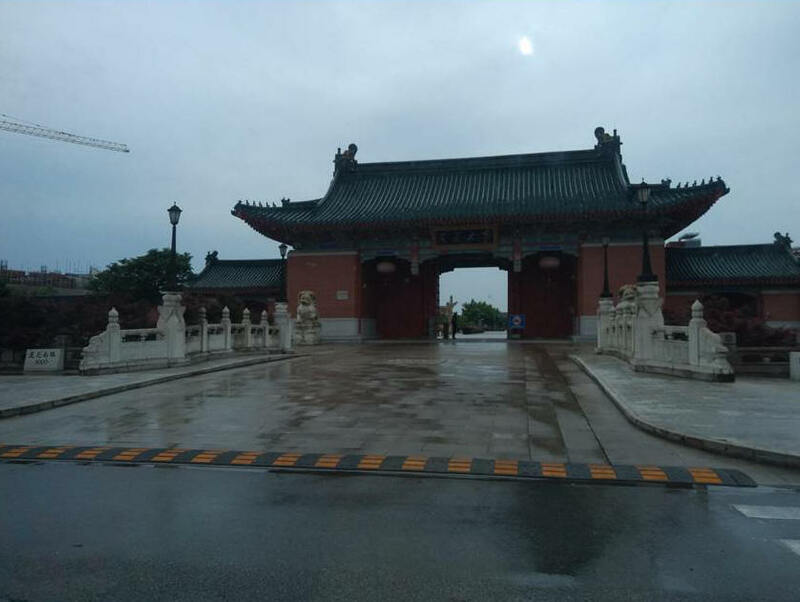 Dr Han has received a MS degree from University of Michigan at Ann Arbor, and a PhD at the Shangahi Jiao Tong University. He has also spent two years at Princeton University working with Prof. C. K. Law on a number of combustion related projects. Dr Chehroudi was given a tour of the department, graduate students offices and the combustion laboratories including the Internal Combustion Lab. A number of research projects are going on in areas of HCCI engine and Low Temperature Combustion, fuel studies, and in general emission of pollutants and performance improvements. Dr Han and Dr Chehroudi has a number of conversations about their experiences at Princeton University and other topics including future collaborations in research and education. 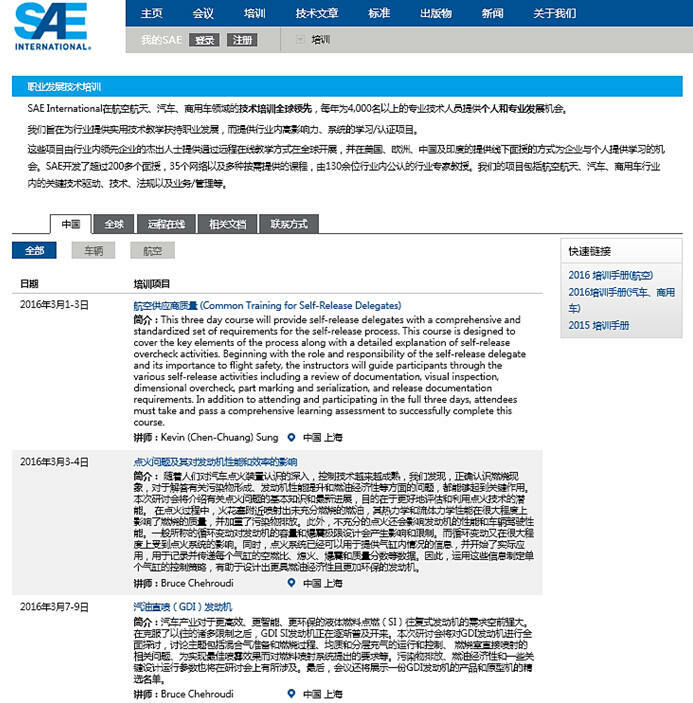 Dr Chehroudi is an invited speaker by the Society of Automotive Engineers in Shanghai, China to present lectures on Gasoline Direct Injection (May 28-30, 2018) and Ignition Issues and Their Impact on Engine Performance, Efficiency and Emission (May 24-25, 2018). Attendees are from corporations, government, and universities. There will be several meetings with top executives and university leaders to discuss areas of mutual interest and collaborations. On May 16, 2018, Dr Chehroudi has submitted a ~$600,000 proposal to the Department of Energy to further develop his two ground-breaking patents in the hot area of nanotechnology. These patents were filed thirteen years ago with numerous applications from automotive to medical industries. They are a synergy between nanotechnology, chemical reaction, and optics. He further developed them during the years working at Air Force Research Laboratory (AFRL) and later through SBIR funds. 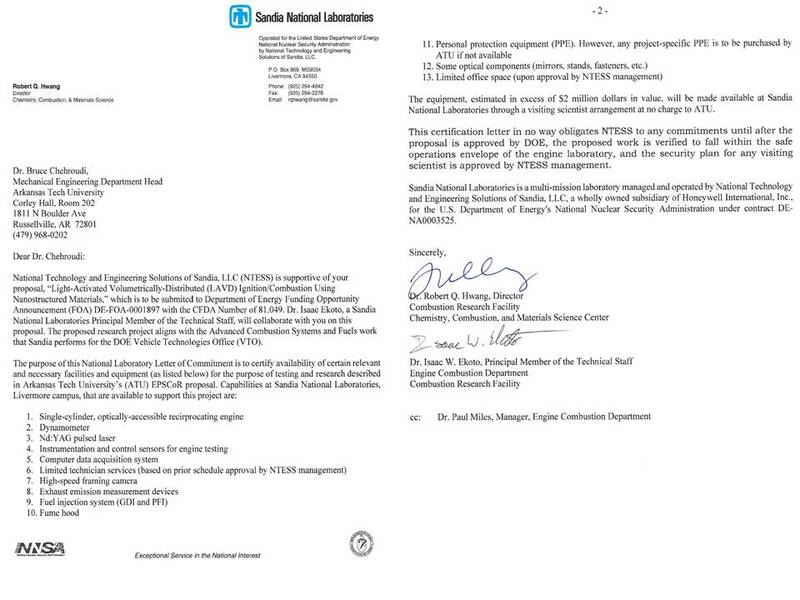 For the last month, virtually all weekends Dr Chehroudi was occupied preparing this 3-year $600,000 proposal with over $2 million equipment support and commitment from SANDIA Combustion Research Facility (CRF). SANDIA-CRF is the top engine combustion research laboratory in the world. Many well-known and respected scientists/researchers in the world have some activity with CRF at a time in their careers. The Letter-of-Commitment is only written if the project is judged to be innovative, ground-breaking, has the potential to become a disruptive technology, and aligned with what CRF is currently researching. Dr Ehsan Hosseini assisted Dr Chehroudi in this proposal. 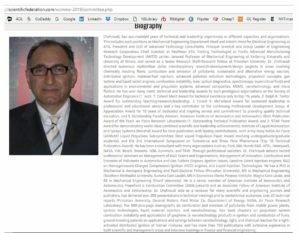 In early 90s, Dr Chehroudi has worked with SANDIA CRF for over five years on Direct Injection Stratified Charge (DISC) engine when he was at Princeton University and through a consortium consisting of SANDIA_CRF, Department of Energy, Los Alamos Laboratory, General Motors Research Laboratory, and Princeton University. Potential Application of Photo-thermal Volumetric Ignition of Carbon Nanotubes in Internal Combustion Engines. 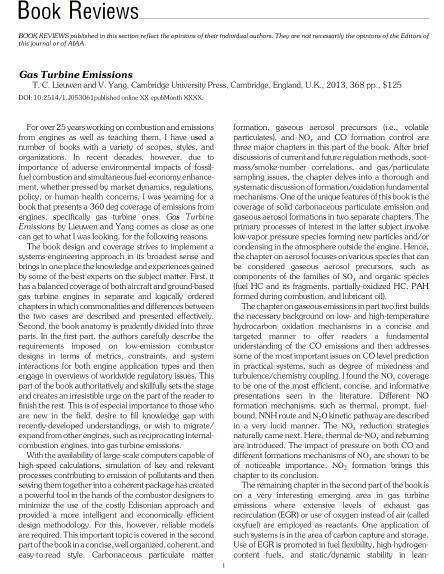 Statement of the problem or situation that is being addressed: To simultaneously minimize the fuel consumption and the emission of regulated pollutants from reciprocating automotive internal combustion engines, the intensive R&D efforts in US on in-cylinder combustion improvements have focused on the low-temperature gasoline combustion (LTGC) or homogeneously-charges compression-ignition (HCCI) engines, which are based on in-cylinder volumetric auto-ignition and combustion of the fuel/air mixture. Research has shown promising potentials of these engines for contributions towards the stringent fuel economy regulations on the fleet-averaged fuel consumption targets to be met both in US and in Europe. However, a technologically and economically viable start-of- combustion control (or controlled auto-ignition) has been the main barrier for such advanced combustion engines. This proposal suggests an innovative, nanotechnology-based very-low-input-energy optical approach to address this important problem. Essentially, this is a synergy between light, chemical reaction, and nanotechnology. 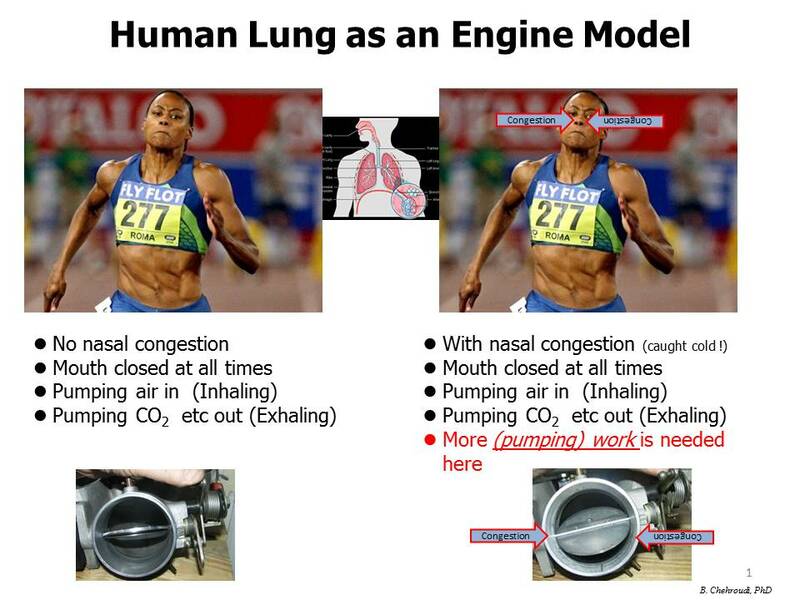 Statement of how this problem or situation is being addressed: The problem of precise control of the volumetric start-of-combustion in each engine cycle (i.e., controlled auto-ignition) is addressed through a serendipitously-found synergy between nanotechnology, light energy, and chemical reaction. Specifically, a sufficiently-large number of suitably-selected nanotechnology-based ignition agents (IA) are mixed, as an additive, to the gasoline fuel which are then fluidized upon full vaporization of in-cylinder liquid fuel droplets to act as volumetrically-distributed ignition sources. Upon exposure to a simple pulsed light source (such as an ordinary low-energy camera flash), these in-cylinder volumetrically-distributed nanostructured IAs are shown to ignite (i.e., controlled auto-ignition) and lead to a volumetric combustion of the fuel-air mixture. This innovative control of the start and subsequent evolution of the volumetric combustion, addresses an important technological barrier for the LTGC / HCCI engines. Project Objectives: While the feasibility of the light-activated volumetrically-distributed (LAVD) ignition under a lean gaseous fuel/air mixture in a constant-volume combustion chamber has already been demonstrated, the main objective of this proposed research is to demonstrate feasibility and performance of the LAVD ignition method in a single-cylinder 4-stroke reciprocating internal combustion (IC) research engine at Sandia Combustion Research Facility. Initial optical diagnostics such as laser-induced fluorescence (LIF) and heat release analysis should provide fundamental understanding on ignition and combustion process. Commercial applications and other benefits: This innovative ignition method removes an important technological barrier towards development and implementation of the environmentally cleanest, and simultaneously, most efficient reciprocating internal combustion engine using fossil fuels. The high efficiency of this engine addresses the economic aspect of the public life and the positive environmental impacts contribute towards the public health. 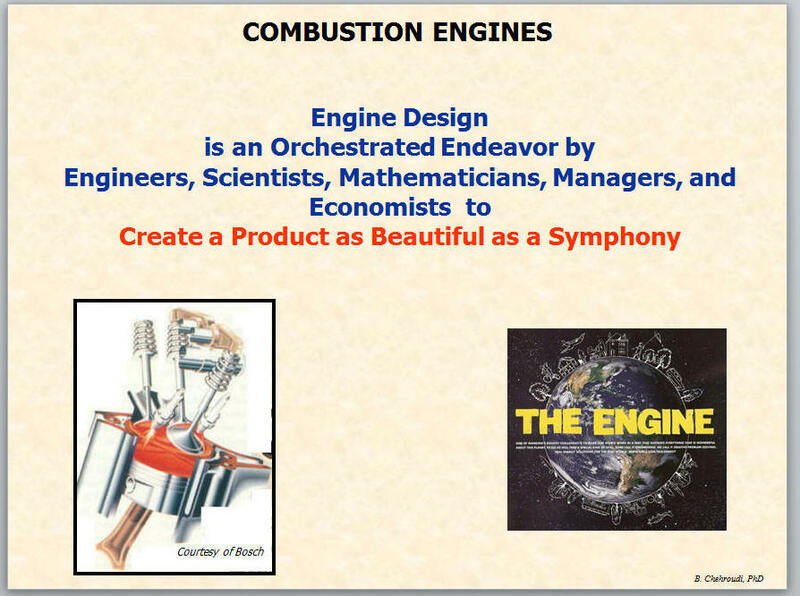 On May 14-16, 2018, Dr Chehroudi was an invited speaker in Detroit, Michigan, by the society of Automotive Engineers and presented series of lectures to engineers, designers, researchers, R&D managers on combustion and emission of pollutants from engines. 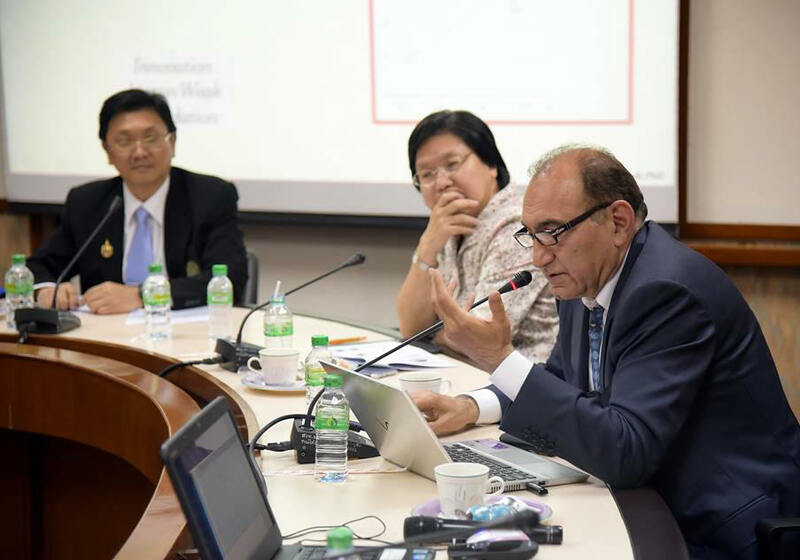 Topics such as low-temperature combustion, homogeneous-charged spark ignition, HCCI, SpCCI, auto-ignition, knock, alternative fuels, and key factors that affect fuel efficiency and emission of regulated pollutants were amongst the topics discussed. Dr Chehroudi also also presented his patented and ground-breaking work on Light-Activated Volumetrically-Distributed ignition using nanostructured materials for controlling autoignition in HCCI engines. Dr Chehroudi is a member of the Organizing Committee for the 2nd World Congress on Mechanical and Mechatronics Engineering to be held in Dubai, UAE, from April 15 to 17, 2019. This conference is now an established event, attracting global participant’s intent on sharing, exchanging and exploring new avenues of Mechanical and Mechatronics Engineering and related research and latest developments. The event will have 5-6 world level (Highly cited class) plenary speakers, established Keynote speakers, active Invited speakers and fresh contributed speakers. In addition, variety of poster presentations along with workshops and special sessions would be interested in audience.to promote quality research and real-world impact in an atmosphere of true international cooperation between scientists and engineers by bringing together again the world class researchers, International Communities and Industrial heads to discuss the latest developments and innovations in the fields of Mechanical and Mechatronics Engineering. Atomization of liquids is at the heart of operations of many of the devices we use on a daily basis. In the aerospace industry, the engine thrust, efficiency, and the emission levels are directly related to the performance of the liquid fuel injector designs. For this reason, R&D activities in this area have intensified in the past two decades in a quest to design and operate efficient and low-emission gas turbine engines. It is imperative then that individuals involved in research, design, and operation have the requisite knowledge and training to choose intelligent and innovative approaches when it comes to liquid fuel nozzle and its optimum performance. it from this course. Additionally, this course provides adequate background for engineers and managers in contact with those directly involved in the fuel nozzle systems. Therefore, this experience prepares the attendees for a more efficient and intelligent communication in an interdisciplinary technological environment. The course is also of interest to academicians wishing exposure to the field and those engineers active in development and applications of software, modeling in-cylinder injection combustion and emission processes. Dr. Chehroudi will be a member of the Organizing Committee and a Keynote Speaker at the Mech Aero 2018 Conference in Atlanta, Georgia (Nov 7-8, 2018). 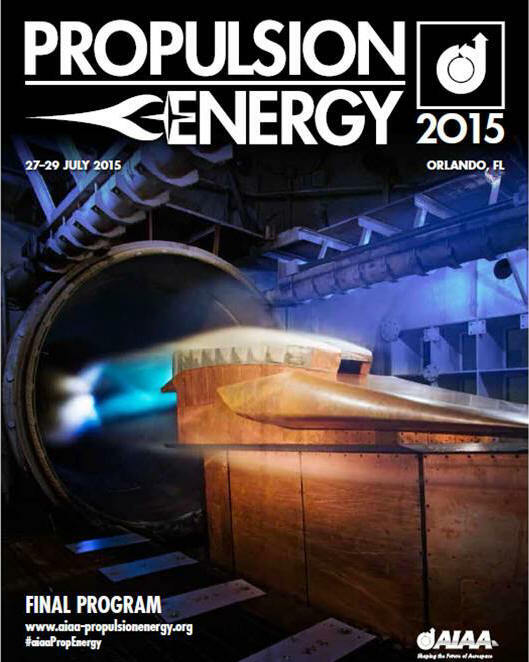 Dr Chehroudi will be giving a presentation titled "Supercritical Fluid and Applications in Propulsion Systems". Dr. B. Chehroudi is a member of the Organizing Committee of the 2018 Asia Conference on Mechanical Engineering and Aerospace Engineering (MEAE2018). The conference will be held during the June 23-25, 2018 at China University of Geosciences (Wuhan) in Wuhan, China. The MEAE 2018 will be an internationally renowned forum for researchers, practitioners, and educators to present and discuss the most innovations, trends, experiences, and challenges in the fields of Mechanical Engineering and Aerospace Engineering. It will bring together experts from academia and industry to exchange the latest research results and trends, and their practical applications in the aforementioned areas of Mechanical Engineering and Aerospace Engineering. This will be accomplished through the following three modes of communications: Keynote presentations, Parallel sessions, and poster sessions. On Monday, Dcember 18-20, 2017, Dr. Chehroudi has delivered a 3-day seminar on Combustion and Emission of Pollutants from Automotive Engines at the Society of Automotive Engineers facility in Troy, Michigan. Thorough and in-depth understanding of the thermodynamics, gas dynamics, and combustion chemistry is at the heart of the intelligent approach towards control of the engine combustion and emission of pollutants. To this end, Dr. Chehroudi's seminar covers key aspects of the combustion of the fuel air mixtures for best fuel economy at the lowest emissio of the harmful/regulated pollutants. 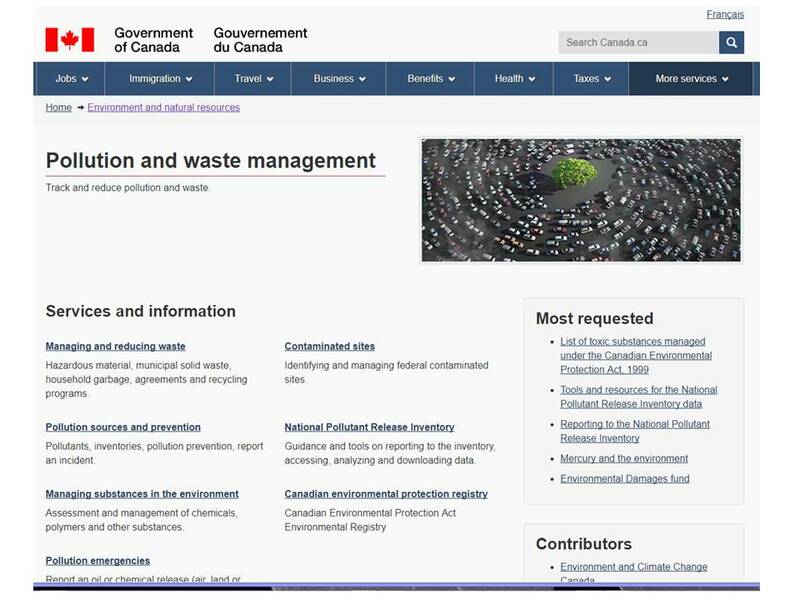 _ Toyota Technical Center USA, Inc.
On Tuesday, November 22, 2017, Dr. Chehroudi was invited to Environment Canada, Quebec, to conduct a three-day presentation. Dr. Chehroudi has presented his views on the combustion in gasoline-fueled IC Engines and emission of pollutants combustion efficiency, emission of pollutants, and performance of automotive engines. Below is a partial list of topics discussed during the presentation. Presentation was followed by a consulting session exploring areas of mutual interest and future collaboration. -Physical meaning of "specific heat"
Dr Chehroudi was invited to conduct a 3-day seminar on in-cylinder processes (liquid atomization, vaporization, mixing, liquid spray-flow interactions, chemically reactive flows, flame-turbulence interactions, pollutants formations, etc) in Gasoline Direct Injection (GDI) engines that affect efficiency, performance and tailpipe emission of pollutants. 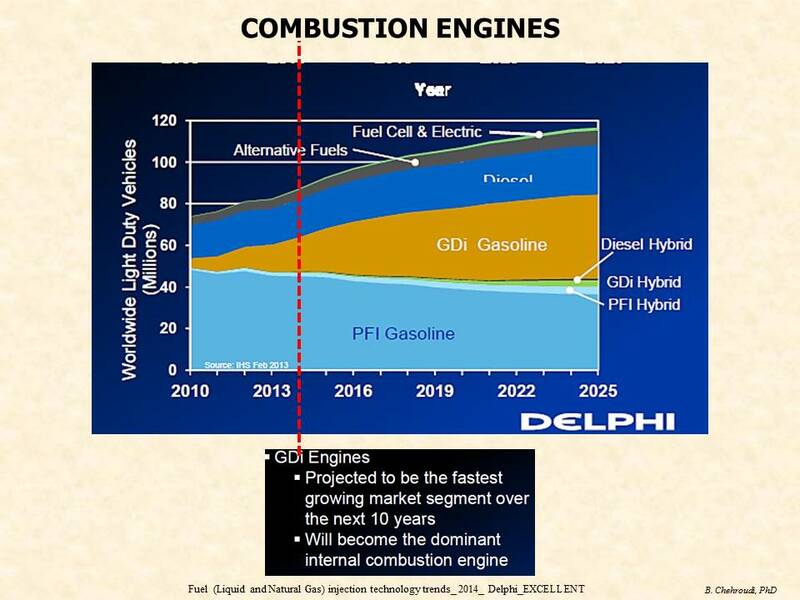 The GDI engine is projected to be the fastest growing market in the next 10 years and will become the dominant internal combustion engine by 2025. EPA's 2025 projection of the fuel economy is at the 54.5 mpg level. Downsizing and turbocharging is one approach towards this level of fuel economy along with host of other combustion strategies such as stratified charge operation (Sept 11-13, 2017). Dr. Chehroudi and his collaborators (Professors A. P. Carlucci, A. Ficarella, D. Laforgia, and researcher L. Strafella) from the University of Salento were invited to contribute a chapter in a book titled "Carbon Nanotubes - Recent Progress". The book is edited by M. M. Rahman and A. M. Asiri (ISBN 978-953-51-5707-6). The chapter title is "Potential Application of Photo-Thermal Volumetric Ignition of Carbon Nanotubes in Internal Combustion Engines". It will be published in INTECH Open Science / Open Minds (https://www.intechopen.com/ ). 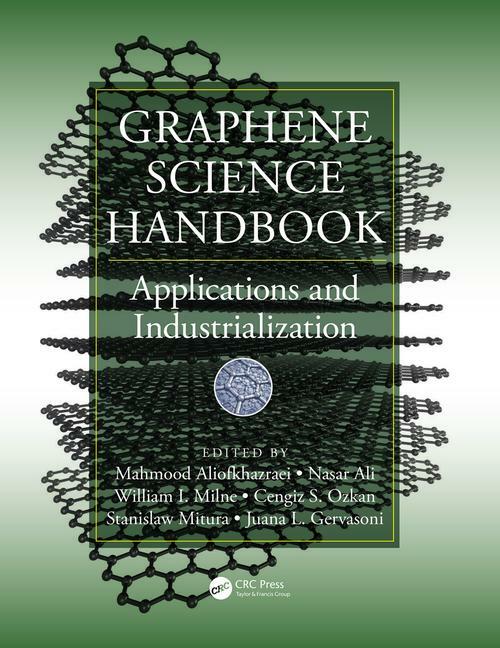 Other topics covered in the book are Nanocomposites, Carbon, Chiral, Charcoal, Carbon based sensors, Nanotubes, Conductors, Metallic tubes, Nano-structural materials, Fibers, Carbon related material, Electrochemistry, Catalysis, Mechanical property, Nanowires, Composites, Percolation, Mediators, 3D materials, Modelling, Energy conversion, Splitting, 3rd generation, Solar cells, Supercapacitor, Fabrication, Nanocarbon, Graphitic carbon, Core-shell study, Nanotechnology, Electronic properly, Conductivity, Nanobuds, Peapod, Silicon (Aug 27, 2017). The potentials and characteristics of a new ignition system for air-fuel mixtures are discussed. This ignition method (referred to as photo-thermal ignition) is based on light exposure of Multi-Walled Carbon Nanotubes (MWCNTs), bonded with other nano-Structured Materials (nSMs), (collectively referred here as “nanoignition agent”), using a low-consumption camera flash. Here, ferrocene, an organometallic compound, was used as the nSMs. 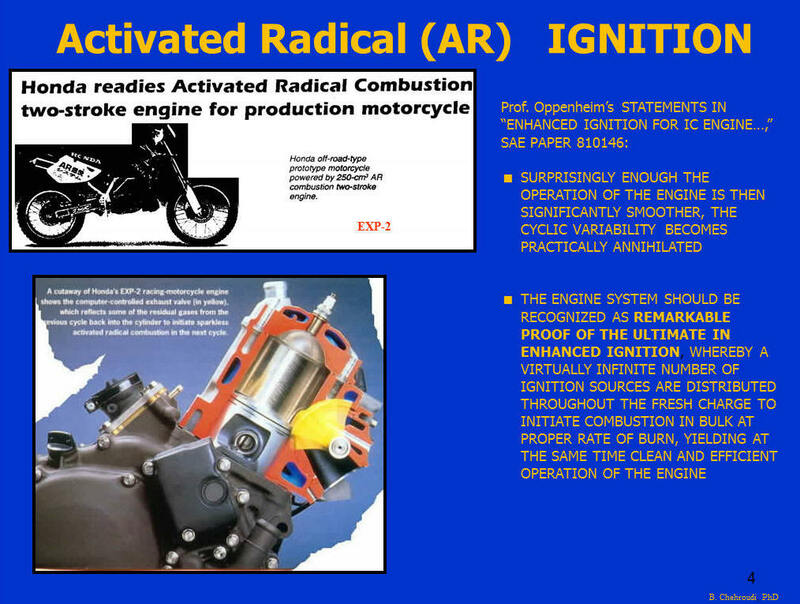 Results from, and benefits of, this new ignition method are compared with a conventional spark-plug-initiated ignition used in automotive engines. The main objective of this research is to demonstrate ignition feasibility of mixtures of both gaseous and liquid fuels with air under high pressures using the photo-thermal ignition (PTI) phenomenon. Specifically, the ignition and subsequent combustion characteristics of gaseous air-fuel mixtures at different air-fuel ratios were investigated by means of light exposures of nano-ignition agents (nIAs) after they are mixed with air-fuel mixtures. Analysis of the acquired data showed that for the range of air-fuel ratios tested, the photo-thermal ignition with a flash lamp resulted in a higher peak chamber pressure when compared to those obtained with a conventional spark ignition system. Heat release rate analysis showed that shorter ignition delays and total combustion durations for the Photo-thermal ignition are achieved. Comparative percent reduction of these values for photo-ignition ranges from 20% to 50% for LPG and methane, whereas values up to 70% were observed for the hydrogen. The positive impact of the photo-thermal ignition appears to be primarily at the ignition delay period of the combustion. 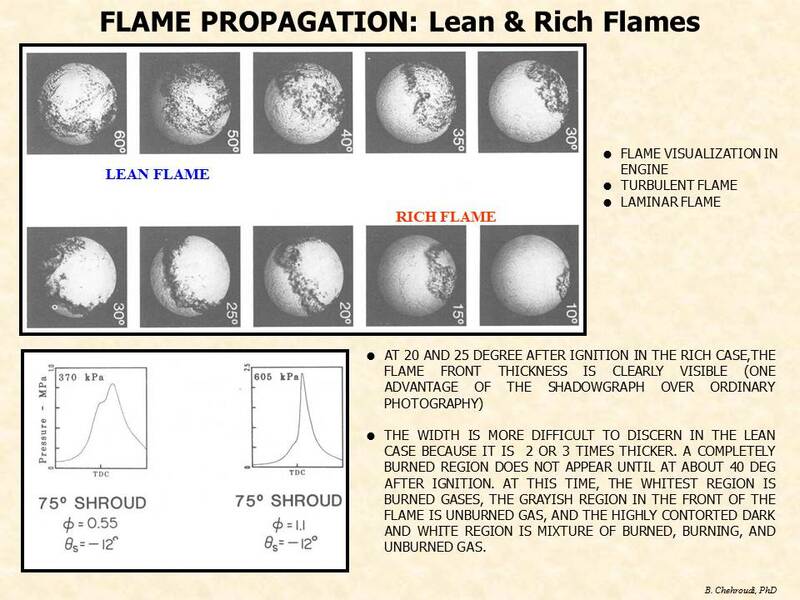 With liquid fuels, photo-thermal ignition was capable to ignite mixtures as lean as a relative air-fuel ratio of 2.7 while the spark ignition was incapable to initiate combustion. Additionally, tests with the liquid gasoline injection highlighted that the combustion process with a higher “residence mixing time” exhibited higher peak pressures and shorter ignition delay times. High-speed camera images were used to capture images of the light emission during the combustion process in visible range, allowing investigation of the ignition processes. In particular, the results showed that the photo-thermal ignition process of the air-fuel mixtures with nano-ignition agents led to a spatially-distributed ignition followed by a faster consumption of the air-fuel mixture with no evidence of any discernible flame front formation or propagation. On July 10, 2017, Dr. Chehroudi attended the AIAA Propulsion & Energy Forum held in Atlanta, Georgia. He was also a Session Chair for the "Combustion Instability I" in which the following five technical papers were presented. Session Chairs are responsible of review of the original extended abstract submitted and based on that invite for full paper submission. On July 10, 2017, Dr Chehroudi as a Senior members of the Propellant and Combustion Technical Committee, attended the evening meeting with the rest of the members. Topics such as management of technical sessions and papers, creation of new technical sessions, Best Paper awards, Student Best Paper, Year-End highlights of technical progress and advances, continuing education, membership, etc. On May 22 to 24, 2017, Dr. Chehroudi is invited by the American Society of Mechanical Engineers (ASME) to conduct a seminar on Combustion and Emission of Pollutants from Gas Turbine Engines. Attendees are design engineers, combustion engineers, technical managers, research scientists/engineers, and specialists in the field. Controlling the emission of pollutants from gas turbine engines, whether they come from aircraft, ground-based energy conversion or mechanical drives, is one of the grand challenges of our time. Design strategies for many gas turbine components, specifically combustors and fuel nozzles, require a thorough understanding of the control of regulated combustion pollutants released into the atmosphere. 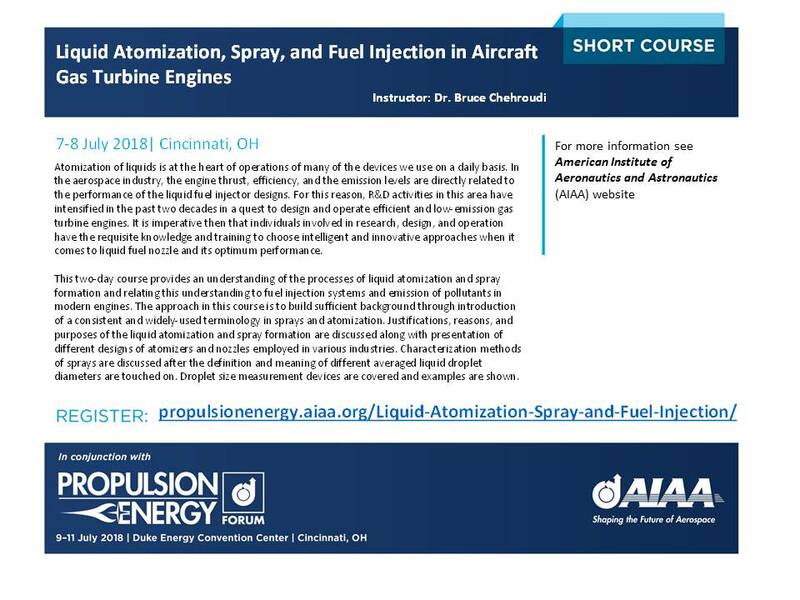 This course presents a balanced look at current and future low-emission design strategies for both aircraft and ground-based gas turbine engines. It demonstrated that the formation mechanisms for the regulated pollutants is critical for efficient engineering design strategies and technology development. The course will over a wide range of topics, including premixed or partially-premixed combustor designs, staging in lean-premixed prevaporized (LPP) mixture and its consequences on designs of the combustor, prevaporization, combustion efficiency, lean stability, auto-ignition, flashback, fuel nozzles, and lean direct injection (LDI). Operability issues (such as part-load emissions, stability and lean blowout, ignition, thermal managements, pattern factor, combustor pressure losses, combustion oscillations, and alternative fuels) will also be discussed. Using case studies from manufacturers and technology developers, the class discussion will emphasize the system-level and practical issues that must be addressed in developing different types of gas turbines that emit pollutants at acceptable levels. The course will be especially valuable to those who are new in the field as well as those who wish to increase their understanding of gas turbine emission control strategies. For more information please visit www.asme.org . On May 15 to 17, 2017, Dr. Chehroudi is invited by the Society of Automotive Engineers (SAE), to conduct a seminar on Combustion and Emission of Pollutants from engines. Combustion is a key element of many of modem society’s critical technologies. Electric power production, home heating, ground transportation, spacecraft and aircraft propulsion, and materials processing all use combustion to convert chemical energy to thermal energy or propulsive force. Although combustion, which accounts for approximately 70 percent of the world’s energy usage, is vital to our current way of life, it poses great challenges to maintaining a healthy environment. 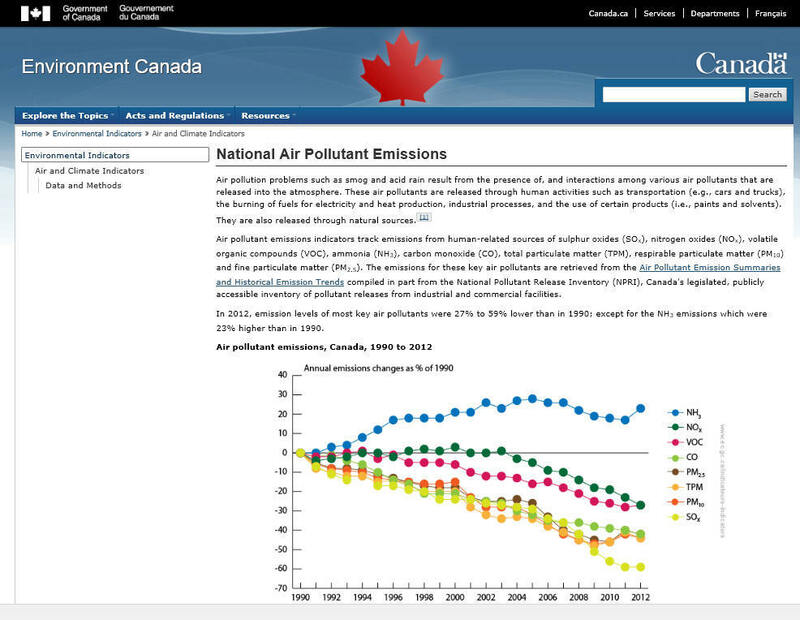 Improved understanding of combustion will help us deal better with the problems of pollutants, atmospheric change and global warming, unwanted fires and explosions, and the incineration of hazardous wastes. Despite vigorous scientific examination for over a century, researchers still lack full understanding of many fundamental combustion processes. The list below shows key topics discussed with reference to many applications in design and engineering of relevant components. For more information, please visit www.sae.org. _Physical meaning of "specific heat"
Dr. Chehroudi acted as a member of the PhD Committee for Dr. Luciano Strafella from Department of Innovation Engineering, University of Salento, for his work titled " A Novel Approach to Initiate Combustion: Performance and Application Potential in Internal Combustion Engines. Dr. Chehroudi was involved in the progress and direction of the work and reviewed / commented on the dissertation. May 4, 2017. On March 20- 22, 2017, Dr. Chehroudi was an invited speaker by the Society of Automotive Engineers, to conduct a seminar on Gasoline Direct Injection (GDI) in Troy, Michigan. and Exposition (SciTech 2017), American Institute of Aeronautics and Astronautics (AIAA) , Grapevine, Texas, Jan 9-13, 2017. Speakers from Air Force Research Laboratory, Georgia Tech University, University of Cambridge, Sapienza University of Rome, University of California at Los Angeles (UCLA), and Purdue University presented their research. Invited Speaker by the American Institute of Aeronautics and Astronautics to conduct a two-day seminar on Liquid Atomization, Sprays, and Fuel Injection in Aircraft Gas Turbine Engines (January 7-8, 2017), AIAA Science and Technology Forum and Exposition (SciTech 2017), Grapevine, Texas, Jan 9-13, 2017.
design and operate efficient and low-emission gas turbine engines. 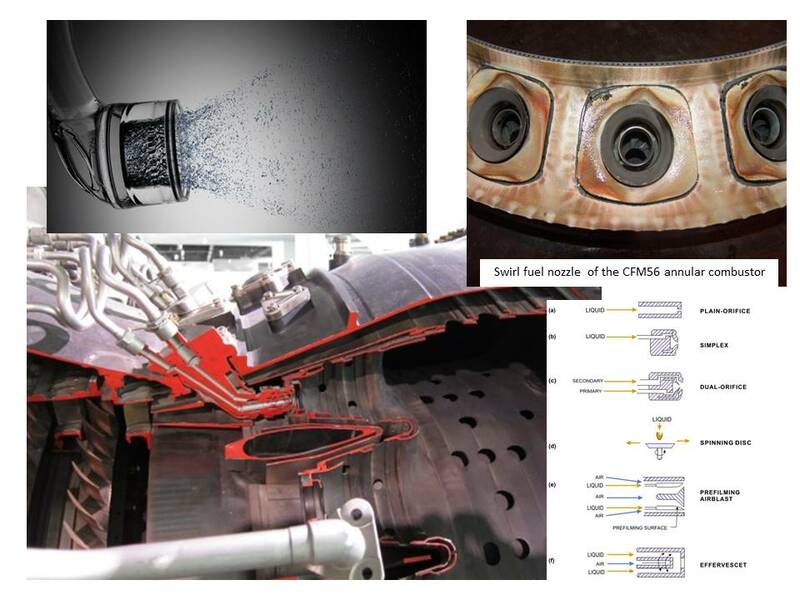 It is imperative then individuals involved in research, design, and operation have the requisite knowledge and training to choose intelligent and innovative approaches when it comes to liquid fuel nozzle and its optimum performance. Dr. Chehroudi is a member of the Organizing Committee for the 5th International Conference and Exhibition on Mechanical & Aerospace Engineering to be held in Las Vegas, Nevada, USA, October 2-7, 2017. 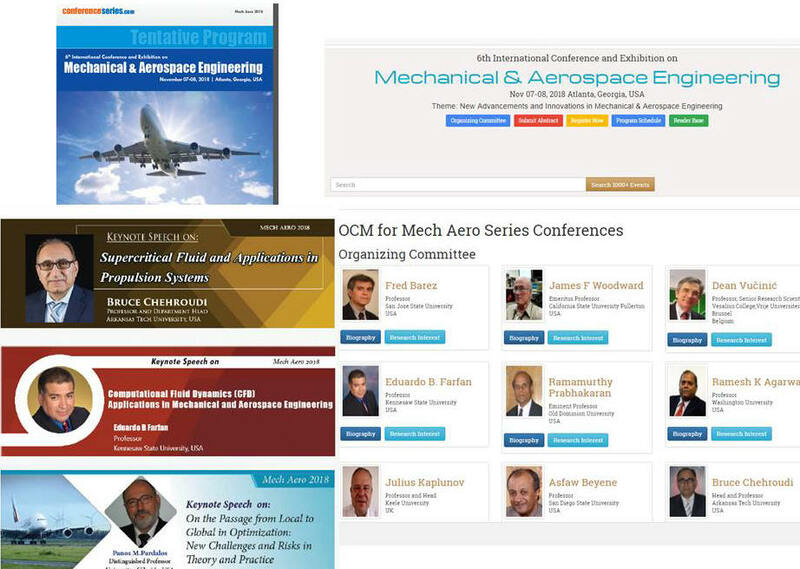 The conference theme is New Advancements and Innovations in Mechanical & Aerospace Engineering. On November 14-16, 2016, Dr. Chehroudi will be an invited speaker by the American Society of Mechanical Engineers (ASME) to deliver a 3-day seminar on Effective Management of Research and Development in San Diego, California. 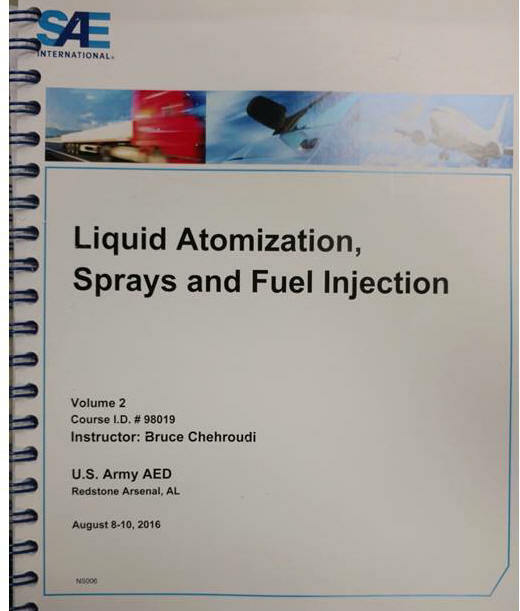 On August 8 to 10, 2016, Dr. Chehroudi was an invited speaker at the US Army, Redstone Arsenal in Huntsville, AL to give a talk on Liquid Atomization, Sprays, and Fuel Injection. 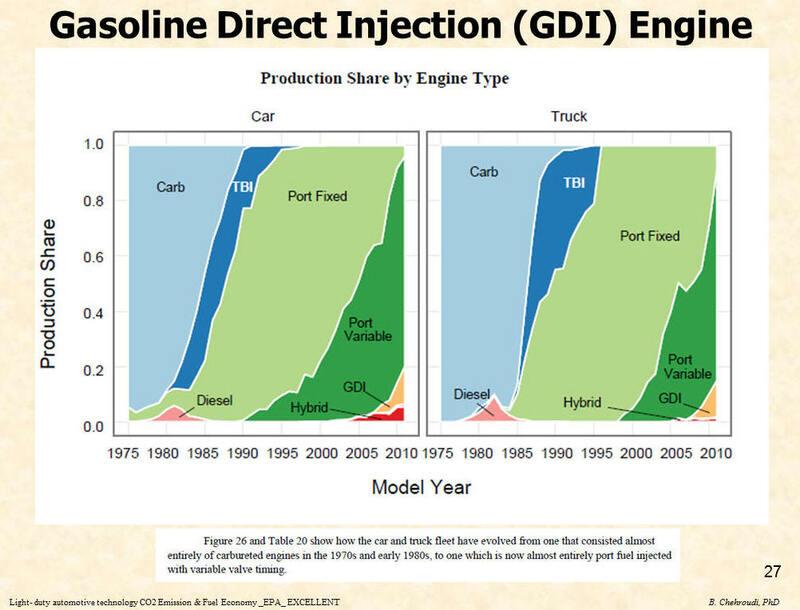 Dr Chehroudi discussed some of the advances in liquid atomization, sprays and fuel injection and their applications in advanced small diesel engines. 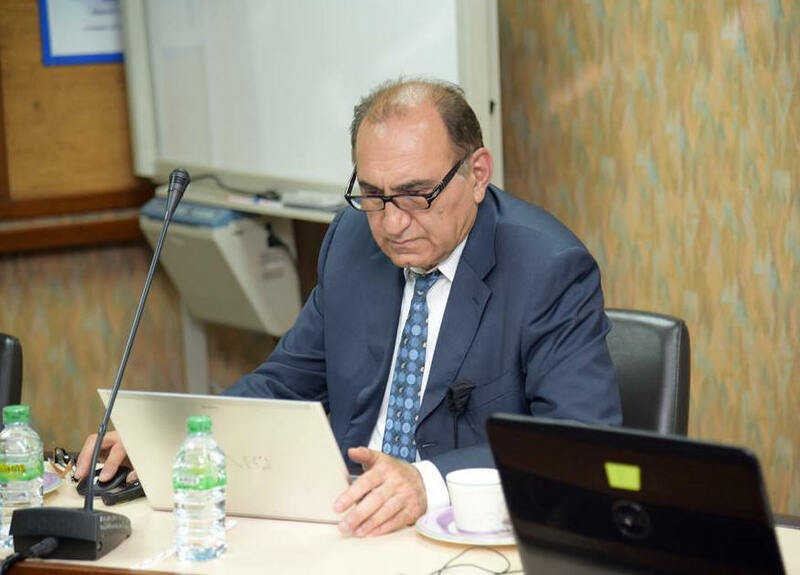 Dr Chehroudi discussed some of his ideas, particularly the "Interacting-Sprays Injection System" in order to have equal or even better atomization quality while lowering the system weight for small engine applications. 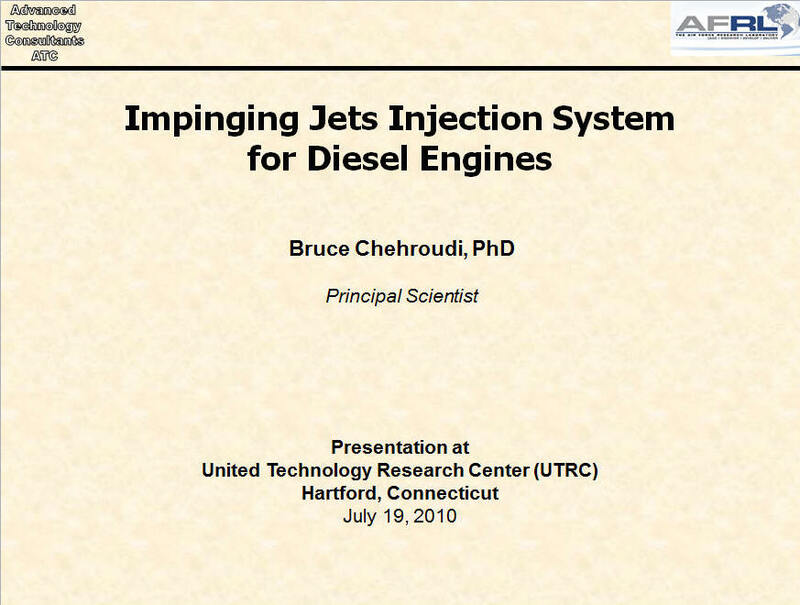 The concept of Interacting-Sprays Injection System was first proposed by Chehroudi's group, something that was inspired by impinging-jets injectors in liquid rocket engines. Mr. Joseph A Gibson, US Army Propulsion Division, Small and Certified Engines Team, was his host. 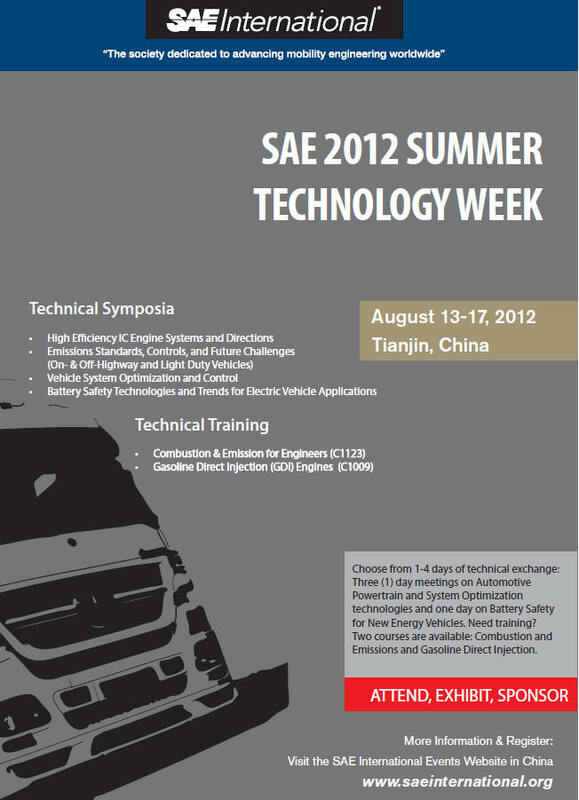 This in-house seminar was organized by the Society of automotive Engineers (SAE). On July 25 to 27, 2016, Dr. Chehroudi has conducted a 3-day seminar on Gasoline Direct Injection (GDI) engines in Troy, Michigan. This is a seminar introduced in 2010 which, in view of recent market share of GDI Engines, has become a very popular professional seminar to attend amongst R&D/application engineers, researchers, technical managers, regulators, and policy makers. The objective of the seminar is to present adequate information on combustion and emission of pollutants for GDI engines in order to elevate attendee's background knowledge for an intelligent application and comfortable understanding of the existing body of knowledge in direct injection spark ignition engines. Dr. Chehroudi will be chairing a session on Ignition in Propulsion Systems during the 2016 American Institute of Aeronautics and Astronautics (AIAA) held in Salt Palace Convention Center, Salt Lake City, Utah, July 25 - 27. The following papers will be presented in this session. 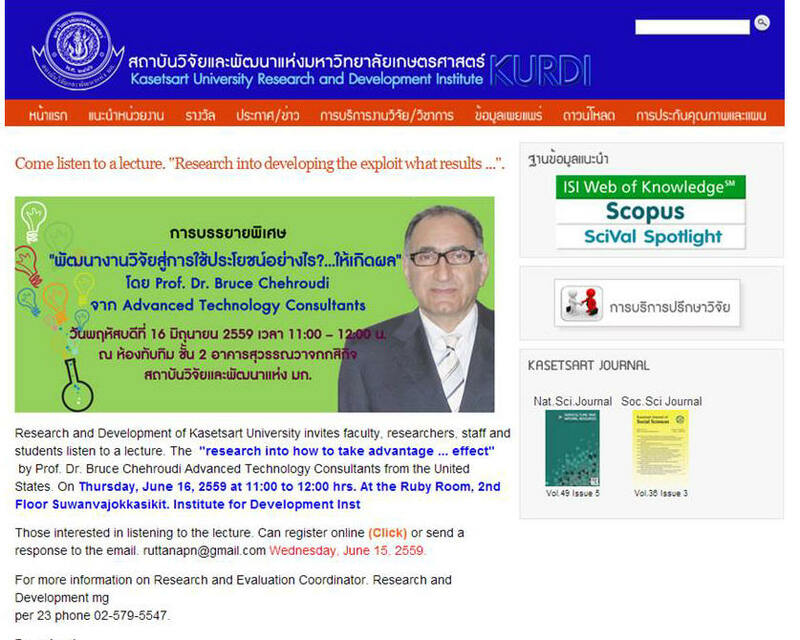 On June 16, 2016, Dr. Chehroudi was an invited speaker at the Kasetsart University (KU), Bangkok, Thailand. 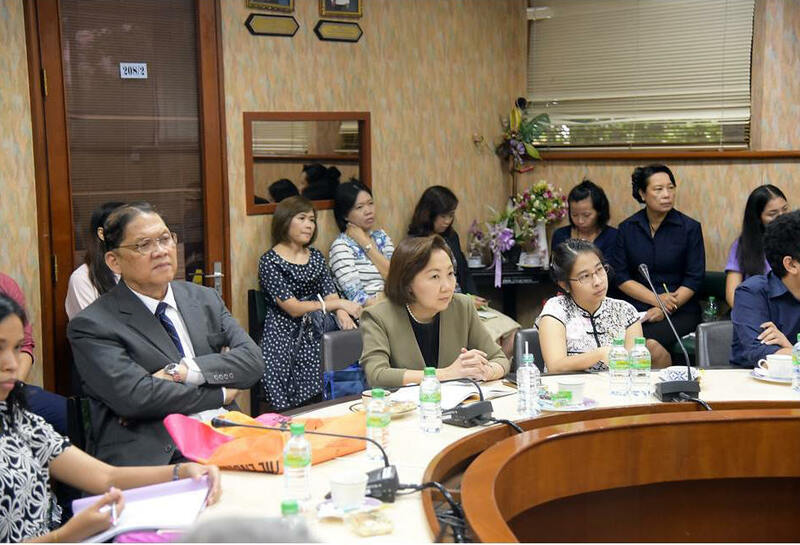 This meeting was kindly organized by Prof. Klanarong Sriroth who is also a distinguished member of the Board of Directors of the Mitr Phol company. 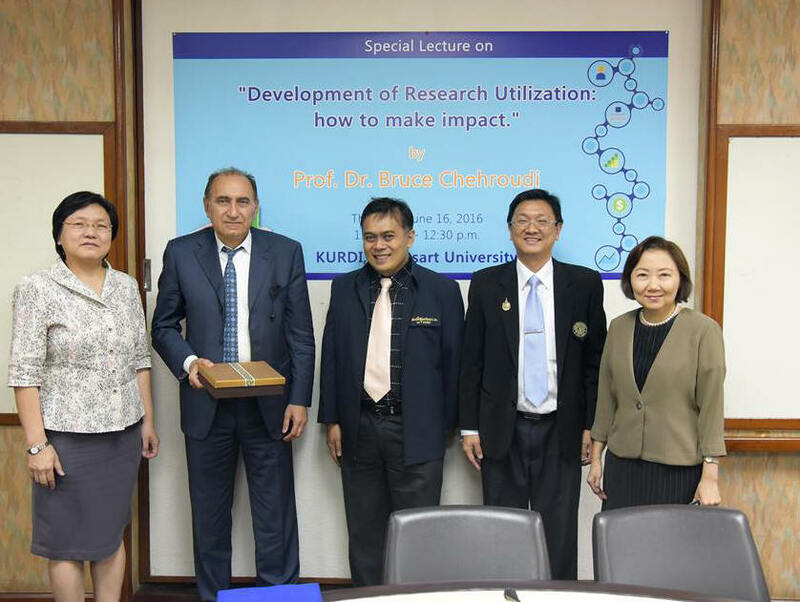 Dr. Chehroudi presented a work on university-industry collaboration on R&D, titled "Corporate-University R&D," to a large number of attendees: Click on the KURDI link. 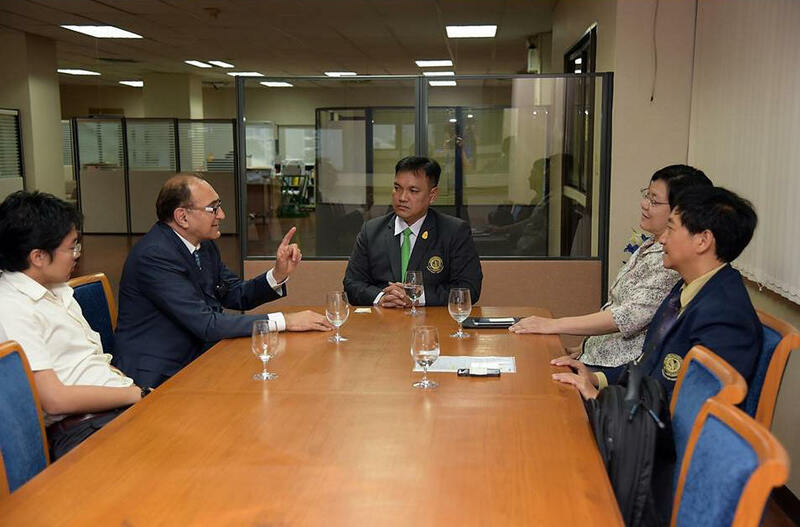 During this visit he has the opportunity and the honor to meet with the President of the university (Dr. Chongrak Wachrinrat), Vice President for Research (Dr. Siree Chaiseri), and Director of the Research and Development Institute (KURDI) (Dr. Thongchai Sunwonsichon). During this visit he was kindly escorted by Prof. Chinnathan Areeprasert, from the Mechanical Engineering department. 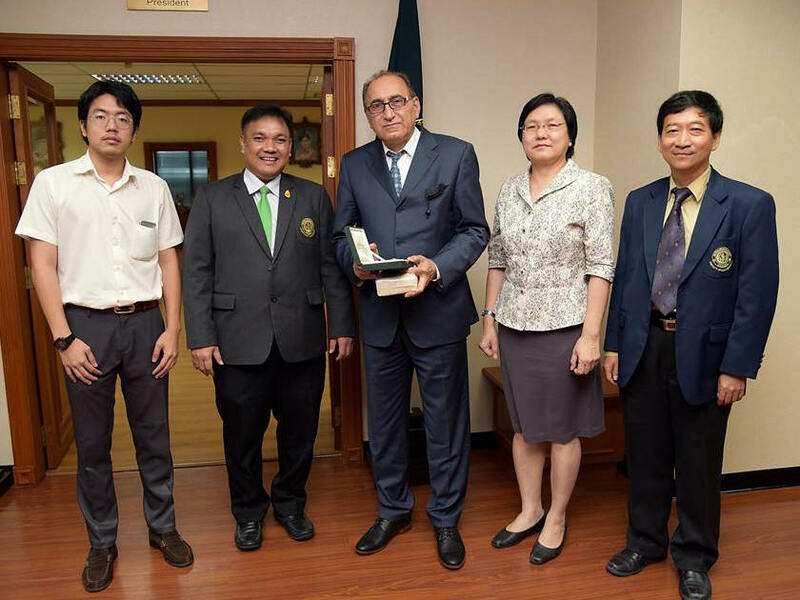 During this visit, Dr Chehroudi and the Kasetsart University discussed avenues in which they can cooperate on matters related to Research and Development and industry collaborations. Some suggestions were made to pursue the matters in the near future. 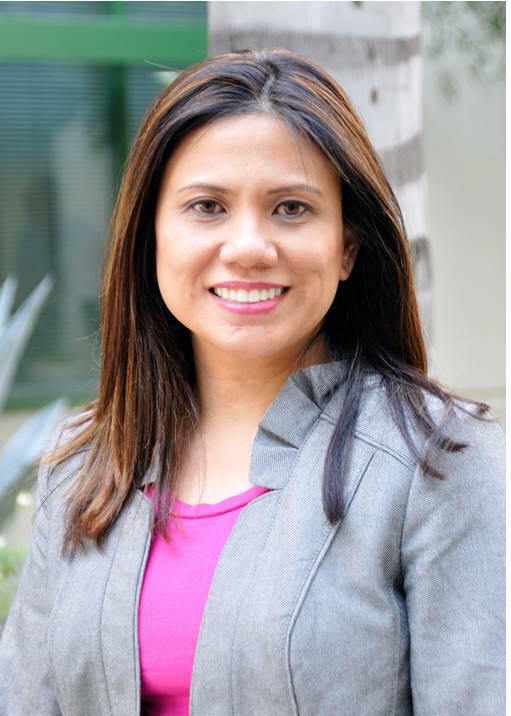 From June 12 to 15, 2016, Dr. Chehroudi was an invited consultants for the Mitr Phol company in Thailand. Dr. Chehroudi and Ms. Hooshmand acted as consultants regarding the training and future growth of company's innovation and management of research and development (R&D). This meeting was initiated byProf. Klanarong Sriroth who is also a distinguished member of the Board of Directors of the Mitr Phol company. Dr. Chehroudi and Ms. Hooshmand also had a great pleasure of meeting Prof. Dr. Pavinee Chinachoti, President of the FoSTAT(www.fostat.org). 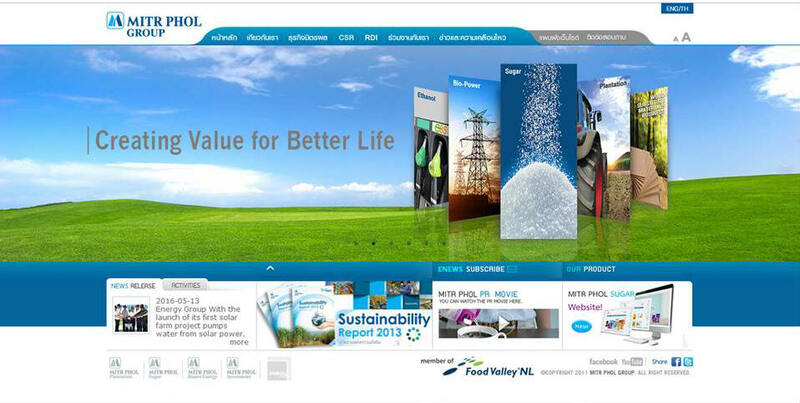 The Mitr Phol company is a privately-owned group of companies, mainly owned by the Vongkusolkit family. It is now ranked as the world's third largest sugar producer, and the largest producer in Asia. It is Thailand's largest sugar producer and the 2nd largest in China through its joint venture company East Asia Sugar. In addition to Thailand and China, Mitr Phol has operations and investments in Lao PDR, Cambodia, and most recently Australia. Its key business units include sugar, wood substitute materials, and renewable energy. Mr. Suppapong Sooksangchaya, Vice President, Sugar Farm Technology and Management, Mitr Phol Sugar Corp., Ltd.
Dr. Sunisa Chatsurachai, Senior Researcher (Bioinformatics), Research & Development Division, Innovation and Research Center, Mitr Phol Sugarcane Research Center Co., Ltd.
Dr. Sansanalak Rachawong, Senior Manager - Bio-based Chemicals & Energy, Research & Development Division, Innovation and Research Center, Mitr Phol Sugarcane Research Center Co., Ltd.
Krist Kroopasa, Human Resources Manager (Phu Vieng), Human Resources Department, United Farmer & Industry Co., Ltd.
Dr. Jetnapa Techawipharat, Deputy Manager, Corporate Strategy, Mitr Phol Sugar Corp., Ltd.
Suchat Olannaranon, Business Analyst, Mitr Phol Sugar Corp. Ltd.
On Monday, May 25 - 27, 2016, Dr. Chehroudi was an invited speaker by the Lubrizol Corporation (R&D Center), to conduct an in-house seminar on Gasoline Direct Injection (GDI), Additives, and Deposit Formations in Wickliffe, Ohio. 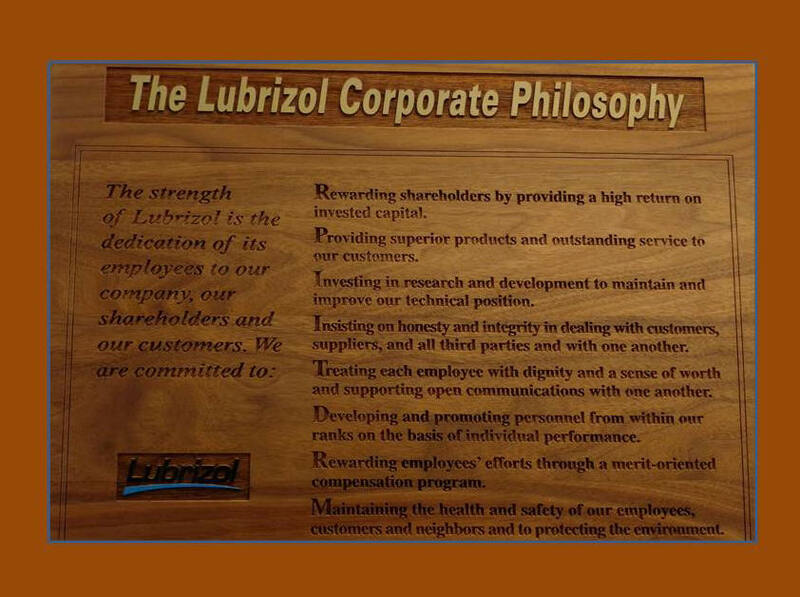 This is a specially prepared seminar for Lubrizol that is supplemented and enhanced with information on additives and deposit formation issues in injectors, combustion chamber, and valves. The objective of the seminar was to present adequate information on combustion and emission of pollutants, additives and deposit formation in GDI engines in order to elevate attendee's background knowledge for an intelligent application and comfortable understanding of the existing body of knowledge in direct injection spark ignition engines. During this visit, Dr. Chehroudi Met with some of the senior members of the engine oil and fuel testing as well as R&D centers. There were exchanges of information. 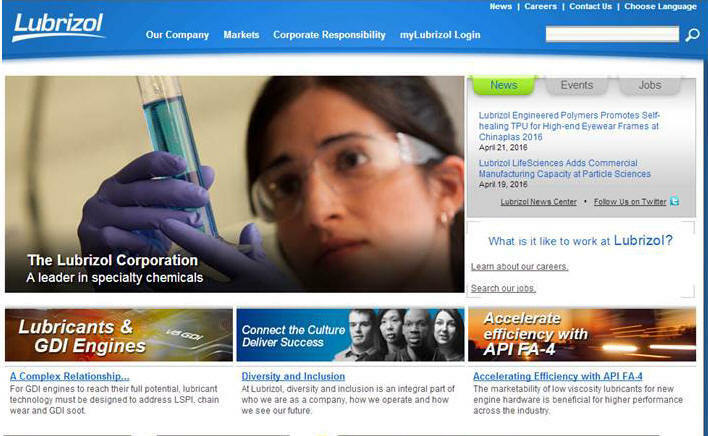 The ATC and Lubrizol explored avenues for future collaborations in areas of mutual interest. Graphene is the strongest material ever studied and can be an efficient substitute for silicon. This six-volume handbook focuses on fabrication methods, nanostructure and atomic arrangement, electrical and optical properties, mechanical and chemical properties, size-dependent properties, and applications and industrialization. There is no other major reference work of this scope on the topic of graphene, which is one of the most researched materials of the twenty-first century. The set includes contributions from top researchers in the field and a foreword written by two Nobel laureates in physics. Use of nanostructured materials, in particular graphene, in combustion and ignition of fuels has recently shown promising results to enhance fuel burn rate and potential for light-activated volumetrically-distributed ignition. For example, addition of functionalized graphene (FG) sheets to nitromethane, has been demonstrated to act as a catalyst and substantially increase the linear burning rate of the fuel. Functionalization of the graphene is considered as a great opportunity for tailor-made material with specific properties of interest. For example, it consists of chemical functional groups on the surface such as epoxides and hydroxides and on the edges of the sheet as hydroxides and carboxylates. These oxygen-containing functionalities bring about catalytic properties for fuel decomposition and other intermediate fragments during the fuel oxidation process. The defect structures in the FG sheets have also been shown to act as active sites. Such augmented fuel thermal decomposition and its derivatives have been verified through use of molecular dynamics (MD) simulations. FG sheets are easily dispersible in many hydrocarbon fuels and propellants with no need for surfactants and may also offer a substantially higher surface area than other nanostructured materials such as metal oxides and carbon nanotubes. Also, because FG is entirely oxidized in high temperature combustion zones with virtually no additional residues other than the common combustion products, it can be viewed as a fuel supplement, contributing towards the energy density. In this paper, applications of the graphene oxides and FG sheets in ignition and combustion of fuels are briefly reviewed, highlighting potentials and future prospects of these materials. On Monday, March 21-23, 2016, Dr. Chehroudi has delivered a 3-day seminar on Combustion and Emission of Pollutants from Automotive Engines at the Society of Automotive Engineers facility in Troy, Michigan. Thorough and in-depth understanding of the thermodynamics, gas dynamics, and combustion chemistry is at the heart of the intelligent approach towards control of the engine combustion and emission of pollutants. To this end, Dr. Chehroudi's seminar covers key aspects of the combustion of the fuel air mixtures for best fuel economy at the lowest emission of the harmful/regulated pollutants. _ Honda R&D America Inc.
On March 3-9, 2016, Dr. Chehroudi was an invited speaker by the Society of Automotive Engineers, to conduct two seminars as listed below. 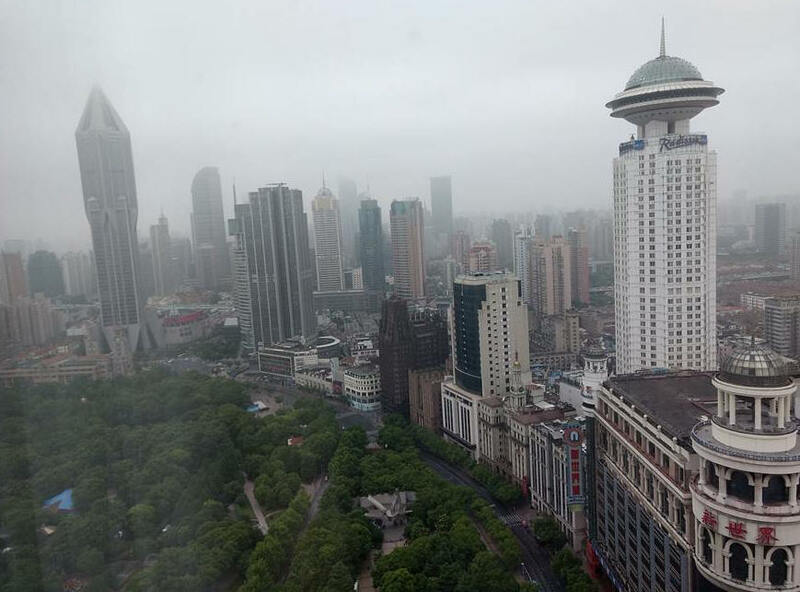 The seminars were held in the Le Royal Meridian Shanghai Hotel, Shanghai, China. 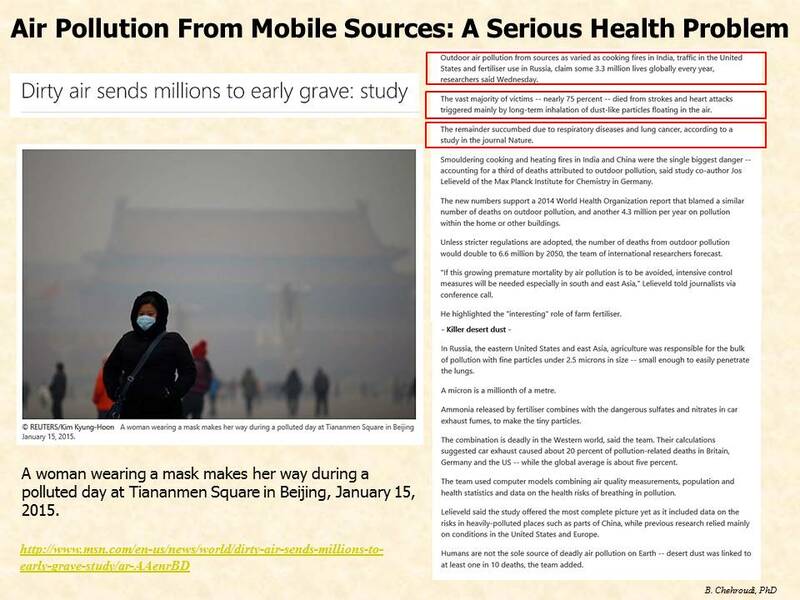 First, "Ignition Issues and Their Impacts on Performance, Efficiency and Emission of Pollutants" in Shanghai, China. _United Automotive Electronic Systems Co. Ltd.
_Blue Crown Technology (Suzhou) Co. Ltd.
On January 25 - 27, 2016, Dr. Chehroudi was an invited speaker by the Society of Automotive Engineers, to conduct a seminar on Gasoline Direct Injection in Norwalk, California (Auto Partners Building, Cerritos College). During this visit, Dr. Chehroudi had the pleasure of meeting Ms. Jannet Malig, Director of the Advanced Transportation Technology and Energy Center (ATTE) at the Cerritos College. During this meeting, avenues for future collaborations have been explored on areas of mutual interest. This is an exciting opportunity for the ATC to offer services towards goals and objectives of the ATTE Center. ATC looks forward to such future opportunities with ATTE Center. 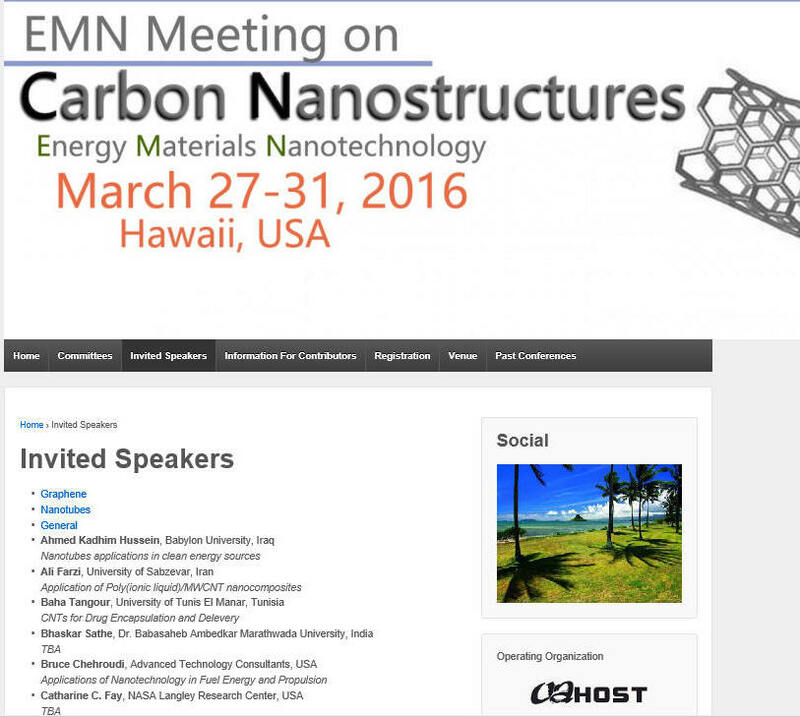 On March 27-31, 2016 Dr. Chehroudi is an Invited Speaker to the EMN Meeting on Carbon Nanostructures, Energy Materials Nanotechnology, Hawaii, USA. He will deliver a talk titled "Applications of Nanotechnology in Fuel Energy and Propulsion" The abstract of this work is presented below. The modern advent of nano- science/technology is usually marked with a lecture delivered by the Noble laureate Richard Feynman in 1959 titled “There is Plenty of Room at the Bottom”. Since then, there have been tremendous progresses in a large number of directions using products manufactured, and information learned, from nanoscale materials. Nano-science is truly a multidisciplinary subject which has penetrated into a large number of other areas/applications such as medicine, pharmaceutical, dentistry, textile, sports, automotive, computers, and energy, to name a few. 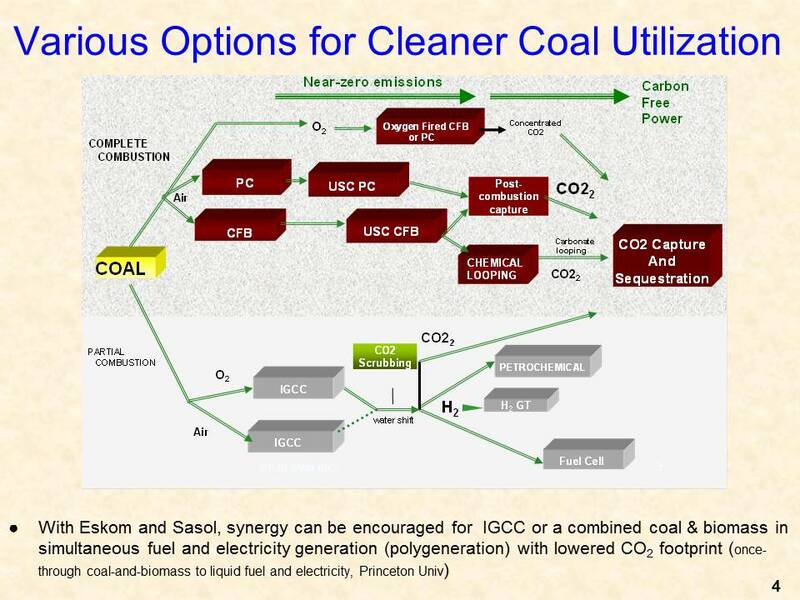 In this presentation, a select number of applications of knowledge learned at the nanosized range are briefly discussed in the context of fossil fuel production and propulsion. The aim is to demonstrate the great potential of nanostructured materials in petroleum refining industry, contributing towards efficient production of fuels and thereby of different forms of energies. 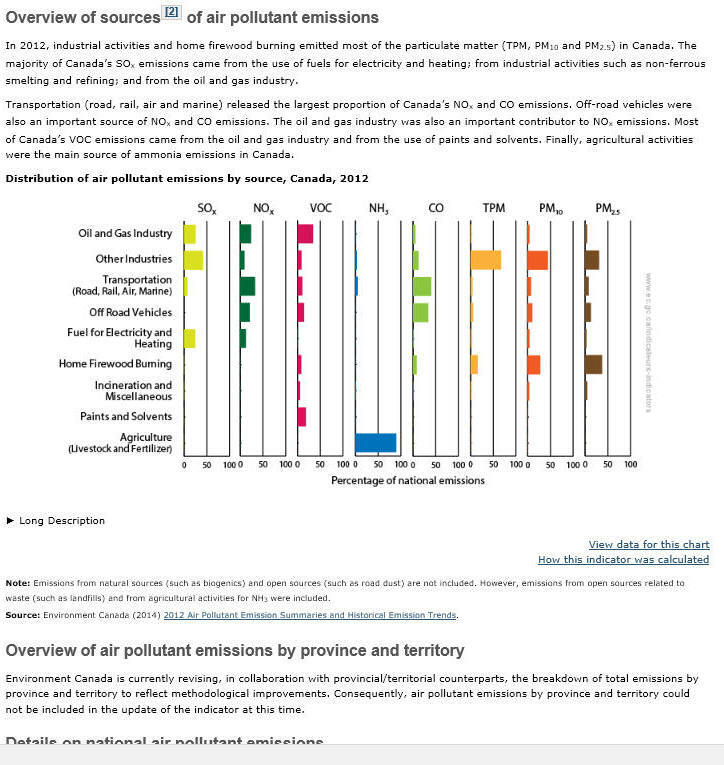 In particular, the catalytic role they play is of paramount importance, especially considering that energy producers are switching to ever-heavier fossil feedstocks (heavy oil, tar sands, shale oil, and coal) while the supply of light petroleum feedstock (high in hydrogen and low in sulfur and nitrogen) is rapidly depleting. Applications of nanostructured materials in naphtha reforming, hydrotreating (or hydrodesulfurization), conversion of syngas (Water-gas shift and Fisher-tropsch), and use of graphene/carbon-nanotubes in ignition, combustion and propulsion are presented. Click on the image to the right for the list of invited presentations and the titles of their research work. Click on the image below for the details of the Program & Abstracts and to download the file. Also, as a senior member of the AIAA Propellant & Combustion Technical Committee, Dr. Chehroudi has attended the committee meeting on Monday, January 4, 2016 in which discussions were held on issues pertaining to future technical directions and sessions in AIAA meetings, technical publications, continuing education activities, best paper awards, etc and decisions are made to move forward. Dr Chehroudi has accepted a position as a Professor and Head at the Mechanical Engineering Department and Interim Head at the Electrical Engineering Department of the Arkansas Tech University to temporarily help the department's progress into the future, secure ABET accreditation, and restructure/strengthen its graduate program. More information is available at the following link: https://sites.google.com/site/brucechehroudi/home. 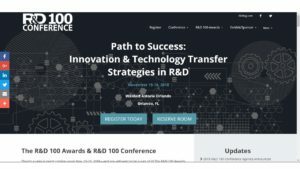 On November 12-13, 2015, Dr. Chehroudi was an Invited Speaker at the 2015 R&D 100 Awards & Technology Conference by the R&D 100 Magazine where the 100 most innovative technologies introduced in the last year were personated. Dr. Chehroudi delivered a presentation entitled "R&D Alliances: Relational, Portfolio, and Network Factors Impacting Outcomes". For Conference Agenda click on the "Agenda". This is the first time that educational conference is presented and it is held in conjunction with the 53-year-old R&D 100 Awards program. 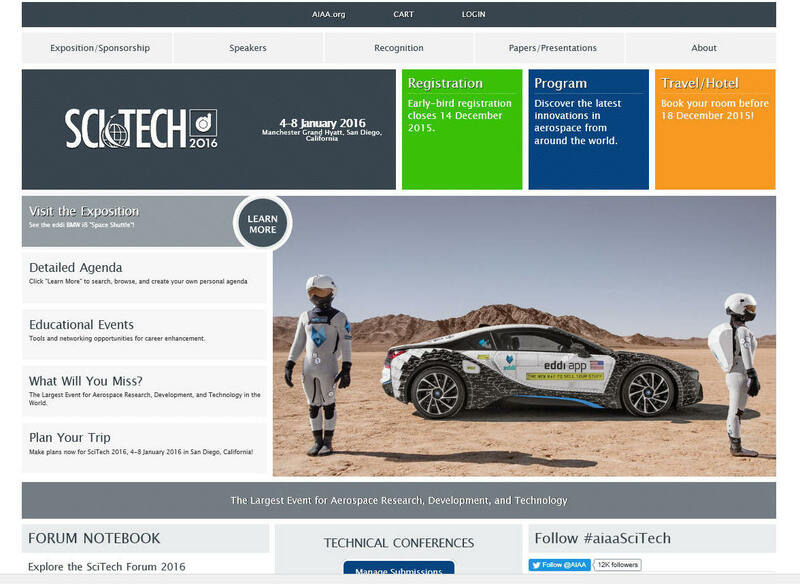 These two events - over a two-day period at Caesars Palace in Las Vegas - highlights the great ideas and innovations in technology and science unveiled by research and development teams in the past 15 months. It is a celebration of great ideas and new promises - and a unique opportunity to network with the leaders of the industries who are making an impact in R&D today. This conference encompasses four separate tracks, which focus on areas of R&D that reflect robust activity, creative innovation and practical solutions. Presenters include leaders in their fields who will share new developments, critical information and personal insights. The tracks include presentations on R&D Strategies & Efficiencies, Emerging Technologies & Materials, Innovation in Robotics & Automation, and Instrumentation & Monitoring. Click on the words "Table of Contents" in the right image to hear the introduction to Dr. Chehroudi's presentation at the 2015 R&D 100 Awards and Conference (high-speed internet access is recommended): INTRODUCTION. Amongst many others, Dr. Chehroudi has met Mr. Dean Kamen (see his detailed achievements at Wikipedia). They talked about future possible collaborations in areas of R&D, innovation, entrepreneurship and other advanced technology related areas. Dean Kamen is an inventor, entrepreneur, and advocate for science and technology. He holds more than 440 U.S. and foreign patents, many of them for innovative medical devices that have expanded the frontiers of health care worldwide. Dean’s research has led to a number of ground-breaking technology innovations, including the Segway® Human Transporter. In 1989, Kamen founded FIRST (For Inspiration and Recognition of Science and Technology), a program for students to get people interested in science, technology, and engineering. One competition started and run by FIRST is the FRC or FIRST Robotics Competition. In 2011, it held 55 regional competitions around the globe, and one international competition in St. Louis, MO. FIRST has gained a great deal of publicity from companies as well as many universities and colleges. His company DEKAalso holds patents for the technology used in portable dialysis machines, an insulin pump (based on the drug infusion pump technology), and an all-terrain electric wheelchair known as the iBOT, using many of the same gyroscopic balancing technologies that later made their way into the Segway. Widely recognized as the “Oscars of Invention”, the R&D 100 Awards identify and celebrate the top technology products of the year. Past winners have included sophisticated testing equipment, innovative new materials, chemistry breakthroughs, biomedical products, consumer items, and high-energy physics. The R&D 100 Awards spans industry, academia, and government-sponsored research. View the complete list of 2014 R&D 100 Award winners. 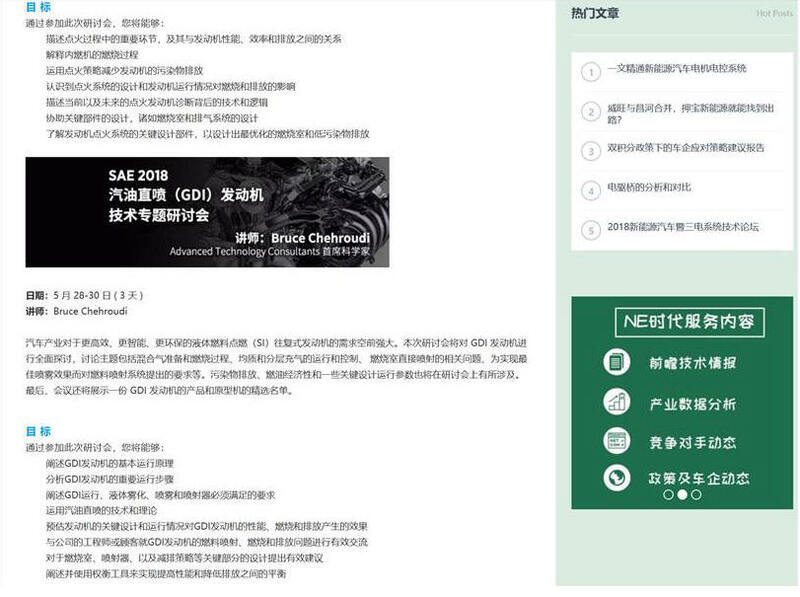 The image to the right is hyperlinked to the 2015 R&D 100 Awards and Technology Conference Guide which contains short biography of all the invited speakers, synopsis of their talks, and a list of those who were awarded in 2015. 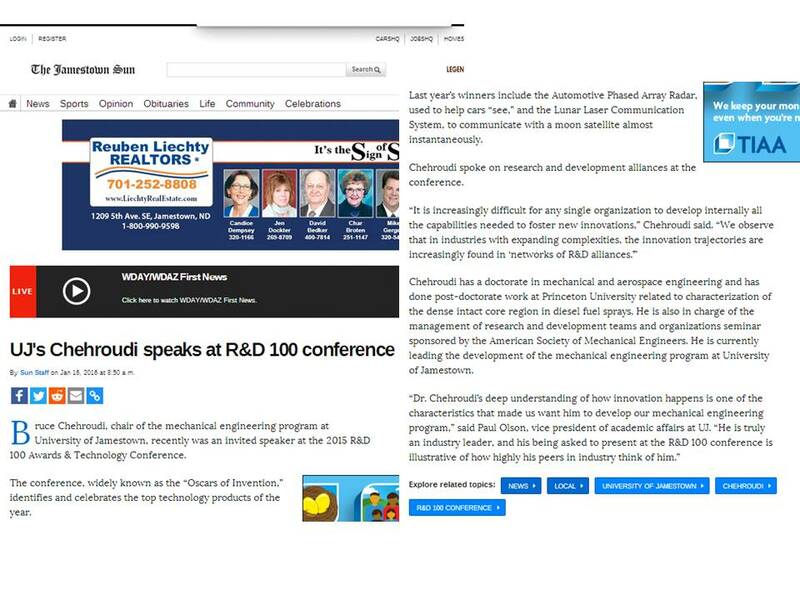 The Jamestown Sun newspaper of North Dakota has written an article on Dr. Bruce Chehroudi, Chair of the Mechanical Engineering at the University of Jamestown, as an Invited Speaker at the R&D 100 Award and Technology Conference. On an invitation by the American Society of Mechanical Engineers (ASME), Dr. Chehroudi has conducted a three-day seminar on Effective Management of Research and Development Teams and Organizations in San Diego, California from November 8 to 10, 2015. Attendees from automotive, pharmaceutical, and aerospace industries as well as national and international government research organizations have attended this seminar. There were numerous case studies which provided ample opportunities for the highly-educational interaction amongst the attendees, directed by Dr. Chehroudi. Attendees are divided into several teams and engage in a design a R&D division from a fictitious corporation. After completion of the design phase, teams discuss and critique each other to enhance intra-team learning and realize advantages and disadvantages of their designs. Dr. Chehroudi also provides his comments. 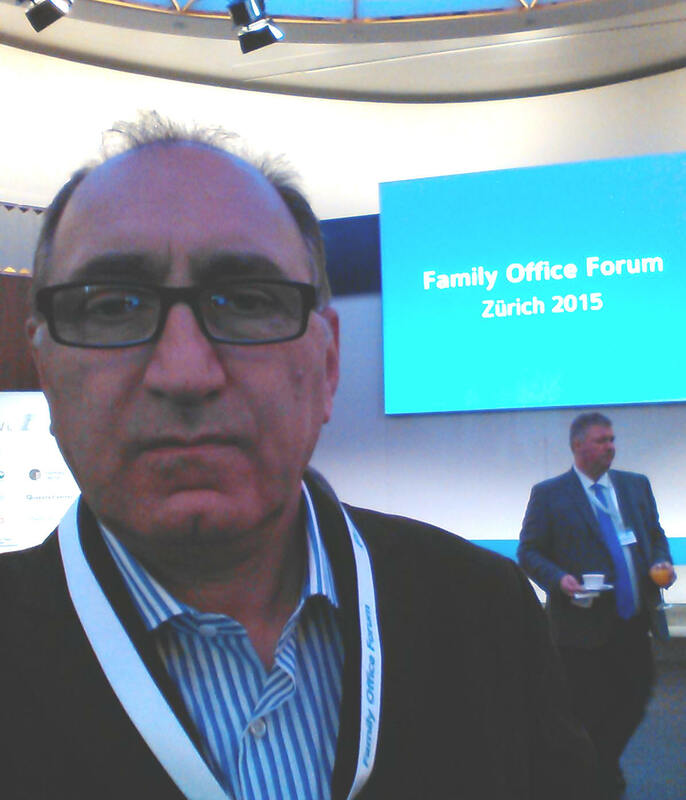 ON November 3-4, 2015, Dr. Chehroudi has attended the Family Office Forum held in Dolder Grand Hotel located in Zurich, Switzerland. The Dolder Grand Hotel is a spectacular mountain top location, overlooking the city of Zurich and its stunning lake. During the Forum, Dr. Chehroudi had opportunities to meet and have discussions with fund manager, family office representatives, venture capitalists, biochemists, invited speakers, and organizers. These initial discussions are currently being followed in areas of mutual interest. 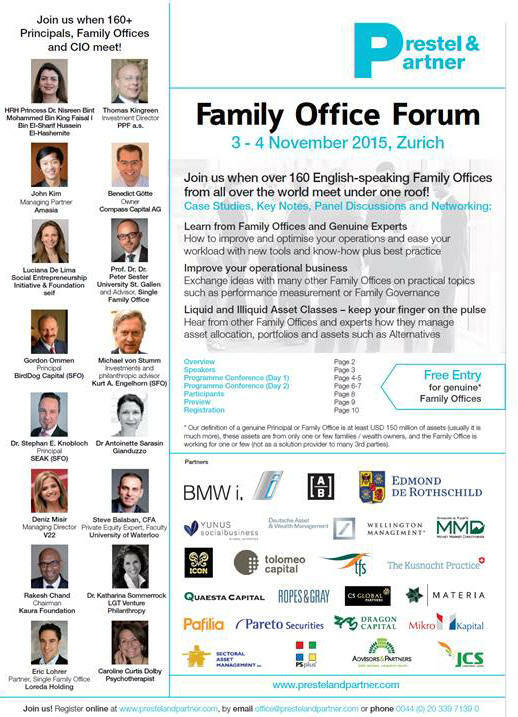 This Forum, was the annual meeting of more than 160 Family Offices from all over the world, a truly global and international gathering of genuine Family Offices held in English. The Principals or Family Offices were from at least $150 million of assets (usually much more). These assets were from only one or few families / wealth owners, and the Family Office was working for one or few (not as a solution provider to many 3ed parties). The conference was also a networking event with all-day-long networking, plus 5 parallel streams to choose from. 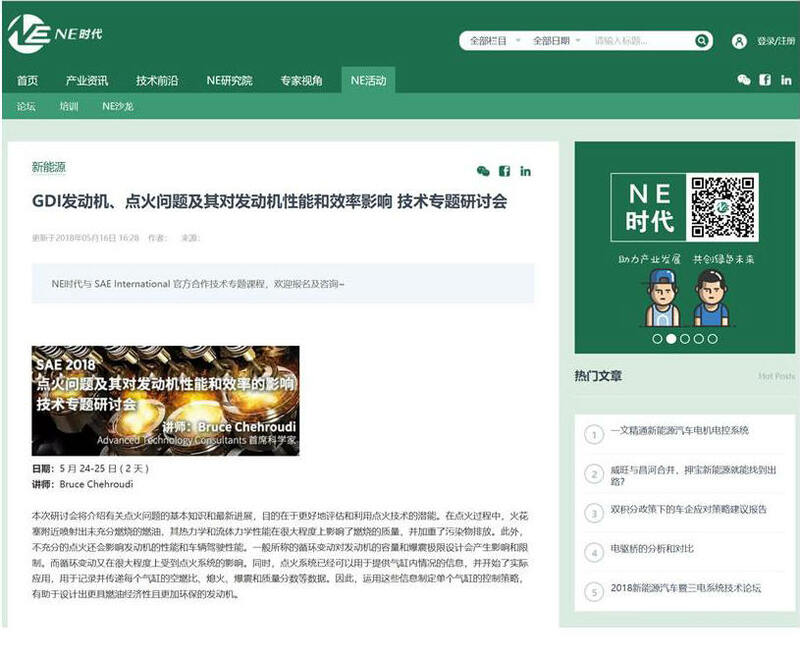 The Forum was based on (1) years of research with over 100 Single and Multi Family Offices, many UHNWI, plus private banks with UHNWI management, academics, and partners, (2) the precise whishes and the active support of Family Offices. The agenda was based on the requirements and challenges of Family Offices in their day-to-day business, (3) the long-standing expertise of the partners at Prestel & Partner, in particular with Family Offices. The genuine interests of Family Offices were at the core of the Forum. The Forum offered all participants a platform to exchange experiences, hear about the latest strategies and discuss them afterwards. It was the ideal environment to nurture important relationships and to meet new interesting contacts. Dr. Bruce Chehroudi has accepted an Inaugural Chair position for the Mechanical Engineering Department at the University of Jamestown, North Dakota, to build the foundation of the mechanical engineering in this university. In essence, he will be the "founding chair" of this department. Robert Badal, President of the University of Jamestown, in an interview stated that "Dr. Chehroudi is a distinguished academic leader who will build an outstanding program that integrates engineering studies with our Liberal Arts tradition". A copy of the University of Jamestown's advertising brochure is shown here. Welcome to the Department of Mechanical Engineering (ME) at the University of Jamestown, an educational institute that has its roots back in the year 1883. 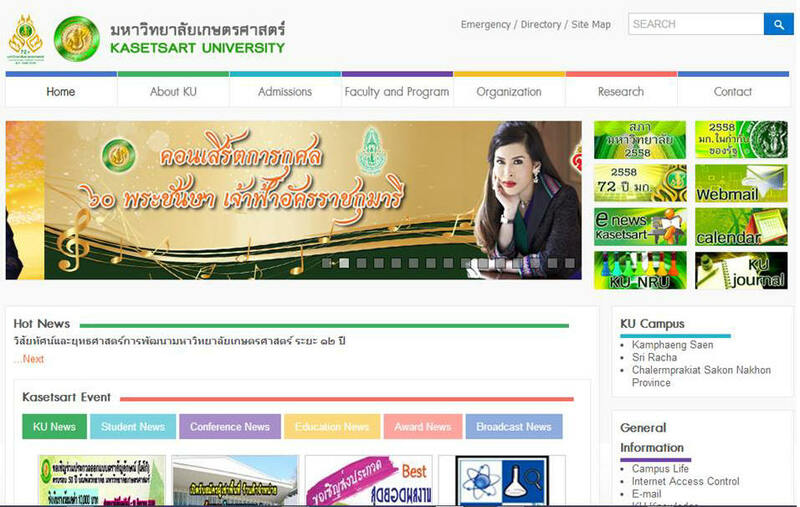 I am delighted that you have decided to visit our website. The vision of the department is to train engineers who aspire to have the ingenuity of Lillian Gilberth, the problem solving capabilities of Albert Einstein, the creativity of Pablo Picasso, the determination of the Write brothers, the leadership abilities of Bill Gates, the conscience of Eleanor Roosevelt, the vision of Martin Luther King, entrepreneurial character of Steve Jobs, and the curiosity and wonder of our grandchildren. For the academic year 2016-17, the University of Jamestown will be accepting students who are interested in pursuing their education towards a bachelor’s degree in Mechanical Engineering (BSME). Our core curriculum in Mechanical Engineering is essentially the same as, and in some respects more enhanced than, other universities. The curriculum is designed based on a blend of what satisfies the ABET accreditation committee, surveys conducted on MIT alumni on skills highly needed at work (such as teamwork, leadership and entrepreneurship), and University of Jamestown’s heritage of developing wholeness in its students by balancing the ideals of the liberal arts tradition and sound professional preparation. We firmly believe that there is always room for improvements in anything we do and this rule also applies to our curriculum design. Hence, through guidance and recommendations from our Industry Advisory Board (IAB) and other engineering societies such as American Society of Mechanical Engineers (ASME), American Society of Engineering Education (ASEE), National Academy of Engineering (NAE), as well as our Alumni, we ingrain a continuous improvement mindset in everything we do, specifically the ME curriculum. The curriculum requires 33 credit units (CU) of mathematics and science courses, 66 CU of core required mechanical engineering courses, 16 CU of general education, and 6 CU of English and communication courses. To provide breadth to your ME education, the curriculum requires minimum of 9 CU of technical elective courses such as Introduction to Gas Dynamics, Introduction to micro and nanosystems, Propulsion Systems, Robotics, Renewable and Biologically-Based Energy sources and systems, and Systems Engineering. The department is progressing towards completion of well-equipped specially-designed laboratories such as instrumentation and measurements, thermodynamics, fluid mechanics, heat & mass transfer, propulsion engines, strength of materials, vibration & control systems, manufacturing and 3D printing, and robotics laboratories. These laboratories provide ample opportunities to ME students for hands-on experiences on a number of advanced technologies and energy systems. 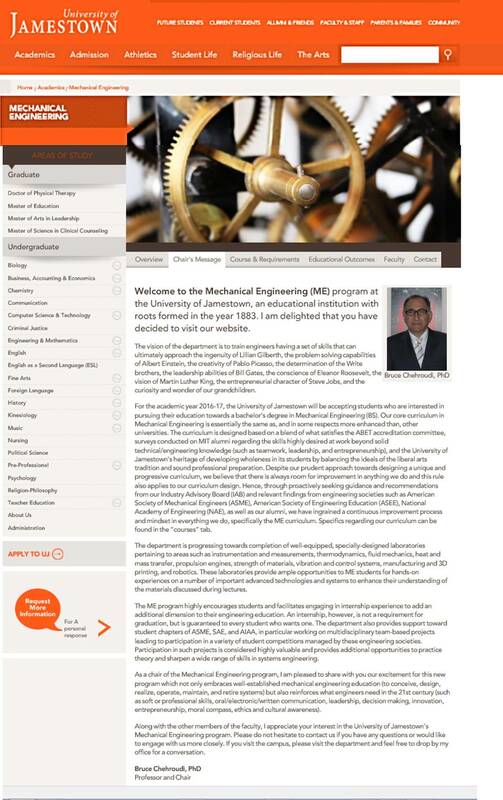 As a chair of the ME program, I am pleased to share with you our excitement of this new program that not only embraces well-established mechanical engineering education (to conceive, design, realize, operate, maintain, and retire systems) but also reinforces what engineers need in 21st century (such as soft or professional skills, communication (orally, electronically, and in writing), leadership, decision making, innovation, entrepreneurship, moral compass, ethics and cultural awareness). Along with the other members of the faculty, I appreciate your interest in University of Jamestown’s Department of Mechanical Engineering. Please do not hesitate to contact us if you have any questions or would like to engage with us more closely. If you visit the campus, please visit the department and feel free to drop by my office for a conversation. On Monday, October 5-7, 2015, Dr. Chehroudi will deliver a 3-day seminar on Gasoline Direct Injection (GDI), Troy, Michigan. 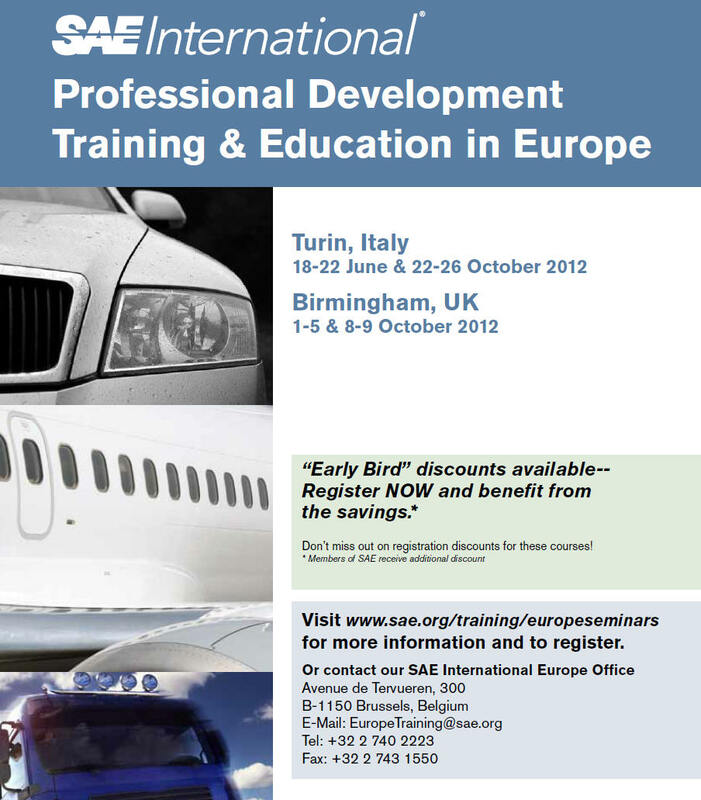 This seminar is sponsored by the SAE International. 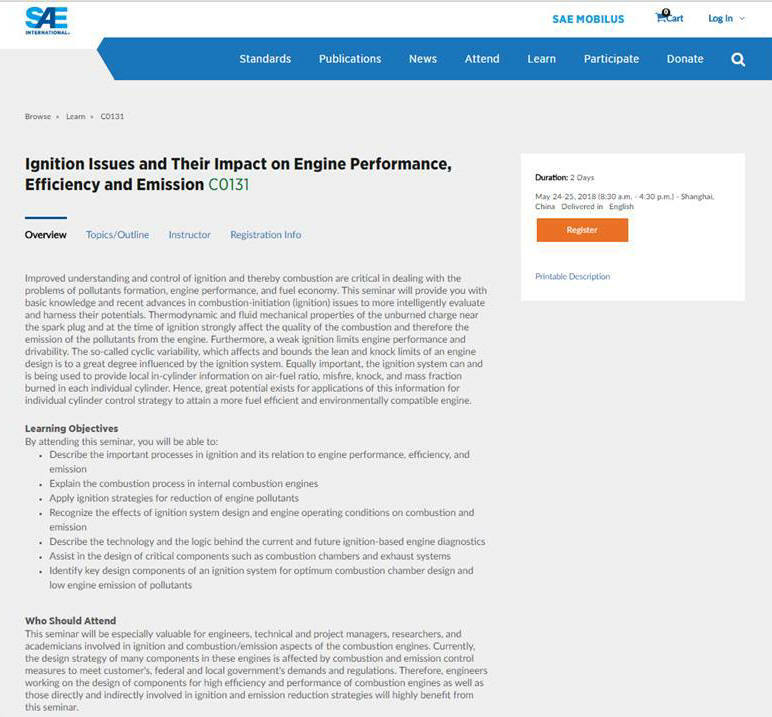 This is a highly updated version of the seminar introduced in 2010 which, in view of recent market share of GDI Engines, has become a very popular professional seminar to attend amongst R&D/application engineers, researchers, technical managers, regulators, and policy makers. On Monday, September 21, 2015, Dr. Chehroudi has delivered a 3-day seminar on Combustion and Emission of Pollutants from Automotive Engines at the Society of Automotive Engineers facility in Troy, Michigan. Thorough and in-depth understanding of the thermodynamics, gas dynamics, and combustion chemistry is at the heart of the intelligent approach towards control of the engine combustion and emission of pollutants. To this end, Dr. Chehroudi's seminar covers key aspects of the combustion of the fuel air mixtures for best fuel economy at the lowest emission of the harmful/regulated pollutants. The objective of this seminar is to present adequate information on combustion in engine and emission of pollutants for gasoline-fueled SI engines in order to elevate attendee's background knowledge for an intelligent application and comfortable understanding of the existing body of knowledge. The presentation style was designed to be "physical and intuitional" than mathematical and concepts are promptly related to applications. These are amongst the topics discussed: Fuel and impact of fuel composition, air and volumetric efficiency, application of thermodynamics (energy balance), equilibrium composition, chemical kinetics, auto-ignition, Knock, Homogeneously-Charge Compression Ignition (HCCI), flame propagation and effects of fuel and engine operating conditions, mass fraction burn and heat release analysis, formation mechanisms for NOx, HC, and CO, alternative fuels, exhaust catalytic treatment of pollutants, advanced diagnostics, effects of engine design and operating conditions on performance and emission of pollutants, and more. From September 17 to 18, 2015, Dr Chehroudi visited the facility of the Armored Auto Group in Pleasanton, California as a consultant. Representatives from the R&D, Marketing, and Test/Engineering departments have attended this technology roadmapping and brainstorming session on a number of areas of strategic importance to Armored Auto Group. Upon conclusion, Dr. Chehroudi accepted to act as a consultant on areas of mutual interest. 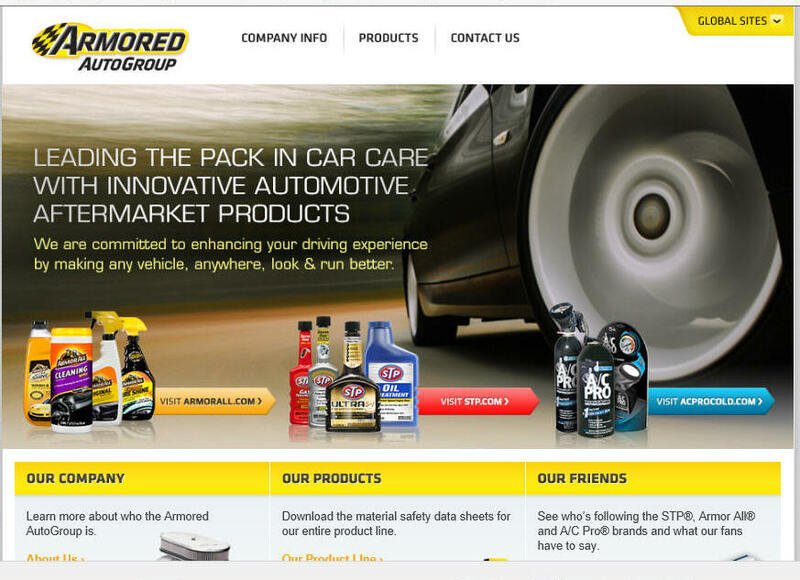 Spectrum Brands has purchased the Armored Auto Group. 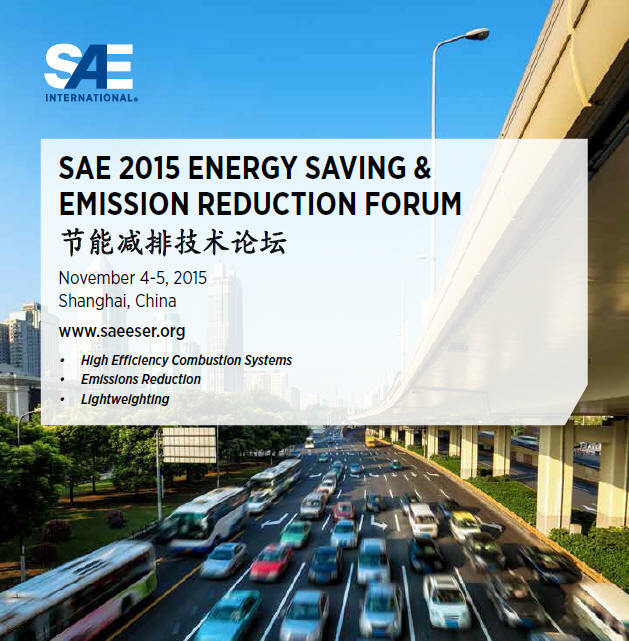 From October 28 to November 3, 2015, Dr. Chehroudi is invited to the SAE 2015 Energy Savings & Emission Reduction Forum held in Shanghai, China. He will deliver two seminars on Gasoline Direct Injection engines and Ignition Issues & Their Impacts on Engine Performance, Efficiency and Emissions. Topics discussed in these seminars can be found at the ATC website. More information including that related to registration can be found at the following link: www.saeeser.org. Also, click on the image to the right for viewing the conference brochure. On November 12-13, 2015, Dr Chehroudi is an Invited Speaker at the 2015 R&D 100 Awards by the R&D 100 Magazine where the 100 most innovative technologies introduced in the last year are personated. Dr. Chehroudi will deliver a presentation entitled "The Power of an R&D Triad: Integrating Creativity, Innovation and Entrepreneurship into an Effective R&D Environment". For more information visit the R&D 100 link at http://www.rd100awards.com/speaker/481. Innovation is now considered a crucial source of competitive advantage for R&D organizations. Additionally, because innovation is followed by entrepreneurship to secure the technology-market interface, entrepreneurship is also a critical source of competitive advantage. Once creativity is added to the mix of the innovation and entrepreneurship, we have a triad that needs to be combined with effective management strategy to build a framework for a successful R&D organization (or team). In this presentation, attributes associated with each of these three components are described along with ingredients necessary for an effective management strategy. There are also a set of barriers originating from behavioral, organizational culture, corporate policy, strategy and management that tend to slow down or even abort the chain of events from creativity to innovation and finally to entrepreneurship. After an abridged discussion of a list of barriers, particularly internal to the organizations, attributes of innovative organizations are explored and presented. 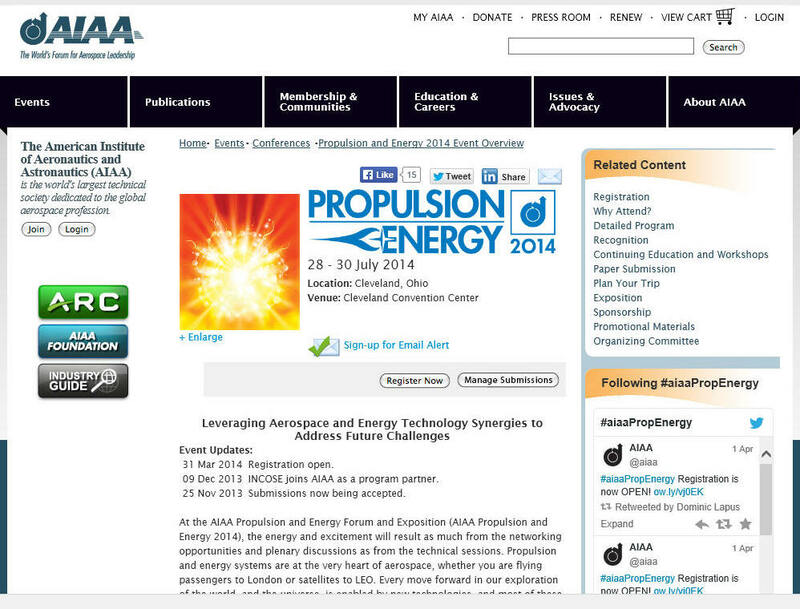 On Tuesday, July 28, 2015, Dr. Chehroudi attended the Propulsion and Energy Conference, organized by the American Institute of Aeronautics and Astronautics (AIAA) to chair a session (Teusday, July 28th, 9 am to 12 pm) on Propellants and Fuels. The conference will be held in Orlando, Florida, USA. Presentations have made from the following organizations: Digital Solid State Propulsion, LLC, Moog, Pennsylvania State University, Technion-Israel Institute of Technology, and Texas A&M University. As a member of the AIAA Propellant & Combustion Technical Committee, Dr. Chehroudi has attended the committee meeting on Monday, July 27, 2015 in which discussions were held on issues pertaining to future technical sessions in AIAA meetings, technical publications, continuing education, best paper awards, etc and decisions are made. 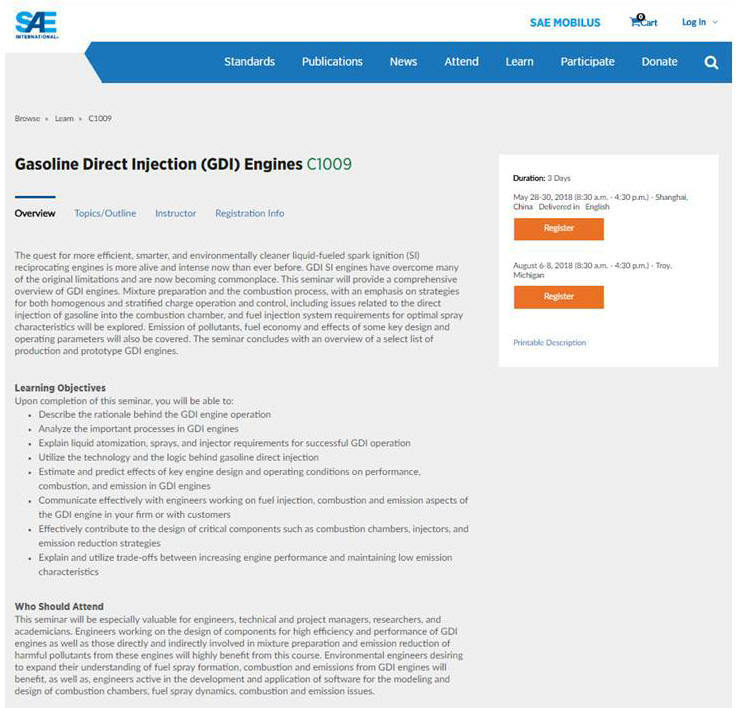 On Monday, April 20-22, 2015, Dr. Chehroudi has delivered a 3-day seminar on Gasoline Direct Injection (GDI) Engines during the SAE 2015 World Congress and Exhibition at Cobo Hall, Detroit, Michigan. This seminar was sponsored by the SAE International. This is a highly updated version of the seminar introduced in 2010 which has become a very popular professional seminar to attend amongst R&D/application engineers, researchers, technical managers, regulators, and policy makers. 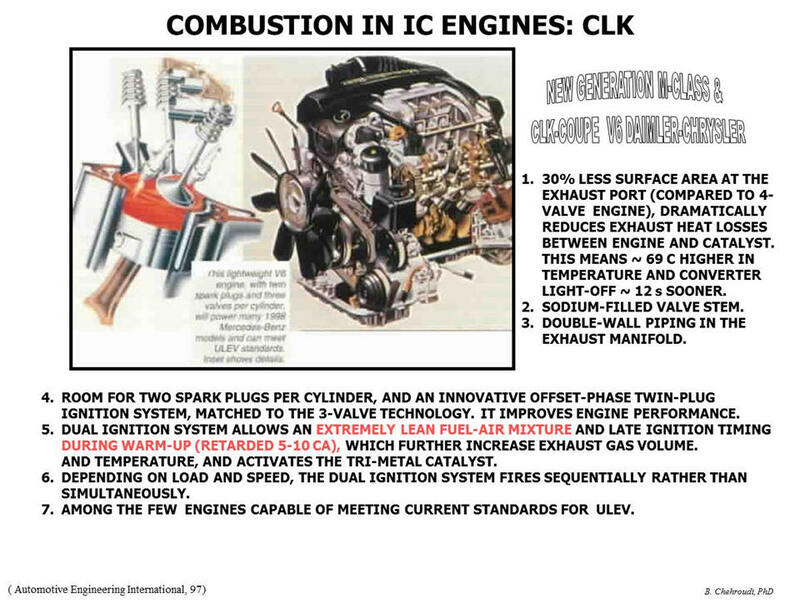 The objective of the seminar was to present adequate information on combustion and emission of pollutants for GDI engines in order to elevate attendee's background knowledge for an intelligent application and comfortable understanding of the existing body of knowledge in direct injection spark ignition engines. 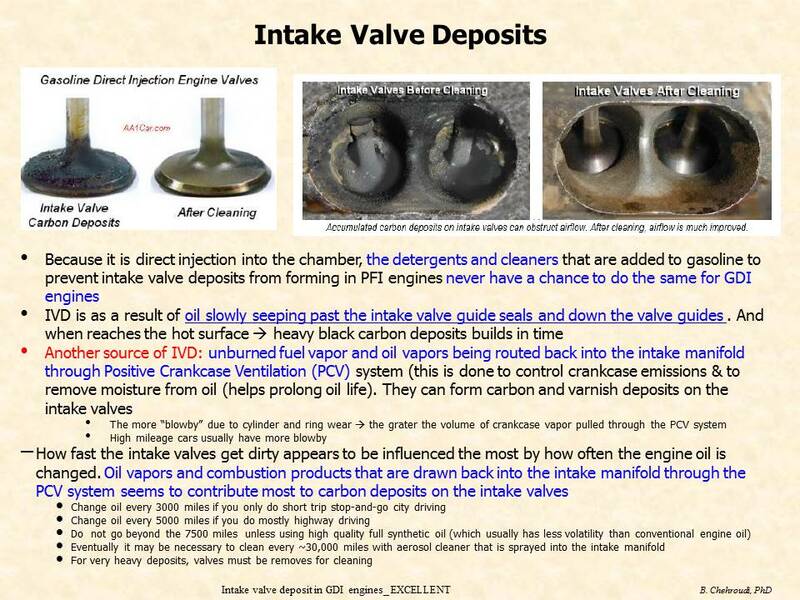 There were heated discussions about the injector and intake value deposits on GDI engines and some of the causes and potential remedies were discussed. Representatives from the following companies have attended. On an invitation by the American Society of Mechanical Engineers (ASME), Dr. Chehroudi has conducted a three-day seminar on Effective Management of Research and Development Teams and Organizations in Sacramento, California from April 13 to 15, 2015. Attendees from automotive, pharmaceutical, and aerospace industries as well as national and international government research organizations have attended this seminar. A Table of Content of the seminar is given here. There were numerous case studies which provided ample opportunities for the highly-educational interaction amongst the attendees, directed by Dr. Chehroudi. Attendees are divided into several teams and engage in a design a R&D division from a fictitious corporation. After completion of the design phase, teams discuss and critique each other to enhance intra-team learning and realize advantages and disadvantages of their designs. Dr. Chehroudi also provides his comments. On March 15, 2015, Dr. Chehroudi, as a senior member of the AIAA 2014 Best Paper selection committee for the Propellant & Combustion Technical Committee, has finalized his vote. The process was very well organized, meticulous, procedurally rigorous, and took several voting sessions at different stages to converge into the final AIAA Best Paper Award of the year. The following papers were the candidates for the first position. 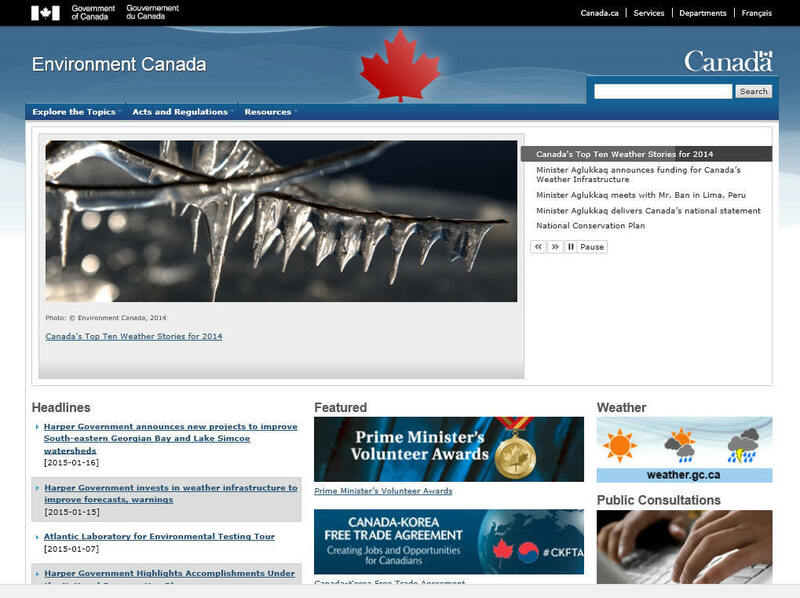 On Tuesday, March 10, 2015, Dr. Chehroudi was invited to Environment Canada, Ottawa, ON, to conduct a two-day presentation. Dr. Chehroudi has presented his views pertaining to the effects of gasoline fuel composition, renewable fuels, and additives on combustion efficiency, emission of pollutants, and performance of automotive engines. Below is a preliminary table of contents of the presentation. Presentation was followed by a consulting session exploring areas of mutual interest and future collaboration. _What is a fuel vapor pressure and vapor lock? 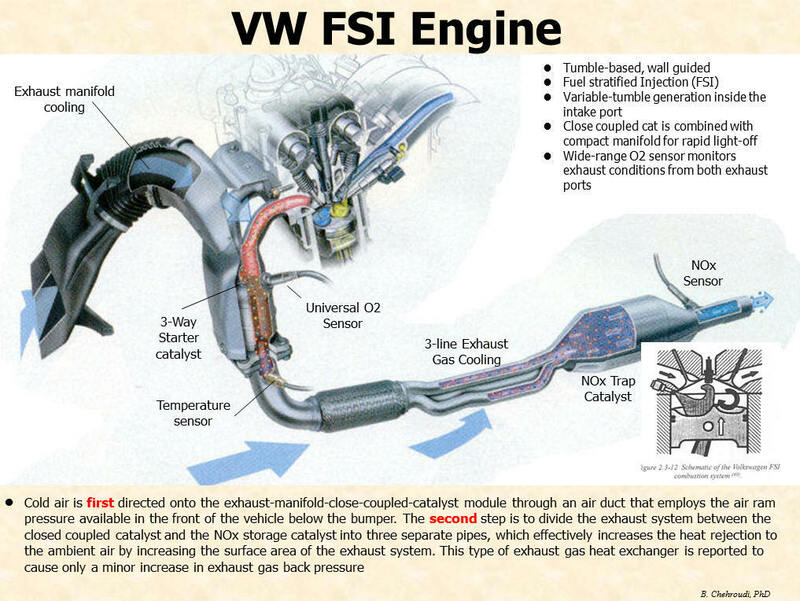 • How can we get A/F by examining the exhaust gases? And why? • What is heating value of a fuel? • What is cyclic variability and why it is important? On Monday, March 2-4, 2015, Dr. Chehroudi presentd a three-day seminar sponsored by the United States Society of Automotive Engineers (SAE), Troy, Michigan, on Advances in Combustion and Emission of Pollutants from engines used for automotive industry. 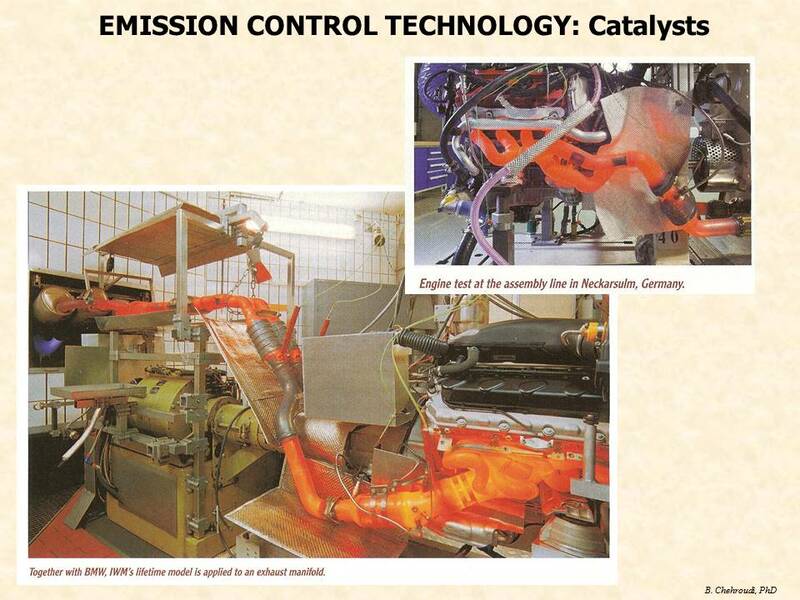 Topics revolved around advanced combustion technologies to simultaneously improve fuel economy and bring down the engine-out emission of regulated pollutants. There has been a series of lectures and discussions to understand the rationale behind these advanced technologies. 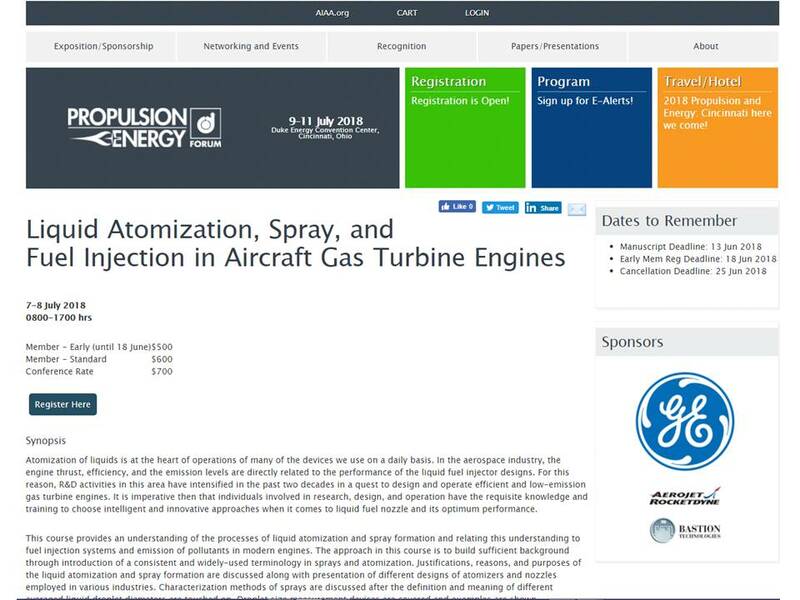 On Monday, Jul 28, 2014, Dr Chehroudi's proposal for a new professional seminar on Liquid Atomization, Sprays, and Fuel Injection in Gas Turbine Engines has been approved by the Propellant and Combustion Technical Committee of the American Institute of Aeronautics and Astronautics (AIAA). 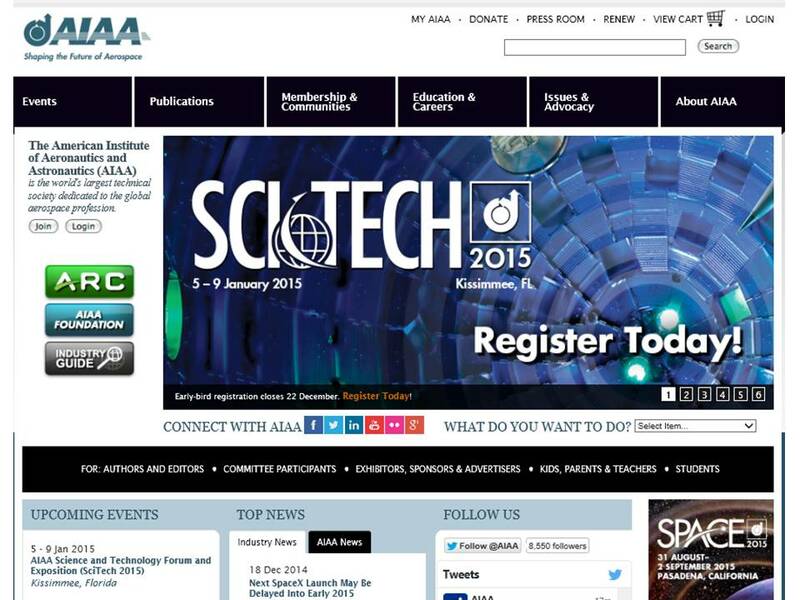 On Monday, January 5-7, 2015, Dr. Chehroudi will be attending the SciTech 2015 Conference, organized by the American Institute of Aeronautics and Astronautics (AIAA) to chair a session (Monday, Jan 5th, 9:30 am to 12:30 am) on Sprays and Droplet Combustion. The conference will be held in Kissimmee, Florida, USA. Presentations will be made from the following organizations: California Institute of Technology, Jet Propulsion Laboratory, Cornell University, University of Buffalo, Naval Air Force Research Laboratory (Aerospace Systems Directorate), Argonne National Laboratory, Imperial College London, University of Florida (Gainsville), Mississippi State University. As a member of the AIAA Propellant & Combustion Technical Committee, Dr. Chehroudi will be attending the committee meeting on Monday, January 5, 2015 in which discussions will be held on issues pertaining to technical publications, continuing education, organizing the technical sessions in AIAA conferences, best paper awards, etc and decisions are made. Strict and precise control of the autoignition process is at the heart of the HCCI engine operation and the central technology barrier being addressed here through a hitherto-nonexistent and innovative light-activated volumetrically-distributed ignition technology. Based on the test results so far, this new ignition method is now considered as a potential enabling technology for volumetric and distributed ignition of liquid fuel sprays as well as gaseous fuel-air mixtures with the lowest incident power intensity possible. This means remote and spatial ignition of th charge within any desired and adjustable region inside the cylinder defined by the shape of the light from a pulsed light source. Test results indicated that average intensities in between 10 to 150 W/cm2 are required for ignition of single-walled carbon nanotubes (SWCNTs). This is a factor of 80 less than anything relevant reported in the literature. Results from a premixed gaseous fuel-air mixture in a cylindrical combustion chamber, comparing a spark plug with the light-activated volumetrically-distributed ignition of SWCNTs, confirmed the author’s patented original concept and showed that a truly on-demand activation of the autoignition process for the homogeneously-charged compression-ignition (HCCI) engine is feasible. Faster (but adjustable) fuel-air mixture burn rate reaching up to a factor of 3 has been demonstrated for distributed ignition under lean fuel-air mixture as compared with that of a conventional electric-discharge spark ignition system. A preliminary single-cylinder engine study tends to suggest feasibility in an operating engine. 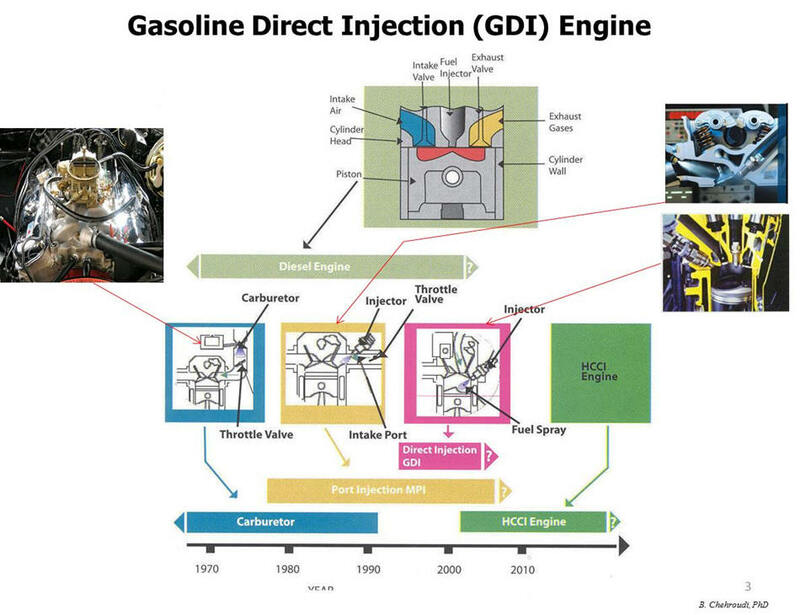 esentation was focused on an overview of the GDI technology and how fast it is evolving, future penetration and substitution of the conventional multi-port fuel injection system. During this visit, Dr. Chehroudi met with director of engineering and product design and several senior managers. Also, there were discussions as to ATC's engagement modes in UCI-FRAM Group's future interest entering into the GDI market. 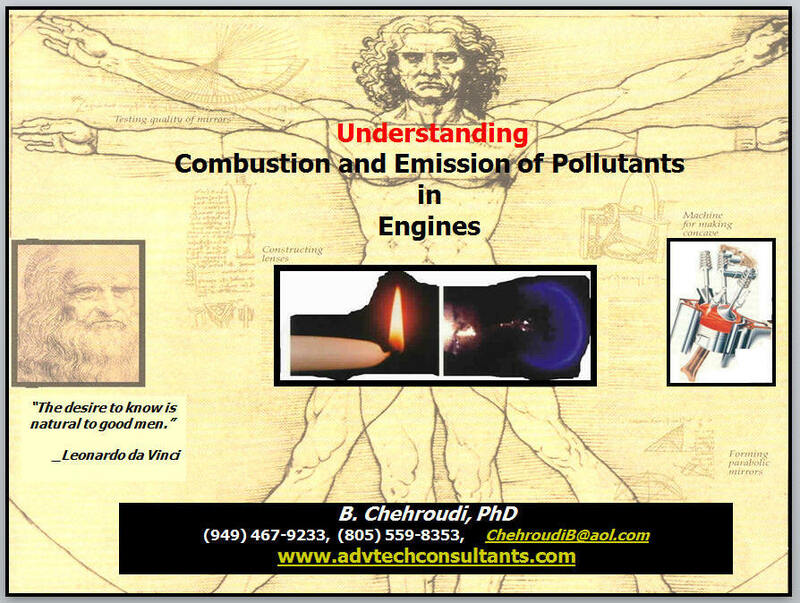 On Monday, August 18, 2014, Dr. Chehroudi has delivered a 3-day seminar on Combustion and Emission of Pollutants from Automotive Engines at the Society of Automotive Engineers facility in Troy, Michigan. Thorough and in-depth understanding of the thermodynamics and chemistry of combustion is at the heart of the intelligent approach towards control of the engine combustion and emission of pollutants. To this end, Dr. Chehroudi's seminar covers key aspects of the combustion of the fuel air mixtures for best fuel economy and lowest emission of the harmful and regulated pollutants. The objective of this seminar was to present adequate information on combustion and emission of pollutants for gasoline fueled SI engines in order to elevate attendee's background knowledge for an intelligent application and comfortable understanding of the existing body of knowledge. The presentation style was designed to be "physical and intuitional" than mathematical and concepts are promptly related to applications. 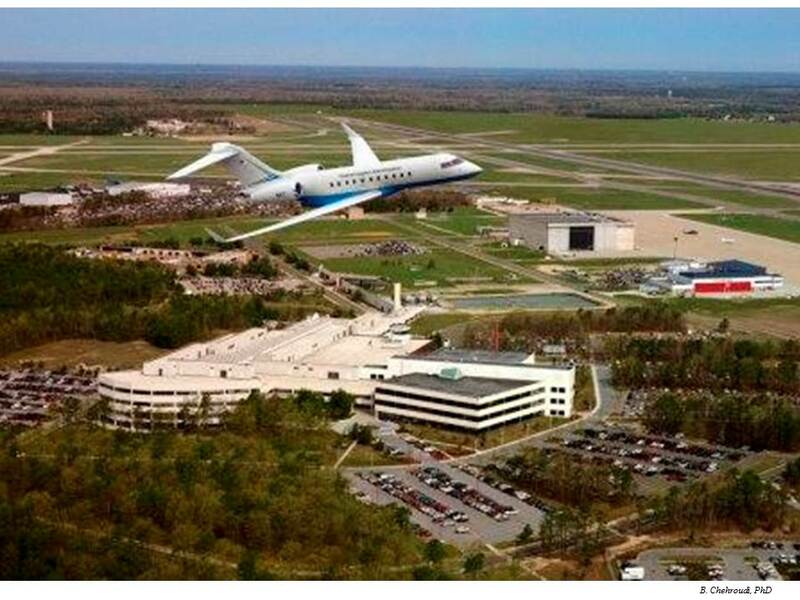 On Monday, August 11, 2014, Dr. Chehroudi has delivered an Invited Presentation at the Federal Aviation Administration, FAA William J. Hughes Tech Center, Atlantic City International Airport, New Jersey. The topics presented were targeted towards the combustion and emission of the next generation of the fuels to be used in the aircraft engines. Dr. Chehroudi was given a tour of the facilities such as engine research laboratory and fire research and investigation laboratory. There were several meetings in which Dr. Chehroudi had the opportunity to speak with the director of the laboratory and other key senior personnel. Avenues for possible future collaborations in areas pertaining to fuels and combustion were explored. 1430 hrs: AIAA-2014-3569. On The TFNS Sub-Grid Models for Liquid-Fueled Turbulent Combustion. N. Liu, T. Wey, NASA Glenn Research Center, Cleveland, OH. 1500 hrs: AIAA-2014-3570. Experimental study on the droplet evaporation process and influence factors Y. Ting, Academy of Equipment, Beijing, China. 1530 hrs: AIAA-2014-3571. Supercritical Pseudo-Boiling and its Relevance for Transcritical Injection, D. Banuti, K. Hannemann, German Aerospace Center (DLR), Göttingen, Germany. 1600 hrs: AIAA-2014-3572. Performance Prediction of Apogee Attitude and Orbit Control Thruster for MMH/NTO Hypergolic Bipropellant, Z. Lianbo, X. Xu, Beihang University, Beijing, China. 1630 hrs: AIAA-2014-3573. 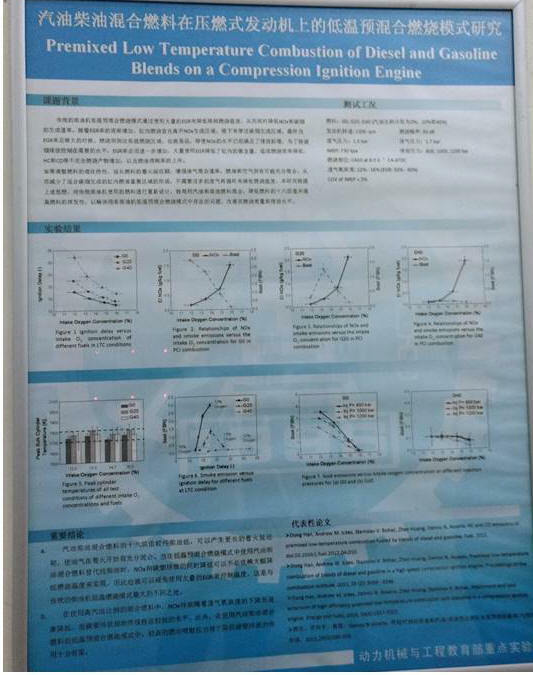 Agglomeration characteristics of aluminum particles with changing pressure in AP/AN composite propellants, K. Takahashi, S. Sakai, M. Nakagaki, T. Sasaki, T. Kuwahara, Nihon University, Funabashi, Japan; T. Shimada, Japan, Aerospace Exploration Agency (JAXA), Sagamihara, Japan. As a member of the AIAA Propellant & Combustion Technical Committee, Dr. Chehroudi attended the committee meeting on Monday July 28, 2014 in which discussed issues pertaining to technical publications, continuing education, organizing the technical sessions in AIAA conferences, best paper awards, and technical liaison-ship (on air breathing propulsion systems, gas turbine engines, solid/liquid rockets, high-speed air breathing propulsion, and standards on CFD) were discussed and decisions made. 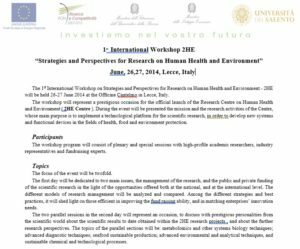 Dr. Chehroudi was an Invited Speaker at the First International Workshop 2HE on “Strategies and Perspectives for Research on Human Health and Environment” hosted at the Universita Del Salento, Lecce, Italy. The workshop is sponsored by the Union Europea (Fondo Europeo di Sviluppo Regionale), PON Ricerca e Competitivita, Ministero dell Istruzione dell Universita e della Ricerca, Ministero della Sviluppo Economico, and the Uniersita del Salento. June 26-27, 2014. The tiitle of Dr. Chehroudi’s talk was: “Nanotechnology, Graphene, and a Select Number of Applications in Fuel Energy”. 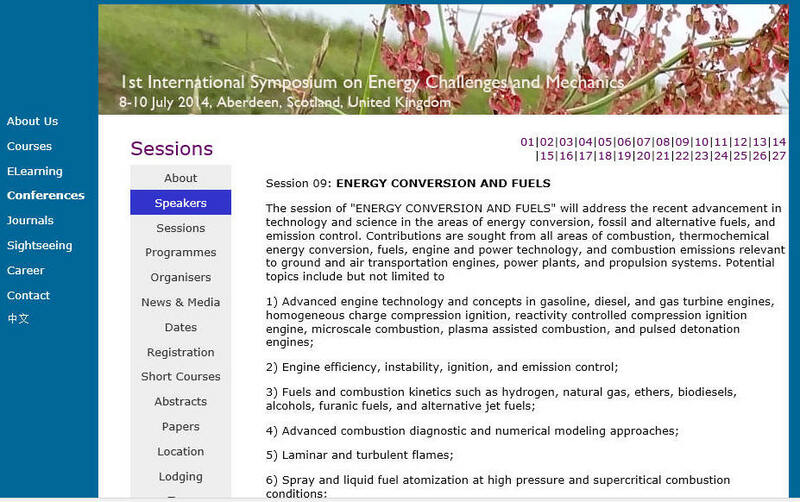 On July 8-10, 2014 Dr Chehroudi is an invited Session Speaker at the 1st International Symposium on Energy Challenges and Mechanics held in Aberdeen, Scotland, United Kingdom. The subject of his talk will be on the application of nanotechnology in ignition and combustion of fuels in engines. His talk will be in the Energy Conversion and Fuels session. 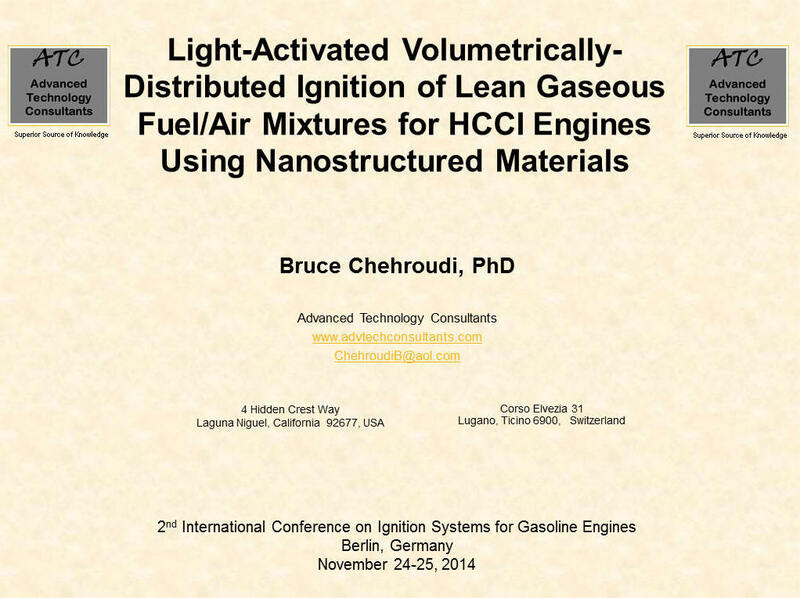 His talk is titled "Volumetric Ignition Control for HCCI Engines Using Nanostructured materials and Light". For more details click on the image at right. On Monday, May 19-21, 2014, Dr. Chehroudi has delivered a 3-day seminar on Gasoline Direct Injection at the SAE Professional Education Center, Troy, Michigan. This seminar was sponsored by the SAE International. This is a highly updated version of the seminar introduced in 2010 which has become a very popular professional seminar to attend amongst R&D/application engineers, researchers, technical managers, regulators, and policy makers. The objective of the seminar was to present adequate information on combustion and emission of pollutants for GDI engines in order to elevate attendee's background knowledge for an intelligent application and comfortable understanding of the existing body of knowledge in direct injection spark ignition engines. On Tuesday, May 6, 2014, Dr. Chehroudi paid an invited visit to the Mechanical Engineering Department of the University of British Columbia, Vancouver, British Columbia. Dr. Chehroudi was hosted by Prof. Pat Kirchen for a tour of the engine research laboratory and other related test setups. In particular, two projects were highlighted in which natural gas was directy injected into the chamber and pilot ignited by a diesel fuel. 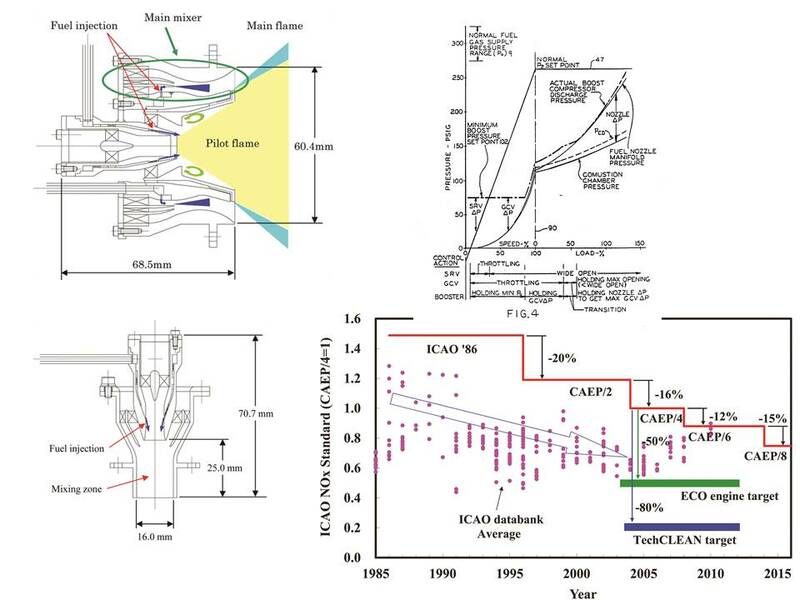 The objective of one of the projects was to redesign a single-cylinder engine for optical access to perform optical diagnostics such as spectroscopic, LDV, PIV, etc. 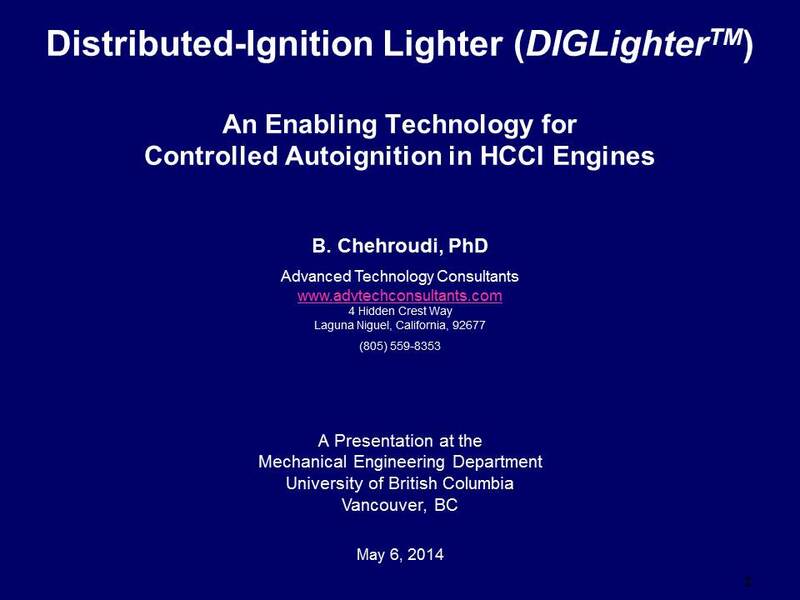 Dr. Chehroudi also delivered a presentation titled "Distributed-Ignition Lighter: An Enabling Technology for Controlled Autoignition in HCCI Engines". He has shown some recent results on this novel ignition strategy and discussed the technology roadmap for this ground-breaking invention. A broad range of applications of the phenomenon was also presented and potential future success of each was assessed. 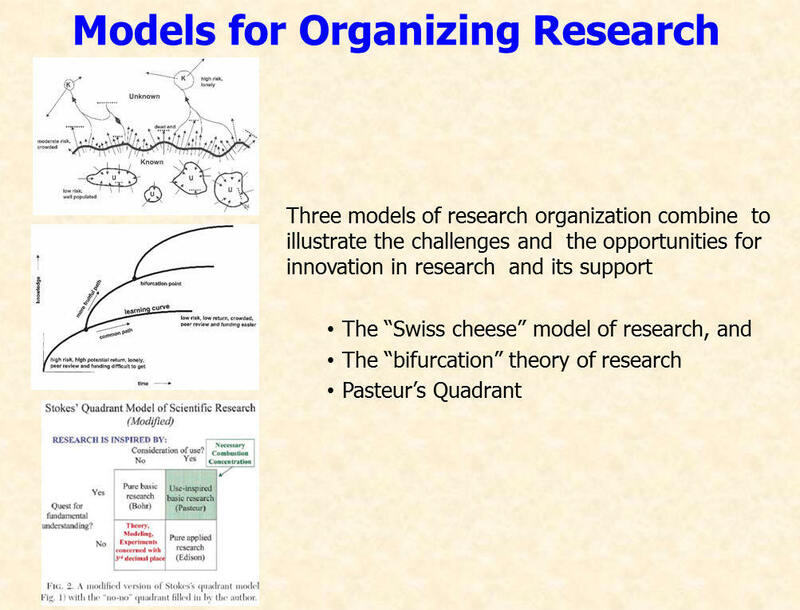 On March 31 to April 2, 2014, Dr. Chehroudi has presented his perspective and experiences on Management of Research and Development teams and organizations in Portland, Oregon. The program was sponsored by American Society of Mechanical Engineering (ASME). Managing the productivity and excellence of an R&D organization offers a unique set of problems and unusual challenges. This uniqueness arises from two basic facts: (1) the character of the enterprise, and (2) the highly-specialized, articulate, and autonomous people involved in R&D. 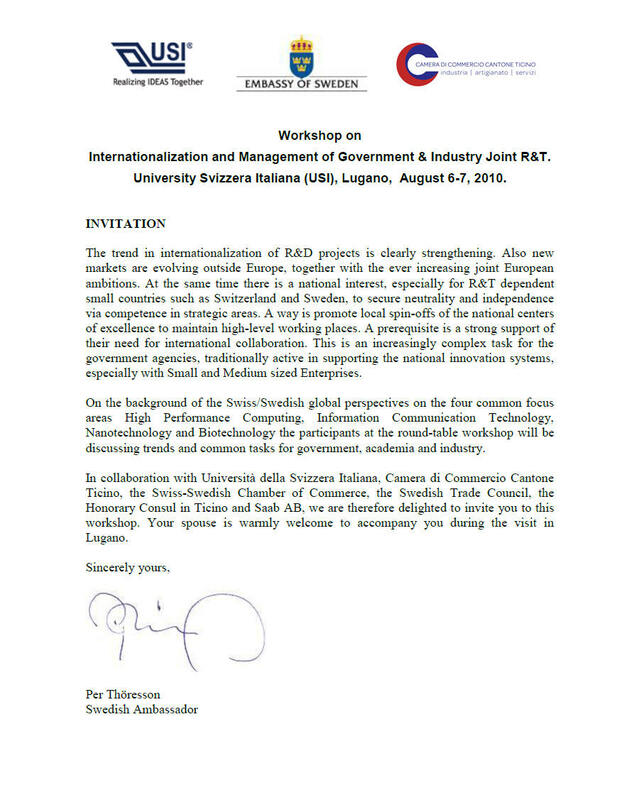 This seminar explains how managing an R&D organization is largely an art of integrating the efforts of diverse, creative, intelligent, and independent individuals. It will offer a concise, yet effective, overview of the management issues and their solutions. The ideas presented in this course consist of the work of a multitude of experts and focus on ways to improve the productivity of R&D. It is designed to bring the attendees to a stage where they can apply this information and to foster excellence and innovation in their R&D organization. On Monday, March 3, 2014, Dr. Chehroudi delivered a 3-day professional education seminar at the Society of Automotive Engineers Professional Education Center, Troy, Michigan. He presented a comprehensive view of the combustion in IC engines and ways/means to reduce emission of pollutants while simultaneously improving engine fuel economy. Attendees also had initial discussions on several possible projects in which Dr. Chehroudi could play as a consultant. Dr Chehroudi was invited to the ARAMCO facility on Feb 27, 2014, Houston, Texas to discuss his ideas on R&D and technology management for advanced research and technology teams within multinational corporations. He shared his successful approaches used in the past, specifically on application of nanotechnology in energy and automotive industries. Additionally, discussions revolved around how to develop a robust short, medium, and long term forecasts for overall fuel efficiency gains in the passenger and commercial fleets, as well as outlooks for the penetration of non-petroleum fuelled vehicles (such as natural gas or electric vehicles), focusing on key automotive markets. Also discussed were status of automotive markets and road transport activities in key demand centers, as well as policy changes and other important events that may affect automotive fuel economy in the future. Dr. Chehroudi's expertise in emission of pollutants on gas turbine engines has been solicited by the American institute of Aeronautics and Astronautics (AIAA) to review a book titled Gas Turbine Emissions, edited by Tim Lieuwen and Vigor Yang, published by the Cambridge University Press. It is to be polished by the AIAA Journal soon in 2014. 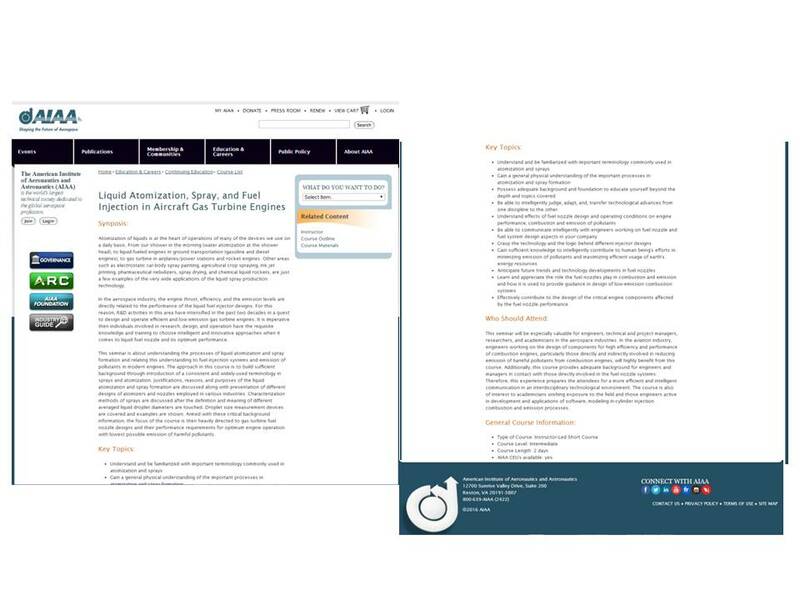 Download the full review of the Gas Turbine Emission Review from ATC site. Experimental investigation of laboratory fire whirls, by Katherine Hartl and Alexander Smits, from Princeton University. 2. Laser diagnostic mapping of temperature and soot statistics in a 2-m diameter turbulent pool fire, by Sean Kearney, from SANDIA National Laboratory. 3. Experimental investigation of boundary layer flashback in swirl flames, Dominik Ebi and Noel, Clemens. 4. Oscillatory flame reponse in acoustically driven fuel droplet combustion, by Brett Lopez, Cristhian Sevilla, Takeshi Shoji, Ari Ekmekji, Owen Smith, and Ann Karagozian, from UCLA. 5. 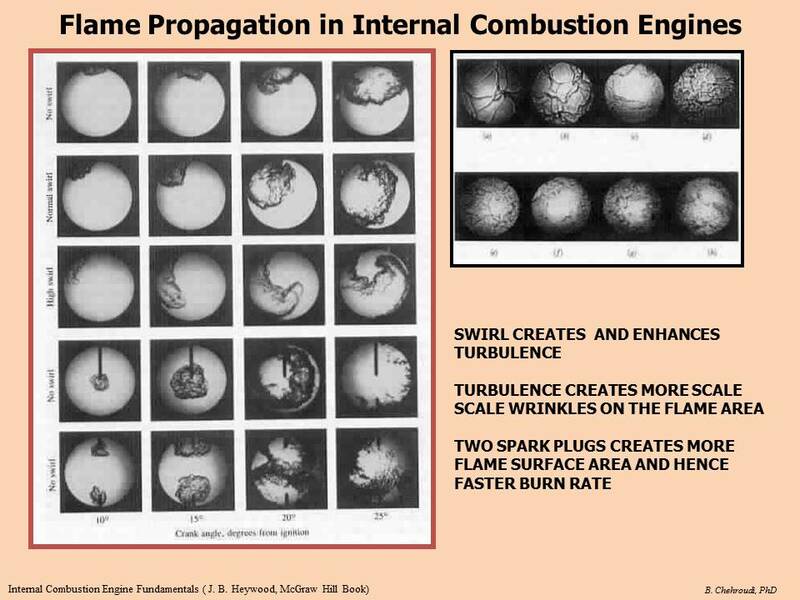 Similariyu and scaling of turbulent flame speeds for expanding premixed flames, by Fujia Wu, Abhishek Saha, Swetaprovo Chaudhuri, Sheng Yang, and C. K. Law, from Princeton University. 6. Structure and dynamics of a reacting jet in a swirling vitiated crossflow, by Pratikash Panda, Mario Roa, and Robert Lucht, from Purdue University. 7. 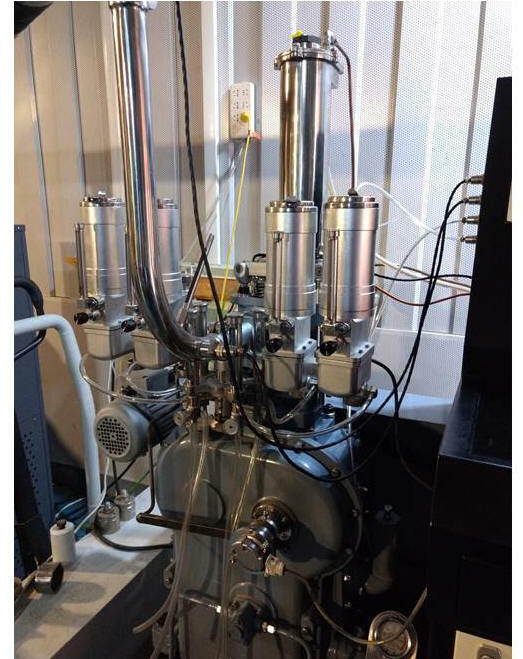 Construction and characterization of a shock tube for ignition and pollutant formation studies, by Cory Prykull, Robert Dreiker, Marcos Fernandes, Mazen Eldeeh, Ben Akih-Kumgeh, from Syracuse University. 8. Schlieren imaging of chemically-induced flow instabilities during step-growth polymerization, by Patrick Bunton, Michael Rawat, Simone Stewart, Anne De Wit, John Poiman. 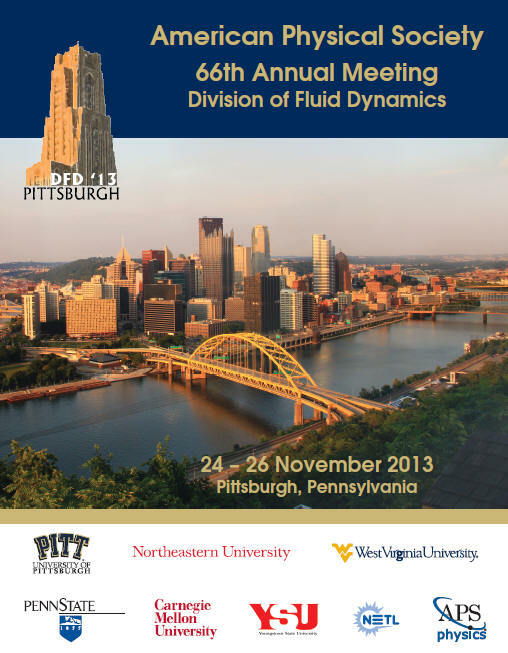 For more information see: http://www.apsdfd2013.pitt.edu/ or http://www.aps.org/units/dfd/meetings/meeting.cfm?name=DFD13 . On November 18-20, 2013, Dr. Chehroudi has presented his perspective and experiences on Management of Research and Development teams and organizations in San Diego, California. The program was sponsored by American Society of Mechanical Engineering (ASME). This seminar explained how managing an R&D organization is largely the art of integrating the efforts of diverse, creative, intelligent, and independent individuals. It also offered a concise, yet effective, overview of the management issues and their solutions. The ideas presented in this course consist of the work of a multitude of experts and focused on ways to improve the productivity of R&D. The seminar is designed to bring the attendees to a stage where they can build upon and apply the information disseminated and to foster excellence and innovation in their R&D organization. On Monday, August 19, 2013, Dr. Chehroudi delivered a 3-day professional education seminar at the SAE Professional Education Center, Troy, Michigan. 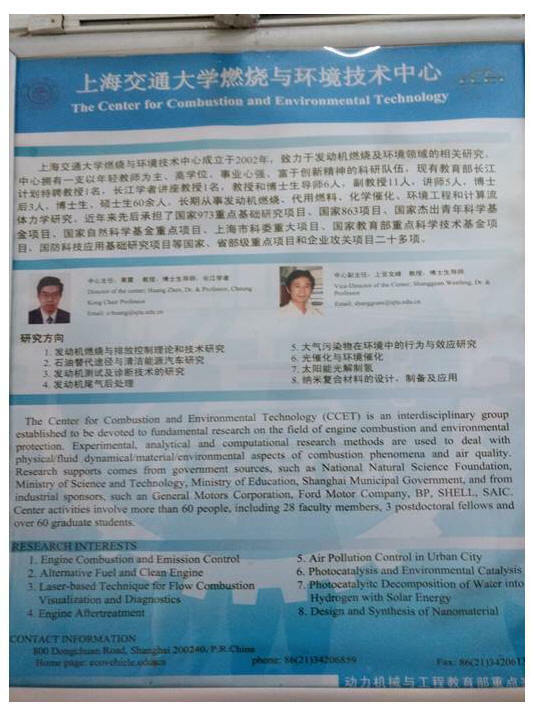 He presented a comprehensive seminar on Combustion and Emission of Pollutants for engineers to enhance physical, chemical, and engineering aspects of combustion in internal combustion engines. This seminar is one of the longest-lasting and most popular activity with people attending from a variety of industries possessing a broad range of background and expertise. 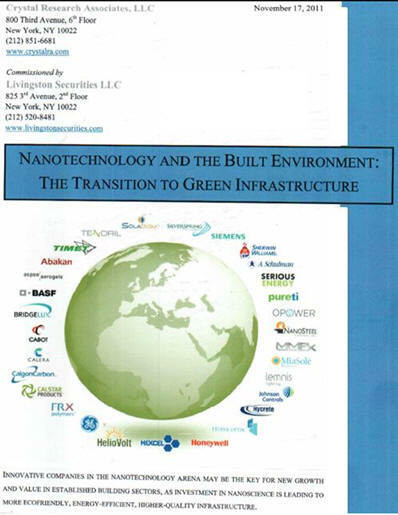 On Monday, August 12, 2013, Dr. Chehroudi has submitted a Book Review on Nanotechnology to the Journal of Nanotechnology in Engineering and Medicine Journal. 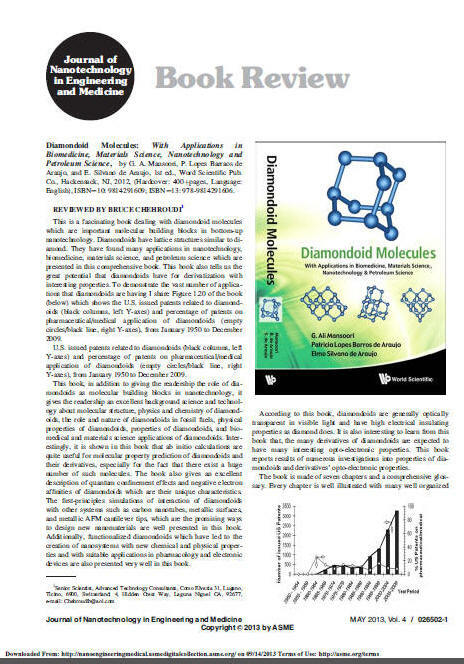 The title of the book reviewed is "Diamondoid Molecules: With Applications in Biomedical Materials Science, Nanotechnology and Petroleum Sciences," by Mansoori et al., ISBN-10:9814291609, Journal of Nanotechnology in Engineering and Medicine Journal. (To appear soon). Read the review by clicking on the title of the book. On Monday, August 5-7, 2013, Dr. Chehroudi has delivered a 3-day seminar on Gasoline Direct Injection at the SAE Professional Education Center, Troy, Michigan. This seminar was sponsored by the SAE International. This is a new seminar he introduced in 2010 and has become a very popular professional activity amongst R&D/application engineers, researchers, technical managers, regulators, and policy makers. The objectives of the seminar were to present adequate information on combustion and emission of pollutants for GDI engines in order to elevate your background knowledge for intelligent application and comfortable understanding of the existing body of knowledge. 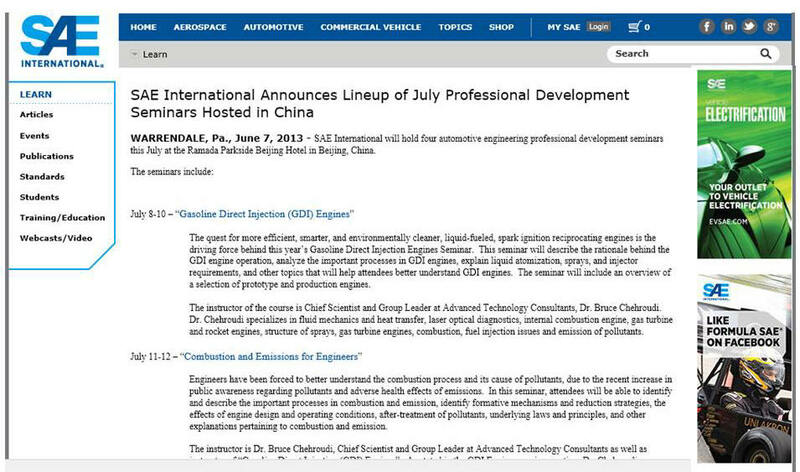 On July 8 to July 12, Dr. Chehroudi is planned to present two of the SAE's most popular seminars on Combustion and Emission of pollutants and Gasoline Direct Injection Engines in Ramada Parkside Hotel, Beijing, China. For more information, click here. resent and discuss author’s perspectives for management of innovation and creativity in new product development, particularly during the early stages of the ideation process, and how design education at the university level can be improved to train 21st century multidisciplinary engineers addressing the current and future needs of the world and industry. The presentation also addressed administration and management of an engineering department, in particular, mechanical engineering. The content of the talk addressed issues and effective approaches for administrative philosophy, leadership style, key to effective leadership/management, recipe for organizational success, the 21st century engineer and engineering needs, skills engineers need to pursue, teaching assessment and effectiveness, conceive-design-implement-operate engineering education methodology, strategic planning for the engineering department, and ABET accreditation., June 18-20, 2013. On Monday, May 20-22, 2013, Dr. Chehroudi has delivered a 3-day seminar on Gasoline Direct Injection at the SAE Professional Education Center, Troy, Michigan. This seminar was sponsored by the SAE International. 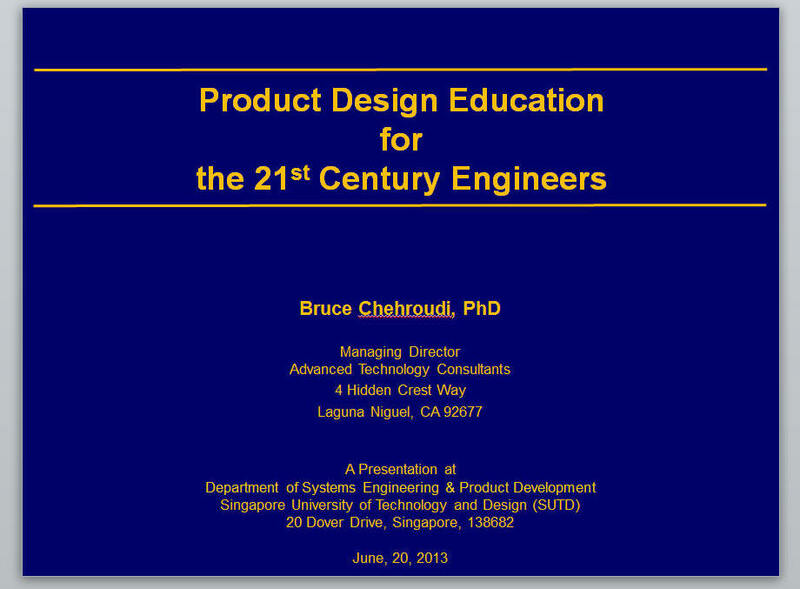 This is a new seminar he introduced in 2010 and has become a very popular professional activity amongst R&D/application engineers, researchers, technical managers, regulators, and policy makers. The objectives of the seminar were to present adequate information on combustion and emission of pollutants for GDI engines in order to elevate attendee's background knowledge for an intelligent application and comfortable understanding of the existing body of knowledge in the field. Additionally, the seminar is about “Understanding” and it is “Liquid Sprays”, “Combustion” and “Emissions” in the context of the GDI engines. 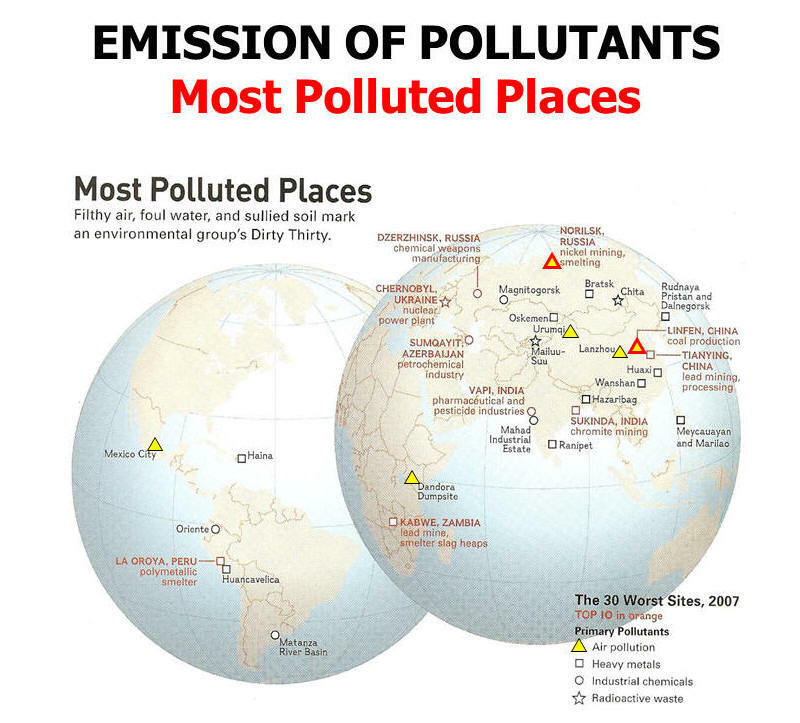 Note that combustion and emission are so intertwined and interrelated that when we speak of combustion, in a sense, we are covering critical aspects of understanding emission of pollutants. As the seminar is about understanding combustion and the underlying reasons/origins of the regulated emission of pollutants, sufficient background on liquid atomization and combustion fundamentals is important. It is only through such a foundation that one can comfortably grasp the causes of pollutants formations and effects of design and operating parameters. The presentations/discussions on liquid atomization and combustion are to provide adequate background and precondition the attendees for a better understanding of the GDI engine combustion and emission issues. 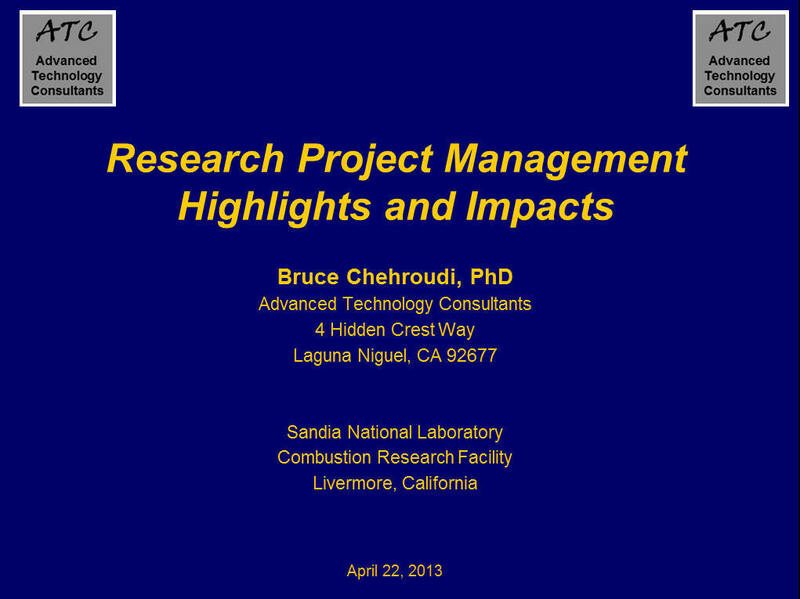 On Monday, April 22, 2013, Dr. Chehroudi has given an invited presentation at Department of Energy (DOE) Sandia Combustion Research Facility (CRF) in Livermore, California. He has shared his views of R&D management to a group consisting of R&D manager, and research principal investigators. The purpose was to explain Dr. Chehroudi's perspective on effective management of R&D teams and organizations. He has presented a select sample of six past medium- to large-scale R&D projects he managed to explain effective means for producing award-winning, highly-valuable, and successful outcomes of national and international importance. The projects were liquid fuel spray and DISC engine, swirl-stabilized combustor for gas turbine engines, interacting-sprays for simultaneous soot and NOx reduction, supercritical combustion in cryogenic rockets, combustion instability, and finally on a synergy amongst nanotechnology, optics, and chemical reaction. On Monday, March 11, 2013, Dr. Chehroudi delivered a 3-day professional education seminar at the SAE Professional Education Center, Troy, Michigan. This seminar is one of the longest-lasting and most popular activity with people attending from a variety of industries possessing a broad range of background and expertise. Why understanding innovation is important? On Thursday, January 10, 2013, Dr. Chehroudi, jointly with Prof. Hukam Mongia, chaired the Advanced Concepts II and IC Engines session of the 51st AIAA Aerospace Sciences Meeting Including the New Horizon Forum and Aerospace Exposition in Grapevine (Dallas / Ft. Worth Region), Texas at Gaylord Texan Hotel and Convention Center. The following authors presented their works in this session. On January 7, 2013, Dr. Chehroudi was invited to the Toyota Technical & R&D Center at Ann Arbor, Michigan, to conduct a seminar on current state and advanced in Gasoline Direct Injection Engines. As part of the visit, he has met powertrain design and calibration group members and managers and had discussions about their current and immediate needs on Toyota direct injection engine calibration. 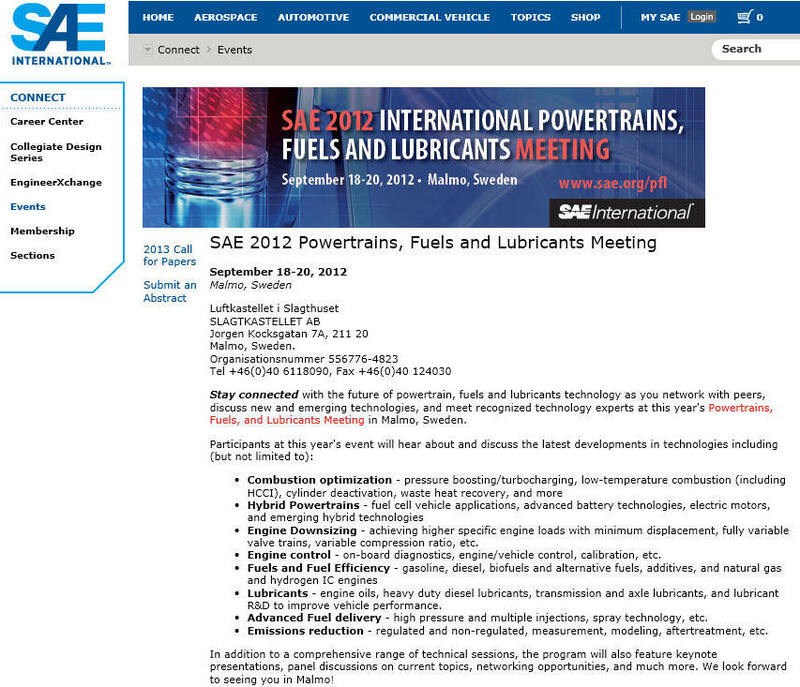 On September 17-19, 2012, Dr. Chehroudi was an invited speaker at the international Powertrains, Fuels & Lubrications Meeting, Malmo, Sweden. 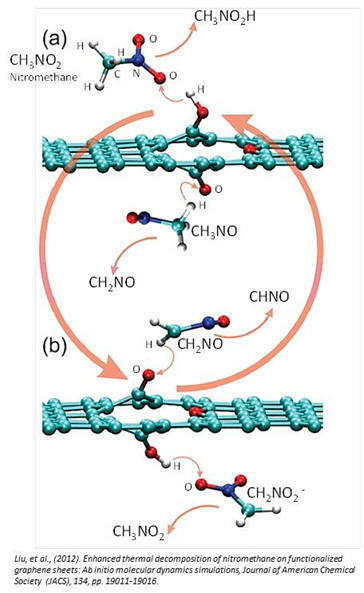 The title of his work was Activation and Control of Autoignition in HCCI Engine Using Volumetrically-Distributed Ignition of Single-Walled Carbon Nanotubes (Paper no. 12FFL-0052,). 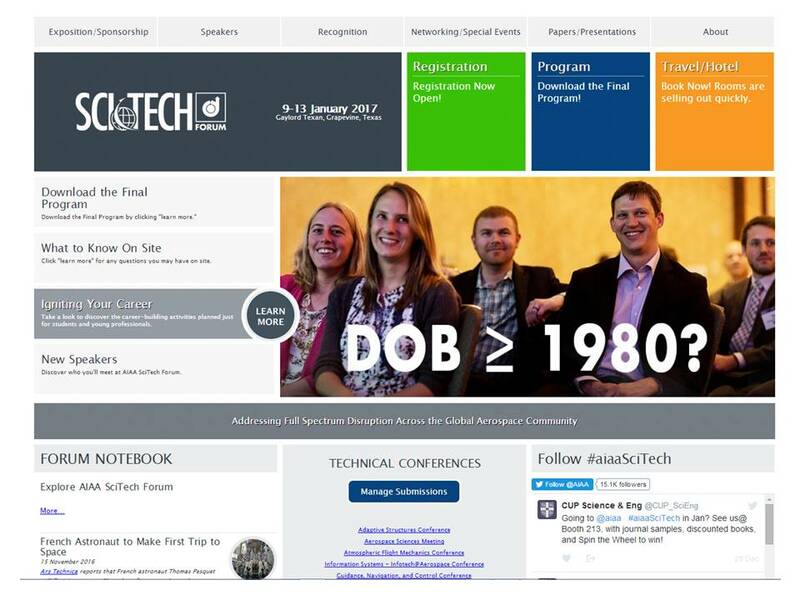 For more details see http://www.sae.org/calendar/techsess/198611.pdf. The Abstract of the work is given below. Also, a recording of the presentation can be found at https://www.dropbox.com/s/7y9uevbi3zakr1d/Chehroudi_Distributed%20Ignition_HCCI.mp4?dl=0 (click on the link, then use the Download button at the upper right corner to download the file first and then play. Otherwise, the end of the presentation is truncated for an unknown reason being investigated). The discovery that nanostructured materials exhibit properties different than their bulk materials provided many exciting opportunities with technological applications. One such opportunity is the observed ignition of the single-walled carbon nanotubes (SWCNTs) with an ordinary camera flash. In this paper, light-activated ignition characteristics of the as-produced SWCNTs (50 wt% iron nanoparticle content) with a camera flash are presented. The primary objective of this work is to use nanostructured materials as means for distributed (or volumetric) ignition and improved combustion in propulsion systems. 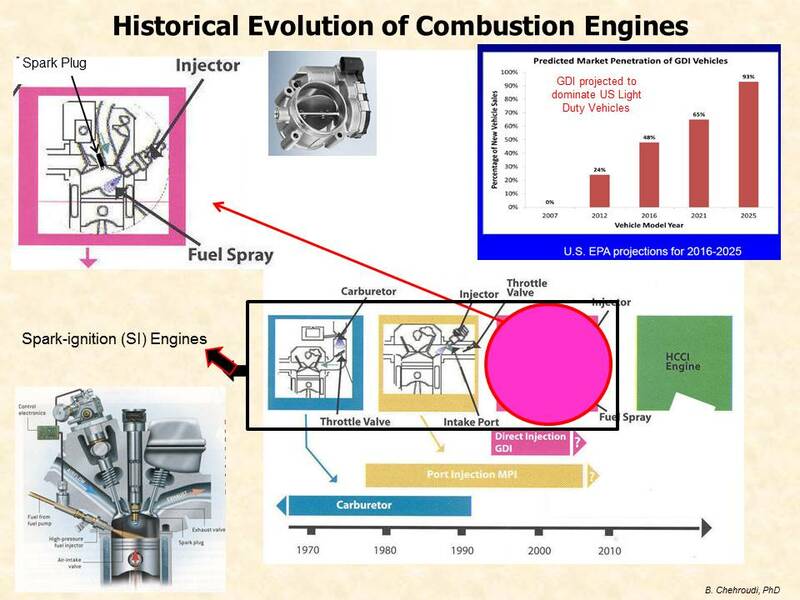 Important examples are homogeneous-charged compression ignition (HCCI) engines, liquid rocket fuel sprays, and enhanced flame stabilization in gas turbine engines. The idea was originally proposed by the author in April 2003 and the first patent filed in July 2004 following a series of initial investigations. Based on these and additional tests, this new ignition method is now considered as a potential enabling technology for volumetric and distributed ignition of liquid fuel sprays or gaseous fuel-air mixtures with the lowest incident power intensity possible. This means remote and spatial ignition within any desired and adjustable region defined by the shape of the light from a pulsed light source. Average intensities in between 10 to 150 W/cm2 are required for ignition of SWCNTs. This is a factor of 80 less than cases where lasers (pulsed and continuous wave (cw)) are used in coal particles. Results acquired in a premixed gaseous fuel-air mixture in a cylindrical combustion chamber, comparing a spark plug with the light-activated distributed ignition of SWCNTs, confirmed the patented concept and showed a truly on-demand activation of the autoignition process for HCCI engine applications. Faster fuel-air mixture burn rate reaching up to a factor of 3 has been demonstrated for distributed ignition under lean mixture as compared with a conventional spark ignition system. For more information Click on the image, or visit www.sae.org/events/itw/2012SummerTechnologyWeek_English.pdf or www.sae.org/events/itw/2012SummerTechnologyWeek_English. Dr. Chehroudi has attended, and chaired a session, at the 48th AIAA/ASME/SAE/ASEE Joint Propulsion Conference and Exhibit (JPC), July 30- August 1, 2012, in Atlanta, Georgia, USA. He has chaired a session on Fuels and Propellants on Tuesday, July 31, 2012. In this session, recent R&D works pertaining to experimental and computational aspects of fuels/propellants used in gas turbine and liquid rocket engines are discussed. For more details see FinalTechnicalProgram_JPC_IECEC12_24Jul.pdf or FinalTechnicalProgram_JPC_IECEC12_24Jul. 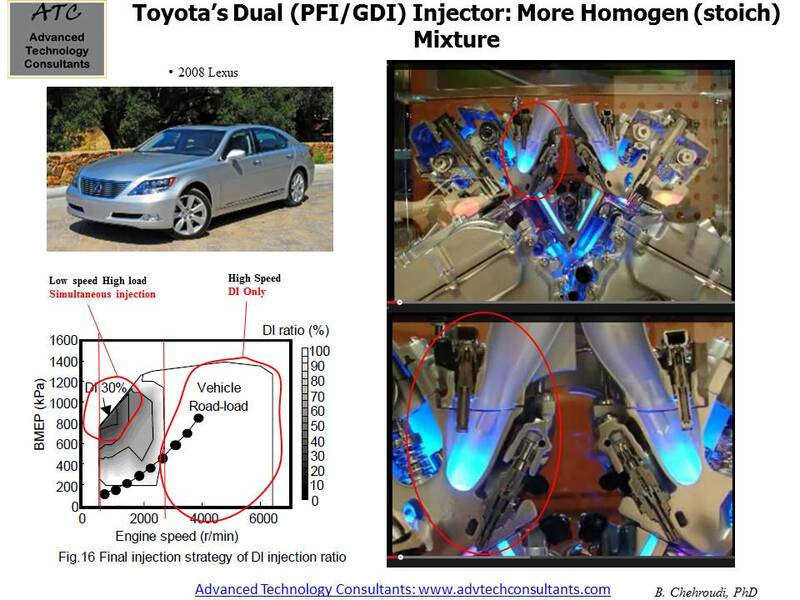 On July 23, 2012, Dr. Chehroudi was invited to the Toyota Technical & R&D Center at Gardena, California to conduct a seminar on current state and advances in gasoline direct injection engines. During this visit, Dr. Chehroudi met with senior manager and discussed R&D issues specific to the business unit and explored avenues of future collaborations both in technical and management areas. Also, he was given a comprehensive tour of the facility including test cells, special-purpose laboratories, engineering offices, and other related areas. At the conclusion of the visit Dr. Chehroudi will prepare a proposal to be submitted within a couple of month mapping his views and vision for collaborative efforts. This is envisioned to be a starting point for further discussion to converge to a mutually accepted interaction. 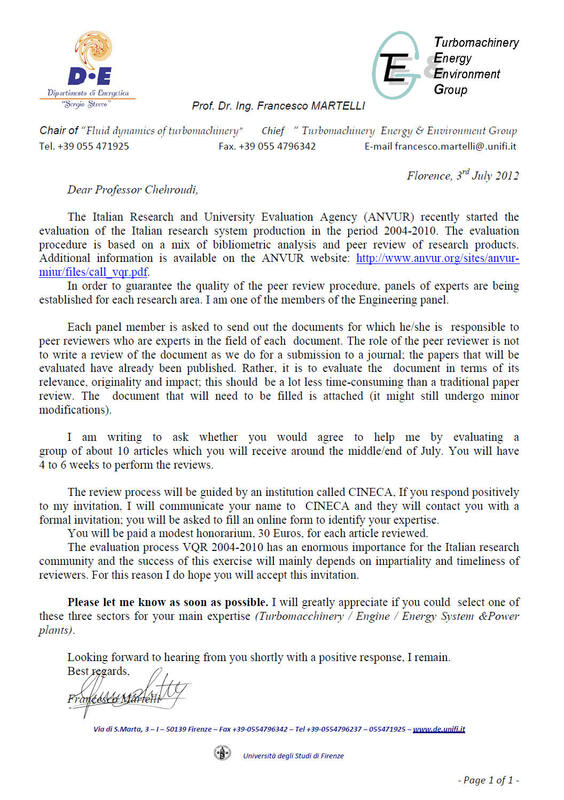 On July 3, 2012, Dr. Chehroudi's expertise in areas of energy conversation systems was solicited as an Invited Reviewer by the National Agency for the Evaluation of University and Research Institutes (ANVUR) and as a member of a panel to evaluate Italian research system production in the period 2004-2010. Prof. Dr Ing Francesco Martelli prepared this invitation.The evaluation procedure was based on a mix of bibliometric analysis and peer review of research products. Each panel member was asked to review documents for which he/she was responsible to peer review who are experts in the field of each document. The evaluation process has an enormous importance for the Italian research community and the success of this exercise mainly depends on impartiality and timeliness of reviewers. Areas assigned: Turbomachinery, Energy, Energy System & Power Plants, 2012. On June 20, 2012, Dr. Chehroudi has delivered a 3-day seminar on Gasoline Direct Injection at the Politecnico Campus at Lingotto, Turin, Italy. This seminar was sponsored by the SAE International. This is a new seminar he introduced in 2010 and has become a very popular amongst R&D/application engineers, researchers, technical managers, regulators, and policy makers. Click on the image for more details. 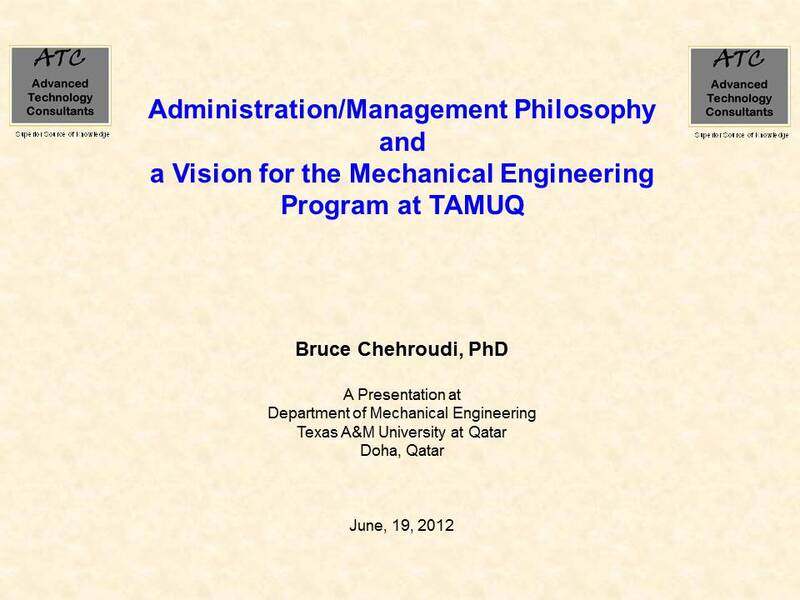 On June 19, 2012, Dr. Chehroudi was an Invited Speaker and Consultant for the Texas A&M University in Qatar, Department of Engineering, to present and discuss author’s perspectives for effective administration and management of an engineering department, in particular, mechanical engineering. The content of the talk addressed issues and effective approaches for administrative philosophy, leadership style, key to effective leadership/management, recipe for organizational success, the 21st century engineer and engineering needs, skills engineers need to pursue, teaching assessment and effectiveness, conceive-design-implement-operate engineering education methodology, strategic planning for the engineering department, and ABET accreditation. Finally, he reviewed pillars of the TAMUQ strategic plan and further discussed as to how his vision and recommended recipes can directly address such important strategic goals and objectives. 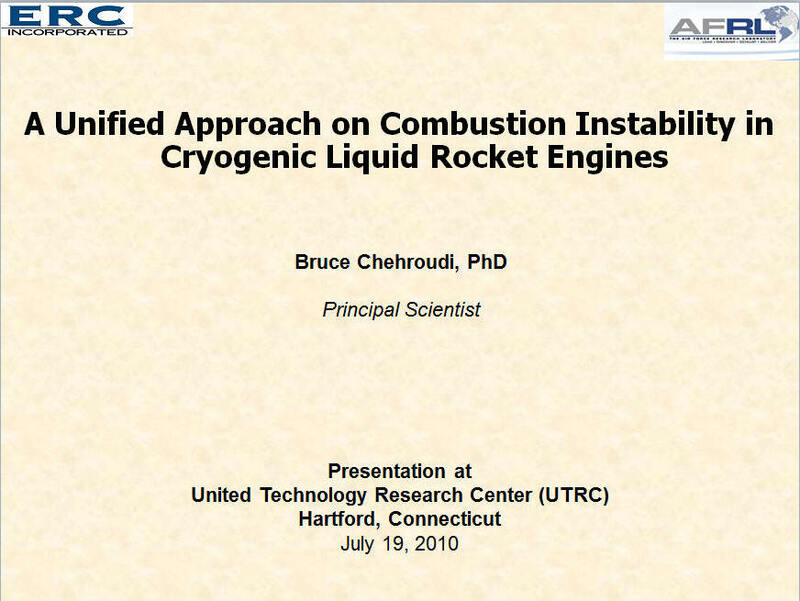 On June 11, 2012, Dr. Chehroudi's Invited Review article on Liquid Rocket Engines (LRE) has been published in the online section of the International Journal of Aerospace Engineering. 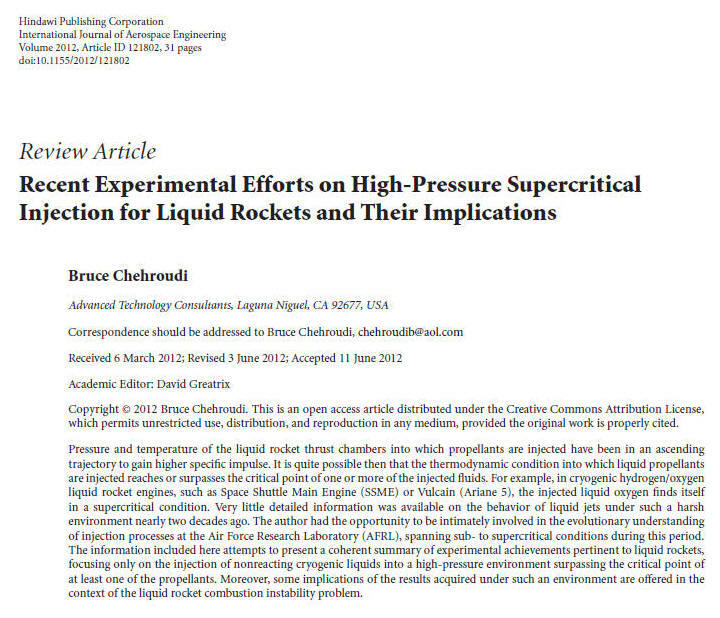 This short review article entitled "Recent Experimental Efforts on High-Pressure Supercritical Injection for Liquid Rockets and Their Implications". 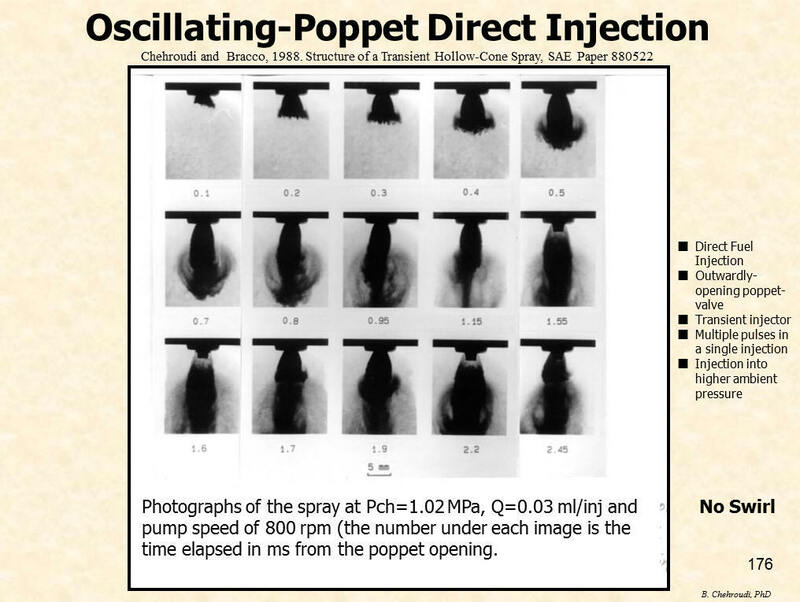 Dr. Chehroudi started working on this large-Reynolds-number jet injection program under high-pressure supercritical condition in or about 1998, when most researchers were experimenting with droplet injection under high-pressure environment. His vision from the outset was to conduct a research that not only provides fundamental physical understanding of the problem but also offers valuable information for design engineers and CFD code writers. Leading this research, Dr. Chehroudi essentially replicated his already-established creativity and innovation in design of experiment and research to provide high-quality and award-winning information which stood the test of time and was later reconfirmed by others. For example, for the first time in the literature, he clearly and quantitatively demonstrated that supercritical circular jets grow similar to incompressible but variable-density shear layers. His ground-breaking physical model published later was the first and the only one in the literature spanning from subcritical to supercritical conditions. He also was the first to use fractal analysis for supercritical shear layers showing that fractal dimensions of the supercritical jets was within the same range of values as gaseous jets. Hence, although liquid phase is being injected at the injector exit plane (subcritical injector exit temperature), the growth rate is similar to gaseous jets. Having liquid rocket combustion instability in mind, he then investigated interaction of acoustic waves and jets under both subcritical and supercritical conditions, providing initial insight into differences in response of such jets. He extended his work into coaxial jets similar to the ones used in space shuttle main engine (SSME) and Ariane engine. His technical leadership and guidance in coaxial jets under sub- and supercritical conditions resulted in his team providing valuable and one-of-the-kind information as to the nature of these jets and how they enhance mixing. 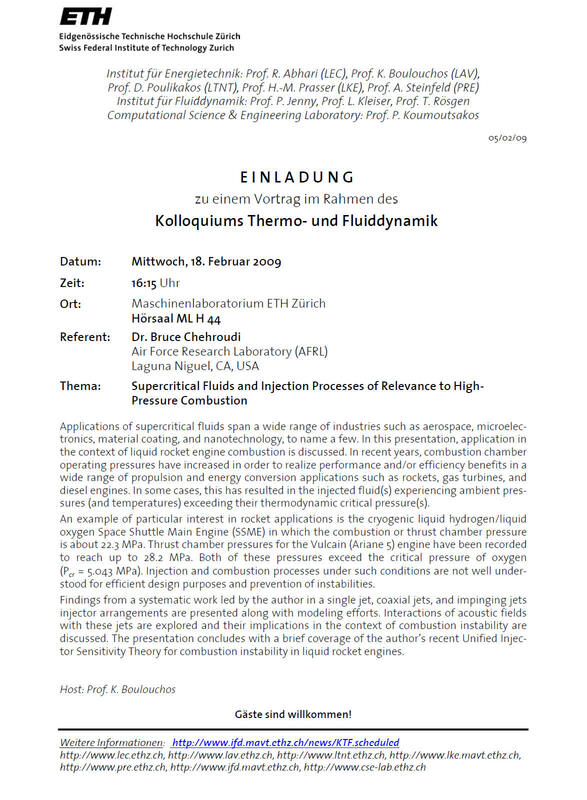 This work evolved into investigation of acoustic wave and coaxial jet interactions providing penetrating and enlightening explanation of some of the key design and operational practices engineers have been using for liquid rocket injector designs for combustion stability. He later published his Unified Injector Sensitivity Theory,attempting to link results from (single-, coaxial-, and impinging-) jets, subscale rockets, and full-scale production rockets in a coherent and innovative manner. The theory is supported by the a majority of relevant and available data in the literature. This review article essentially presents highlights of his more than ten years of award-winning technical leadership. He is pleased to acknowledge all members of his team, including creative technicians and those who provided financial and human resources and trusted, as well as believed in, his vision and physical intuition. The following is the table of content and abstract of the work. Pressure and temperature of the liquid rocket thrust chambers into which propellants are injected have been in an ascending trajectory to gain higher specific impulse. It is quite possible then that the thermodynamic condition into which liquid propellants are injected reaches or surpasses the critical point of one or more of the injected fluids. 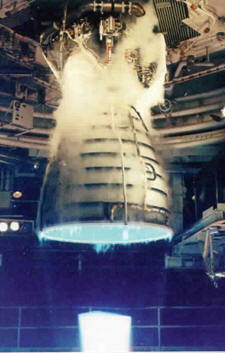 For example, in cryogenic hydrogen/oxygen liquid rocket engines, such as Space Shuttle main engine (SSME) or Vulcain (Ariane 5), the injected liquid oxygen finds itself in a supercritical condition. Very little detailed information was available on the behavior of liquid jets under such a harsh environment nearly two decades ago. 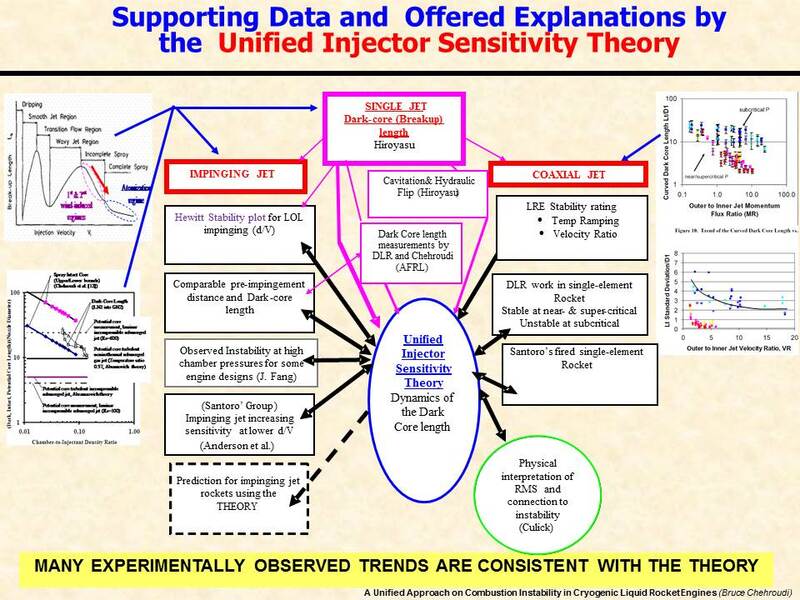 The author had the opportunity to be intimately involved in the evolutionary understanding of injection processes at the Air Force Research Laboratory (AFRL), spanning sub- to super-critical conditions during this period. The information included here attempts to present a coherent summary of experimental achievements pertinent to liquid rockets, focusing only on the injection of nonreacting cryogenic liquids into a high pressure environment surpassing the critical point of at least one of the propellants. Moreover, some implications of the results acquired under such an environment are offered in the context of the liquid rocket combustion instability problem. On June, 2012, Ms. Hooshmand was interviewed by the Business TV. On May 24, 2012, Dr. Chehroudi has presented the latest results from his patented On-Demand Volumetrically_Distributed of Autoignition using Single Walled CarbonNanotubes (SWCNTs) at the FEV Inc, North American Technical Center, 4554 Glenmeade Lane, Auburn Hills, MI 48326-1766. Dr. Chehroudi met with Dr. Marek Tatur, Director of Operation, and Dr. Dean Tomazic, Vice President of Engine Performance and Emission Division to discuss possible opportunities for joint venture on ideas presented by Dr. Chehroudi and their applications in HCCI engines. On May 21, 2012, Dr. Chehroudi has delivered a 3-day seminar on Understanding Combustion and Emission for Engineers at the SAE office in Troy, Michigan. This seminar is specially tailored for engineers and is one of the most popular seminars ever introduced by the SAE nearly 15 years ago. The seminar is continually updated to serve the need of the professional engine design engineers, engine calibrators, researchers, and educators. The attendees are generally from a very broad range of backgrounds which provides a unique and rich environment where networking and exciting discussions take place. 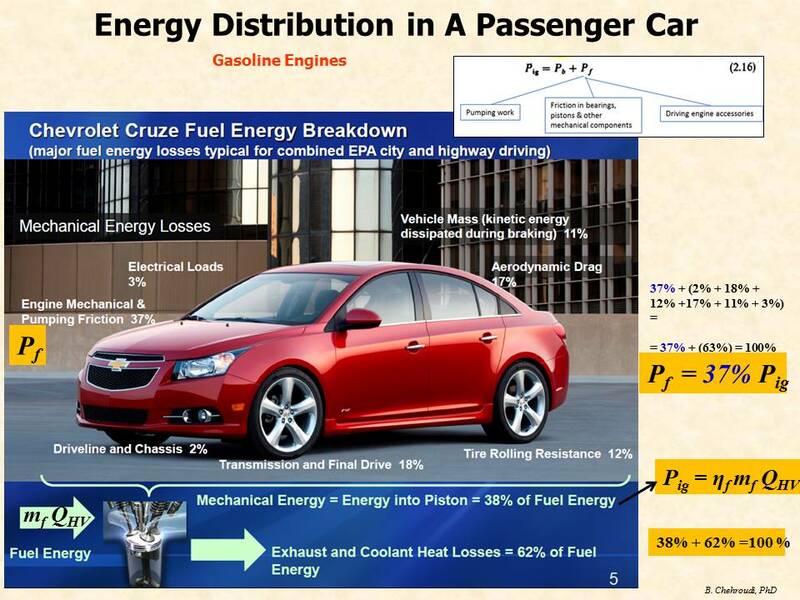 –Physical meaning of "specific heat"
On May 15, 2012, Dr. Chehroudi has delivered an invited 3-day seminar on Combustion and Emission of Pollutants at Intertek Carnot Emission Services, San Antonio, Texas. The seminar was specially tailored to current needs of the corporation in building a solid foundation in applied combustion and its applications in internal combustion engines. In particular, the interest was in formation of pollutants and ways and means such species can be controlled either through innovative in-cylinder measures or aftertreatment of engine-out emission of such pollutants. 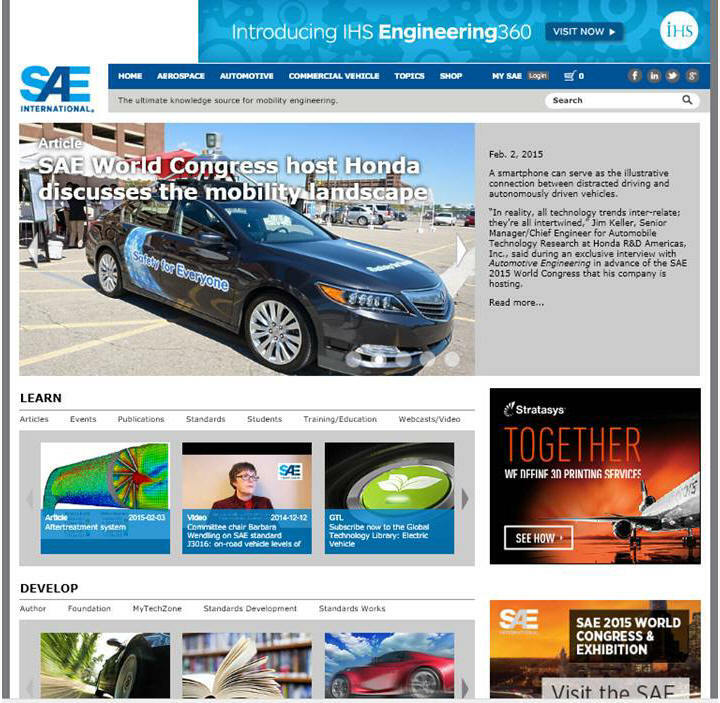 On April 23, 2012, Dr. Chehroudi has delivered a 3-day seminar on Gasoline Direct Injection at the SAE International Conference and Exhibit in Detroit, Michigan. This is a new seminar he introduced in 2010 and has become a very popular amongst R&D/application engineers, researchers, technical managers, regulators, and policy makers. On April 16-18, 2012, Dr. Chehroudi has presented his perspective and experiences on Management of Research and Development teams and organizations in Portland, Oregon. The program was sponsored by American Society of Mechanical Engineering (ASME). This course will explain how managing an R&D organization is largely the art of integrating the efforts of diverse, creative, intelligent, and independent individuals. It will offer a concise, yet effective, overview of the management issues and their solutions. The ideas presented in this course consist of the work of a multitude of experts and focuses on ways to improve the productivity of R&D. It is designed to bring the attendees to a stage where they can apply this information and to foster excellence and innovation in their R&D organization. Dr. Chehroudi has attended, and chaired a session, at the 59th Aerospace Sciences Meeting, American Institute of Aeronautics and Astronautics (AIAA), January 9-12, 2012, in Nashville, Tennessee, USA. He has chaired a session on Liquid Rocket Propulsion on Thursday, January 12, 2012. In this session, recent R&D works pertaining to experimental and computational aspects of liquid rocket engines are discussed. Participants were from Air Force Research Lab, Georgia Institute of Technology, Air Force Institute of Technology, INSA Rouen, Saint-Étienne-du-Rouvray, France, University of the German Federal Armed Forces, Munich, Germany, Japan Aerospace Exploration Agency (JAXA), Chofu, Japan. For more details see http://www.aiaa.org/content.cfm?pageid=230&lumeetingid=1964or http://www.aiaa.org/events/asm/ASM%202012%20Event%20Preview.pdf or Download the program at http://aiaa-masm12.abstractcentral.com/societyimages/aiaa-masm12/AIAA-MASM12_Program_Matrix_NEW.pdf. As a member of the AIAA Propellant & Combustion Technical Committee, Dr. Chehroudi attended the committee meeting on January 9, 2012 in which discussed issues pertaining to technical publications, continuing education, organizing the technical sessions in AIAA conferences, best paper awards, and technical liaison-ship (on air breathing propulsion systems, gas turbine engines, solid/liquid rockets, high-speed air breathing propulsion, and standards on CFD) were discussed and decisions made. Dr. Chehroudi attended the Seventh Annual Livingston Nanotechnology Conference, Manhattan, NY, December 7, 2011. In this conference he discussed some of his ideas to enhance innovation in applications of nanotechnology to automotive and aerospace industries and how to modify current and next generation of undergraduate education incorporating knowledge accumulated in nanoscience and nanotechnology. An Invited Review article by Dr. Chehroudi on use of nanostructured materials (specifically carbon nanotubes and graphene) for what he named as "light-activated volumetrically-distributed ignition" has been published at the Recent Patents on Space Technology Journal. This article presents details of a program Dr. Chehroudi started from its initial idea generation phase to feasibility and to full fledged multi-year program formation stage funded by the Air Force Office of Scientific Research. The discovery that a nanostructured material behaves differently than the bulk material opened the door to many exciting opportunities. One such opportunity is the observed ignition of single-walled carbon nanotubes (SWCNTs) with a camera flash. In this paper, results from distributed ignition of fuels with SWCNTs are presented which motivated further investigation of dry SWCNT samples. Consequently, a major part of the paper focuses on ignition characteristics of SWCNTs with an ordinary camera flash. A preliminary result from graphene sheets is also presented. The primary objective of this work is to use nanostructured materials as means for distributed ignition and combustion improvement in propulsion applications. Examples are homogeneous-charged compression ignition (HCCI) engines, liquid rocket fuel sprays, and enhanced flame stabilization in gas turbine engines. The idea was originally proposed by the author in April 2003 and the first patent filed in July 2004 after initial investigations. Based on tests conducted so far, this new ignition method is considered as a potential enabling technology for volumetric and distributed ignition of liquid fuel sprays and gaseous fuel-air mixtures with the lowest incident power intensity possible. This means remote and spatial ignition within any desired region defined by the shape of the light from a pulsed light source. In this paper, effects of incident pulsed-light exposure duration and wavelength between 350-1500 nm on minimum ignition energy (MIE), effects of sample physical compression (i.e., packing) on ignition characteristics, and the impact of iron (Fe) nanoparticle content in dry (no fuel) SWCNTs samples are presented. Initial measurements of the sound pressure level (SPL) from the photoacoustic phenomenon as well as ignition of graphene oxide are also presented. It appears that the wavelength of the illumination source does not play an important role as compared to the flash duration, at least within the range studied here. Data suggests that a lower energy-per-pulse is needed to initiate ignition when a shorter flash pulse duration is used. For example, only 30-35 mJ/pulse is required at pulse width of ~0.2ms to initiate ignition of the as-produced fluffy samples in standard air, whereas at 7ms duration, it needs 80-90 mJ/pulse . For lightly-compressed samples, MIE trend remains unchanged and similar to that of the as-produced batches; otherwise, it increases with the level of the compression. Samples with Fe (metallic nanoparticle) content as low as 18% by weight can be ignited in air with a camera flash. Averaged intensities between 10 to 150 W/cm2 are required for distributed ignition of SWCNTs. This is a factor of 80 less than cases where lasers (pulsed or cw) are used in coal particles. However, graphene oxide required much higher input energy, a disadvantage to keep in mind in applications. On November 14-16, 2011, Dr. Chehroudi has presented his perspective and experiences on management of research and development teams and organizations in Orlando, Florida. The program was sponsored by American Society of Mechanical Engineering (ASME). On October 13, 2011, Dr. Chehroudi has been invited to Volkswagen facility in Puebla, Mexico to present a work on the future of combustion engines. His work was on an innovative idea to control autoignition in HCCI engines using his Patented light-activated distributed ignition technology. The title of the presentation was "Forget Spark Plugs, Run Your Engines with Carbon Nanotubes". Attendees were director of the product development, design engineers, and other senior managers. 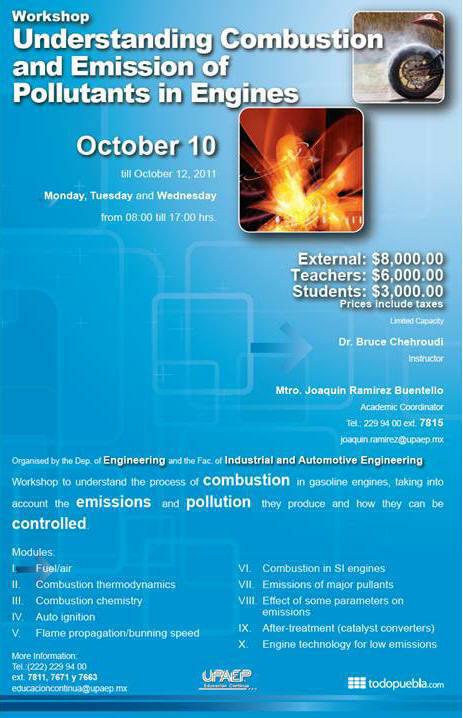 On October 12, 2011, Dr. Chehroudi presented a three-day invited seminar at a workshop jointly organized by the Department of Industrial and Automotive Engineering of the Universidad Popular Autónoma del Estado de Puebla (UPAEP) and Volkswagen in Puebla, Mexico. Attendees were from variety of industries. Topics were focused on understanding combustion and emission of harmful and regulated pollutants as well as conventional and advanced technologies to simultaneously improve fuel economy and reduce environmental pollutants from engines. Dr. Chehroudi was also interviewed by the Director of Engineering at VW probing into current research and future trends in engine design for high efficiency and minimal adverse environmental impacts. The discovery that nanostructured materials behave differently than their bulk materials opened the door to many exciting opportunities. One such opportunity is the observed ignition of single-walled carbon nanotubes (SWCNTs) with a camera flash. Here, ignition characteristics of SWCNTs with an ordinary camera flash is presented. The primary objective of this work is to use nanostructured materials as means for distributed ignition and improved combustion in propulsion applications. Examples are homogeneous-charged compression ignition (HCCI) engines, liquid rocket fuel sprays, and enhanced flame stabilization in gas turbine engines. The idea was originally proposed by the author in April 2003 and the first patent filed in July 2004 after initial investigations. Based on these and additional tests, this new ignition method is now considered as a potential enabling technology for volumetric and distributed ignition of liquid fuel sprays or gaseous fuel-air mixtures with the lowest incident power intensity possible. This means remote and spatial ignition within any desired region defined by the shape of the light from a pulsed light source. Averaged intensities between 10 to 150 W/cm2 are required for ignition of SWCNTs. This is a factor of 80 less than cases where lasers (pulsed and cw) are used in coal particles. 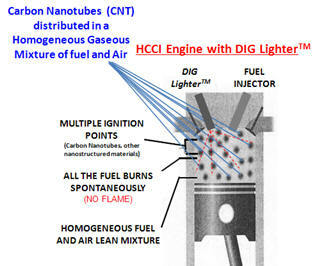 Results by others, acquired in a premixed gaseous fuel-air mixture in a cylindrical combustion chamber, comparing a spark plug with the light-activated distributed ignition of SWCNTs, confirmed the patented concept and showed on-demand activation of the autoignition for HCCI engine applications. Faster burn rate reaching up to a factor of 3 has been shown for distributed ignition under lean mixture as compared with conventional spark ignition. 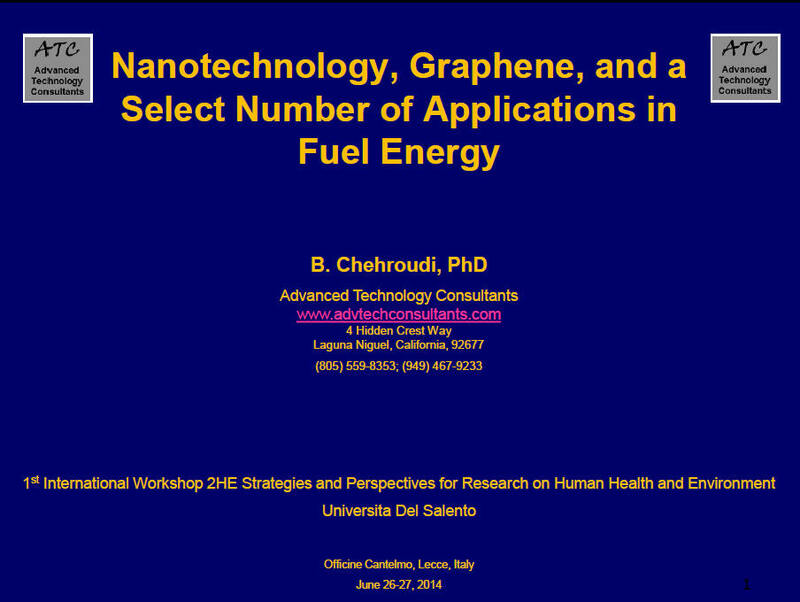 On August 25, 2011, Dr. Chehroudi delivered a presentation at Chrysler Technology Center, Auburn Hills, Michigan, on applications of nanotechnology in automotive industry for distributed ignition based on his two patents. Subsequent to the presentation there were discussions on how an engine prototype can be tested with this groundbreaking ignition technology. On August 22, 2011, Dr. Chehroudi has delivered a 3-day seminar on Gasoline Direct Injection at the SAE office in Troy, Michigan. This is a new seminar he introduced in 2010 and has become a very popular with R&D/application engineers, researchers, technical managers, regulators, and policy makers. On July 18, 2011, Dr. Chehroudi has conducted a 3-day seminar on combustion and emission of pollutants in engines at the SAE office in Troy, Michigan. Attendees were from the following corporations: Dresser-Rand, Petrobras, Navistar, Hatci, Denso International, BRP Inc, Ford Motor Co de Mexico, Honda R&D Americas Inc, Continental, Chrysler Group LLC, and Kohler Co. He also held several consulting meetings on July 21 with some of his clients in Detroit area. On July 13, 2011, Dr. Chehroudi has been amongst a select few who attended a special "Lunch with CEO" event held in honor of Mr. Sergio Marchionne, CEO, Fiat S.P.A. and Chrysler Group LLC at the Swiss-American Chamber of Commerce (SACC) in Zurich. After the lunch, Mr. Marchionne delivered an inspiring speech titled "Leadership and Change as a Fast Track to Growth" sharing with audiences his journey and experiences in rescuing Chrysler from liquidation. His strategy and vision for the future are quite impressive and pave the way to even more stellar achievements by the companies he is leading as the Chief Executive Officer. Dr. Chehroudi had the honor of meeting Mr. Marchionne face to face, shake his hand, and explain to him his portfolio of activities particularly in automotive industry. Specifically, he explained his ground-breaking idea on a patented light-activated distributed ignition using a synergy between nanotechnology, optics, and chemical reactions. He also submitted an executive summary for a business plan and a roadmap for possible joint venture with Mr. Marchionne's group. Towards the end, Mr. Marchionne was given a special gift from the SACC, see the picture below and also at the following link: http://www.amcham.ch/events/content/110713_fiat_500_amcham.pdf . Liquid rocket engines burn propellants, which undergo chemical reactions to convert the stored chemical energy into thermal energy. A liquid propellant can be an “oxidizer” (e.g., liquid oxygen (LOX)), a “fuel” (e.g., kerosene or hydrogen), or a “monopropellant” (e.g., hydrogen peroxide or hydrazine). The latter can be thought of as a combination of a fuel and an oxidizer. In a “bipropellant” engine, two different liquid propellants (oxidizer and fuel) are stored separately and, when needed, are injected into the thrust chamber. In a “monopropellant” engine, a single propellant releases energy without needing to be mixed with another propellant. This often happens in presence of a catalyst. “Cryogenic” propellants require very low temperatures to be stored in the liquid form. For example, at atmospheric pressure hydrogen becomes a liquid at −252 ◦C and oxygen becomes a liquid at−183 ◦C. Insulation and venting of storage tanks are important in this case. “Earth storable propellants” refer to propellants that can be stored in the liquid form at room temperature for an extended period of time. Similarly, “space storable propellants” are those that can be stored in the liquid form in space. Ammonia is an example. Tables 1 and 2 show commonly used propellants and their applications in different rockets. More information can be found clicking on the image. Dr. Chehroudi's proposed theory of combustion instability in cryogenic liquid rocket engine has been published in a AIAA Journal of Propulsion and Power under the title of "Physical Hypothesis for the Combustion Instability in Cryogenic Liquid Rocket Engines". The work is culmination of more than 10 years of R&D and intellectual wrestling with the long-lasting problem led by Dr. Chehroudi and his coworkers. In this paper, he offers a fresh and new perspective, paving the way towards a better understanding of this technologically-complex problem. 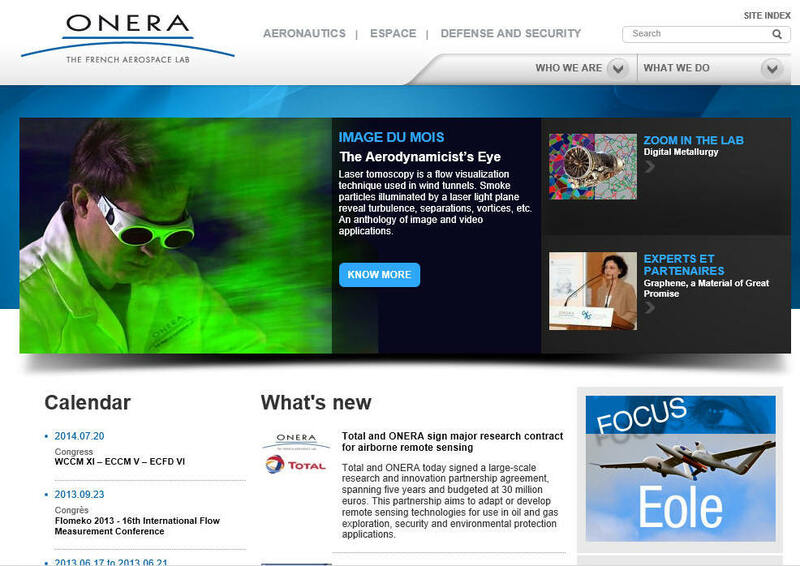 For detailed information refer to the following link:http://pdf.aiaa.org/preview/CDReadyMASM09_1811/PV2009_237.pdf. In this work, the author would like to portray a sketch of a fluid dynamical picture to describe the coupling nature/strength between the chamber acoustics and the injectors. This new perspective is achieved through a physically intuitive argument combined with previously published test results for two popular injector designs, namely, coaxial and impinging jets. For the impinging jet injectors, it is shown that the dynamic behavior of the dark-core (or breakup) zone for each jet, their lengths and thicknesses, has a profound impact on injector sensitivity to disturbances in its surrounding. This information is used to offer a possible explanation for the trends seen on the Hewitt stability plot in impinging jet injectors. 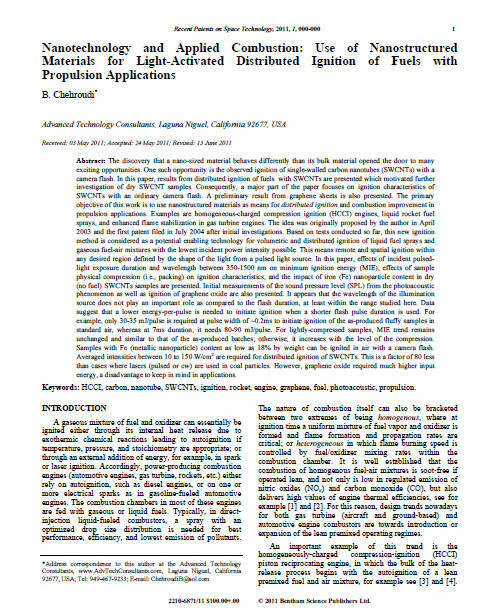 A copy of the paper can be downloaded at the following link: Physical Hypothesis for the Combustion Instability in Cryogenic Liquid Rocket Engines. 1 Chehroudi, B., Knock in SI engines, Powertrain International, Vol. 1, No. 1, p. 6, 1998. On August 6-7, 2010, Dr. Chehroudi has been an invited speaker at a workshop organized jointly by the University Svizzera Italiana (USI), the Embassy of Sweden, and the Camera Di Commercio Cantone Ticino, on Internationalization and Management of Government & Industry Joint R& D. Dr. Chehroudi presented his work on Applications of Nanostructured Materials in Propulsion Systems. A special invitation was sent by the honorable Per Thoresson, Swedish Ambassador, to a select list of participants for this workshop. Professor Maurice Campagna, from Ecomomiesuisse Science and Education (Former SVP R&T ABB), has originated the idea and steadfastly worked towards its planning and organization. The purpose of the workshop was to create a platform that allows discussions of the opportunities and tasks for project set-ups that lay ahead in specific, targeted technology fields. In addition to review the current national outlines for international project funding. This was intended to form a basis for exchanging experiences and elaborating on future scenarios and adapt current structure towards increased, efficient international collaboration. The overall aim was to reach a critical mass, despite the smallness of the countries. Also, the flaws of some approaches of European R&D funding management processes were addressed, so as to be seen and turned into opportunities. Furthermore this is a chance for bilateral discussions between leading technology centers and industry in the four important technology fields as well as between governmental agencies. Targeted joint projects and collaboration was considered as a welcomed outcome from these talks and discussions. Finally, emerging, relevant societal areas relying on technology, like security or sustainable mobility, have also informally addressed. On Dec 13-14, 2009, Dr Chehroudi was invited to a visit at the German Aerospace Center (DLR), Institute of Space Propulsion, at Lampoldshausen, Germany. During this visit he and Dr. M. Oschwald, and Dr. O. Haiden discussed areas in which series of collaborations can be materialized. Dr. Chehroudi has also presented some of his work on potential opportunity to use GARCH method in predicting combustion instability in liquid rocket engines. Also, he presented some of his recent work on supercritical combustion issues. 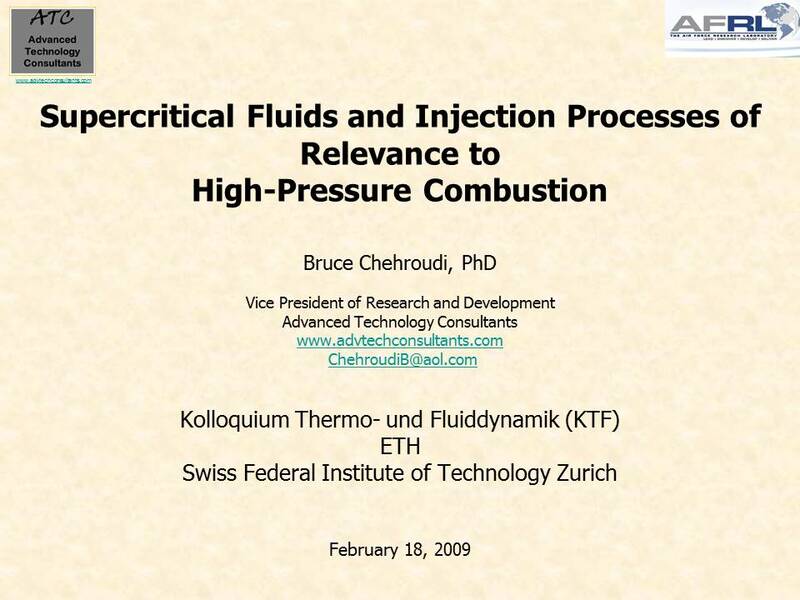 On February 18, 2009, Dr. Chehroudi was an Invited Speaker to Swiss Federal Institute of Technology Zurich (ETH) for a presentation on Supercritical Fluids and Injection Processes of Relevance to High-Pressure Combustion, Colloquium in Thermo-Fluid Dynamics (Kolloquiums Thermo- und Fluiddynamik). [(http://www.ifd.mavt.ethz.ch/events/past-events/euromech-colloquium-521.ethz_search.html, then type and search for Chehroudi) or (https://www1.ethz.ch/lav/people/fnoembri/ETHLifePrnit_feb09.pdf on page 14)], February 18, 2009. For a complete list of all speakers click on the image. 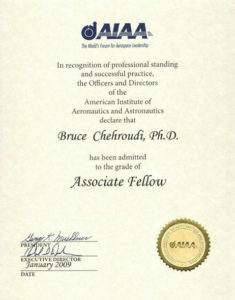 On January 2009, Dr. Chehroudi was honored by the American Institute of Aeronautics and Astronautics (AIAA) with an Associate Fellow society membership. Associate Fellows are individuals who have accomplished or been in charge of important engineering or scientific work, who have done original work of outstanding merit, or who have otherwise made outstanding contributions to the arts, sciences, or technology of aeronautics or astronautics. A candidate for this honor must have at least 12 years of professional experience, and must be a Senior Member of the Institute for at least one year from the current Associate Fellow Deadline. Self-nominations are not permitted.